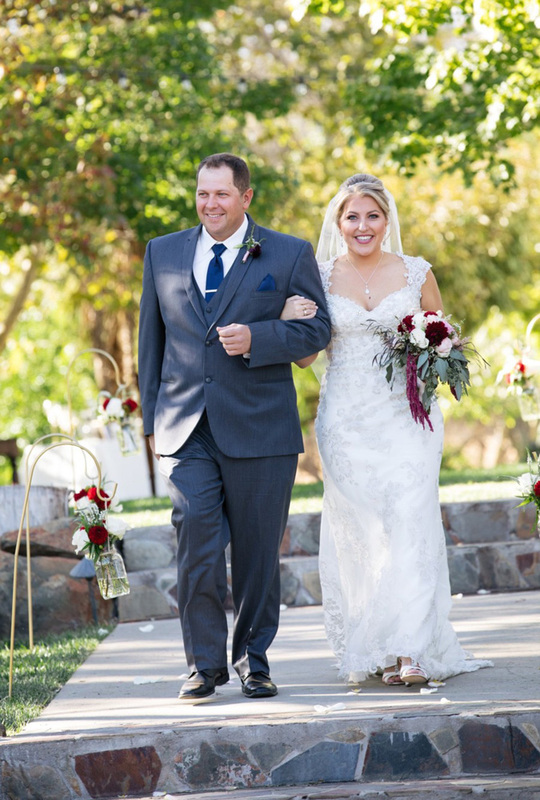 Mark says he felt “Lucky!” when he first saw Lisa on the wedding day. 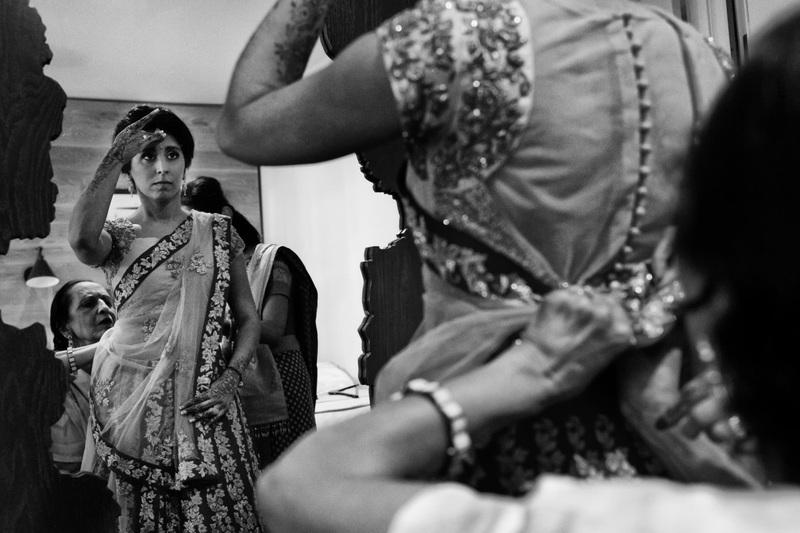 She remembers feeling giggly. 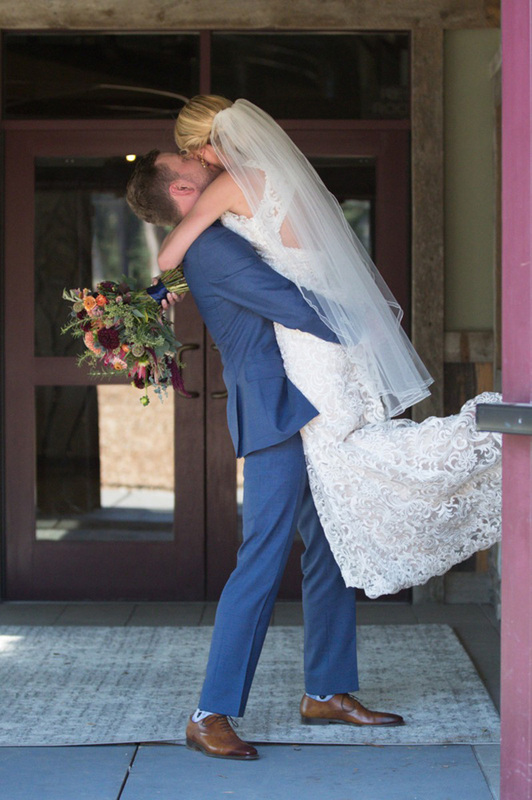 “I really love this man more every day,” she says. 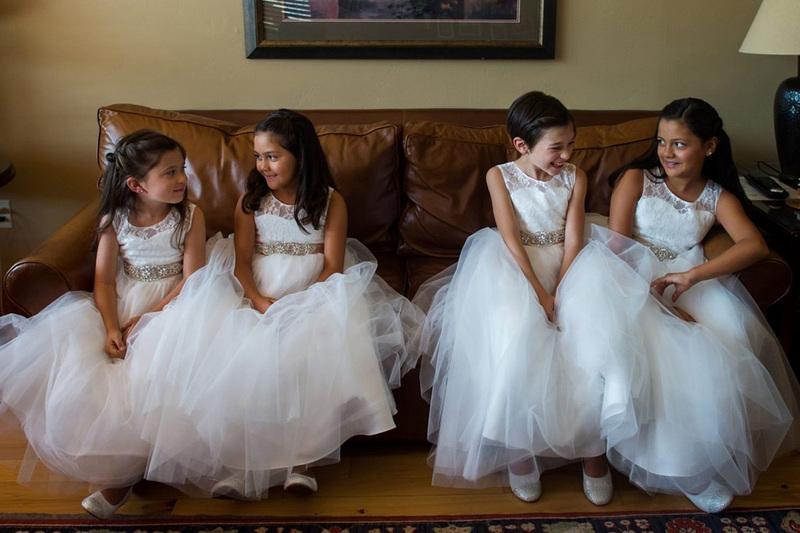 They live in Louisiana, where winters are mild. 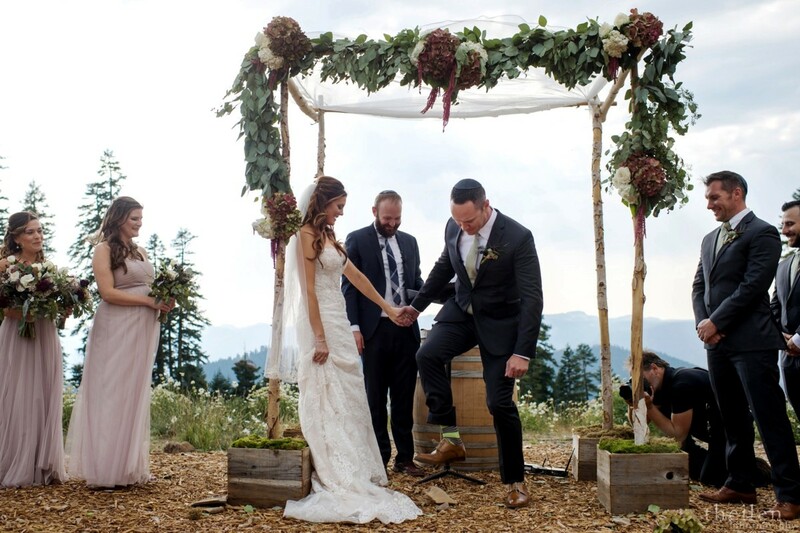 So when Lisa and Mark got engaged, they knew the Lake Tahoe area was exactly where they wanted to exchange vows. 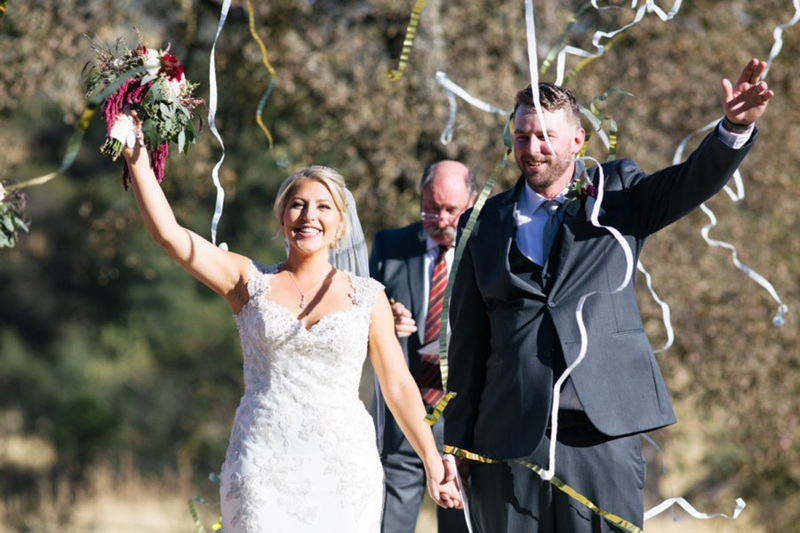 “A winter wedding seemed different,” says the bride, who grew up in Northern California. 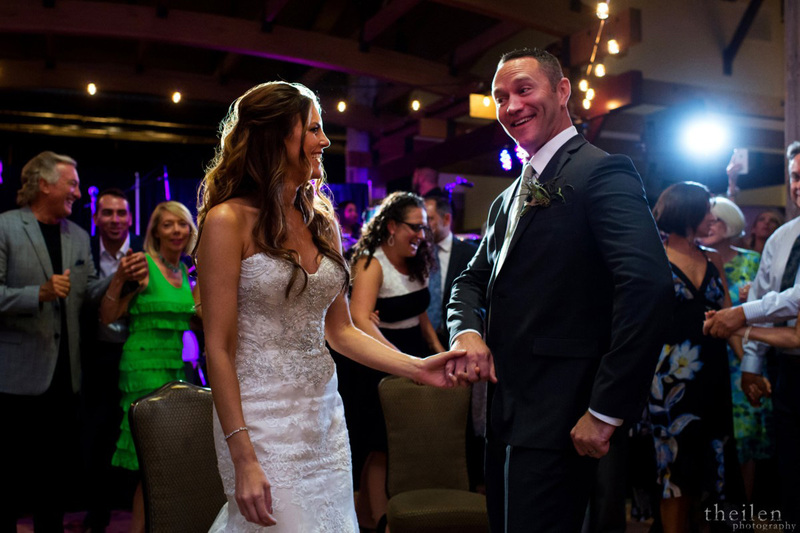 The couple dated for two years before getting engaged while they were taking their Dachshund to meet Santa Claus. 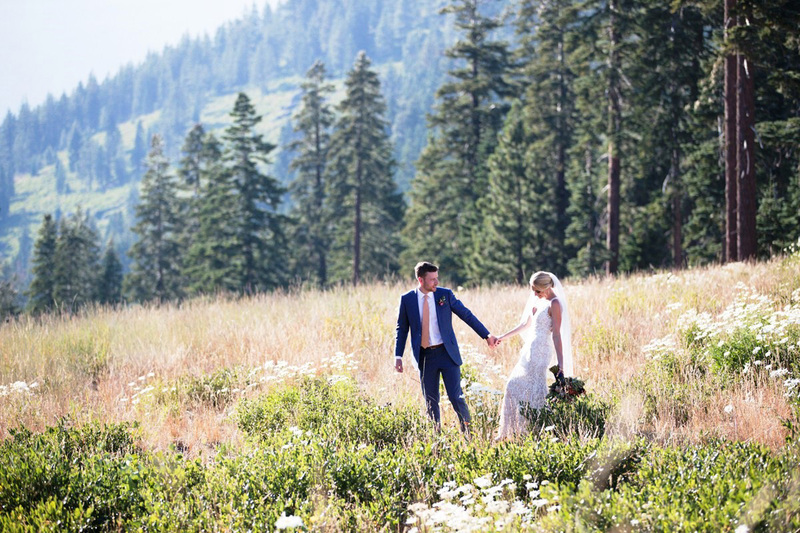 They married a year later in a winter wedding at the Resort at Squaw Creek in Olympic Valley, California. 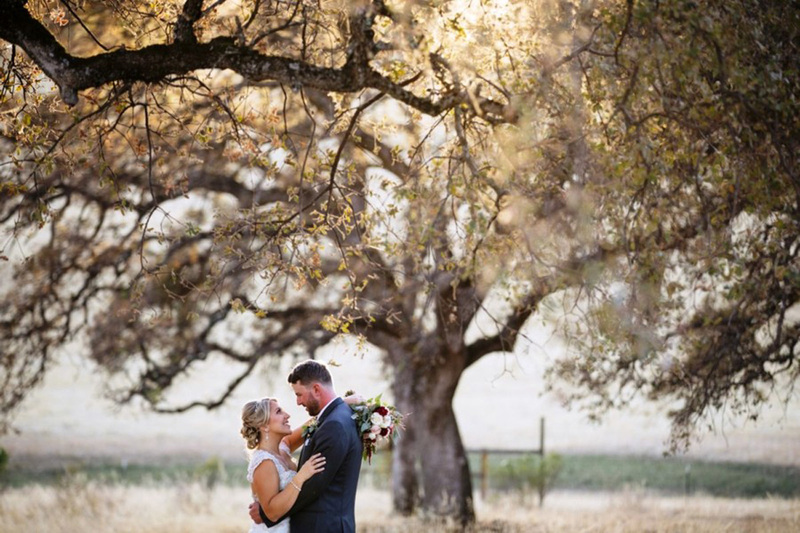 This stunning venue provided a fitting backdrop for the gorgeous couple! 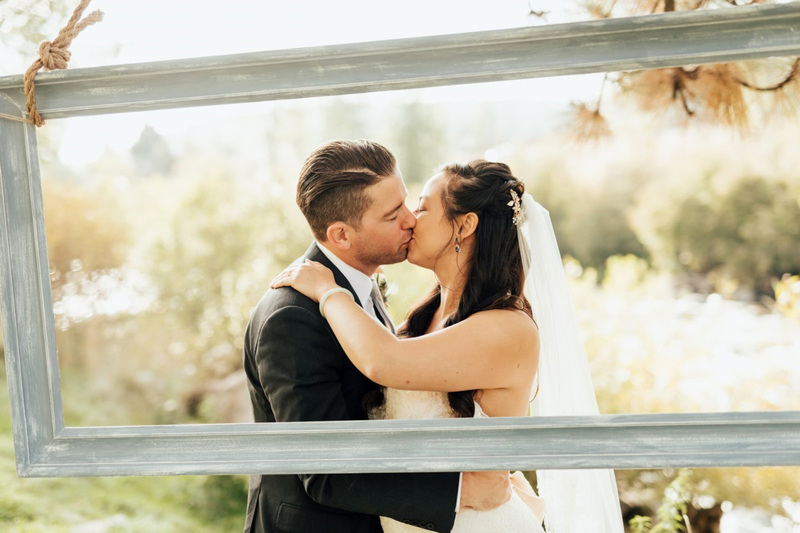 Adventure wedding photographer Charleton Churchill captured the couple and the day’s beauty. 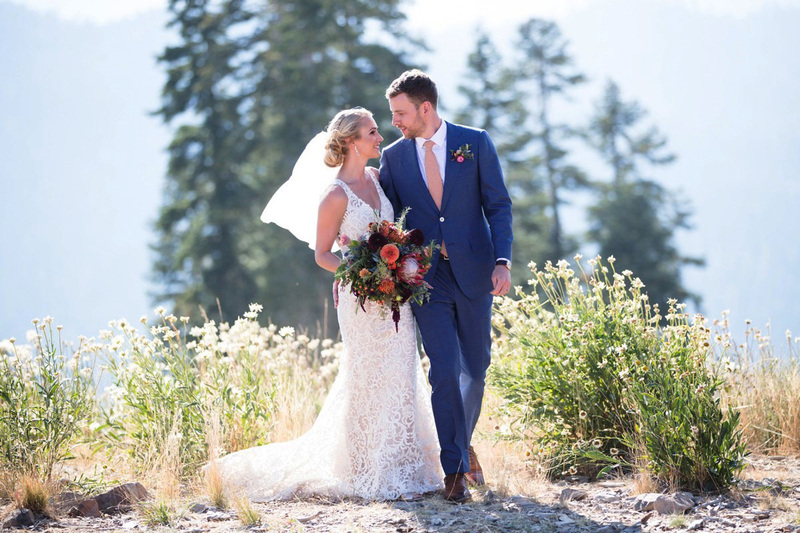 “My favorite part of Mark and Lisa’s wedding was being able to enjoy the unique winter snowcapped mountains of Lake Tahoe and Squaw Valley throughout the entirety of their wedding day,” says Churchill. 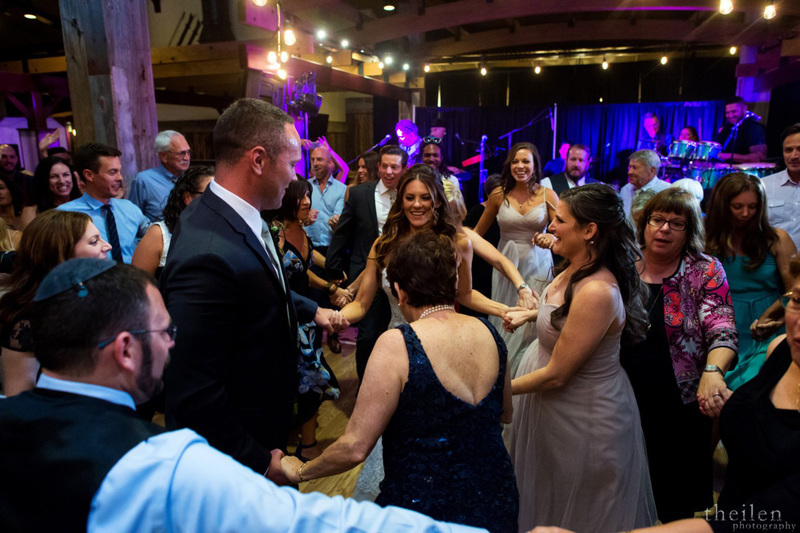 The December ceremony, which was officiated by Lisa’a father, was an intimate gathering with 57 close family and friends in attendance. 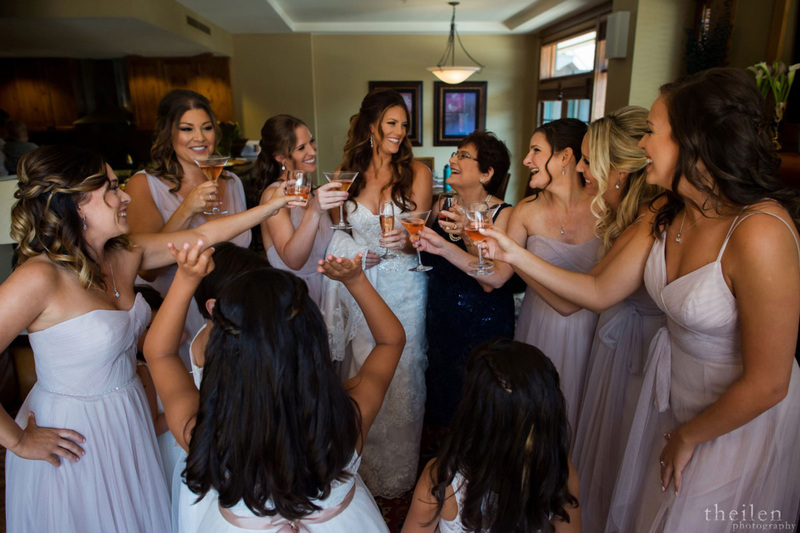 The 12-person wedding party included the bride’s sister who was the Maid of Honor, as well as her best friend who served as the Man of Honor. 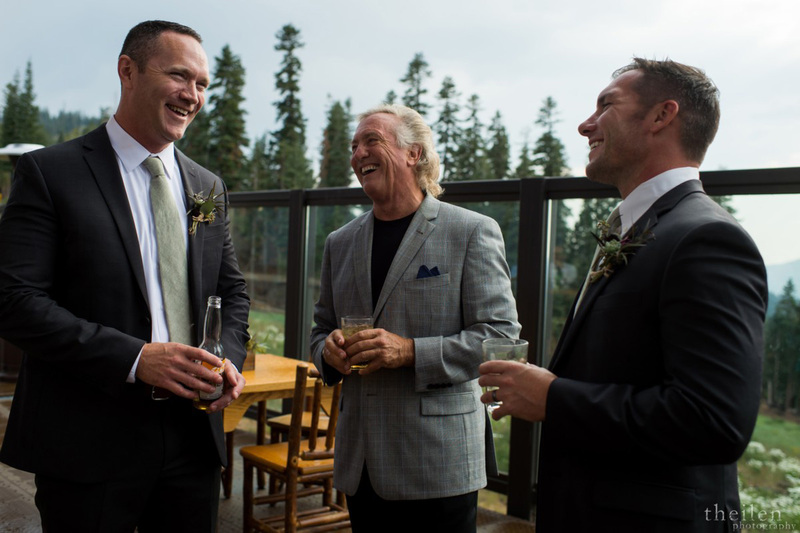 The groom’s father was his Best Man (which is a very Southern tradition). 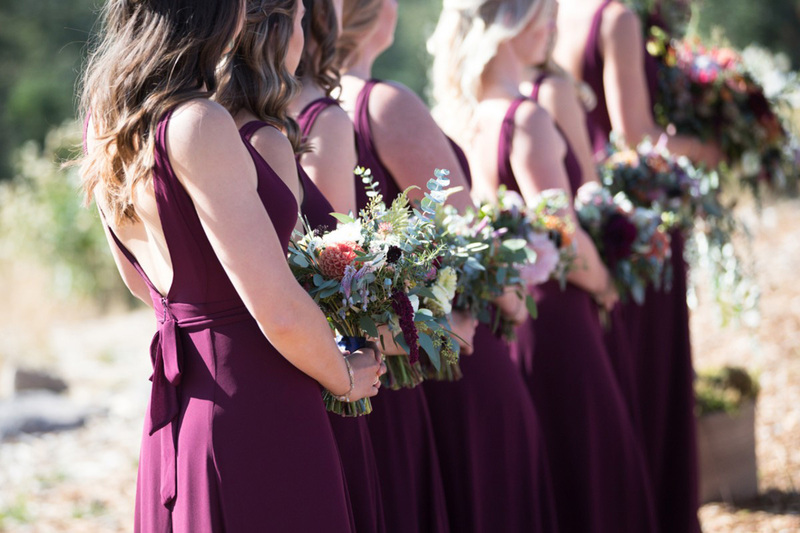 The wedding color palette of hunter green, maroon, and gold was “a natural fit for that time of year,” Lisa remarked. 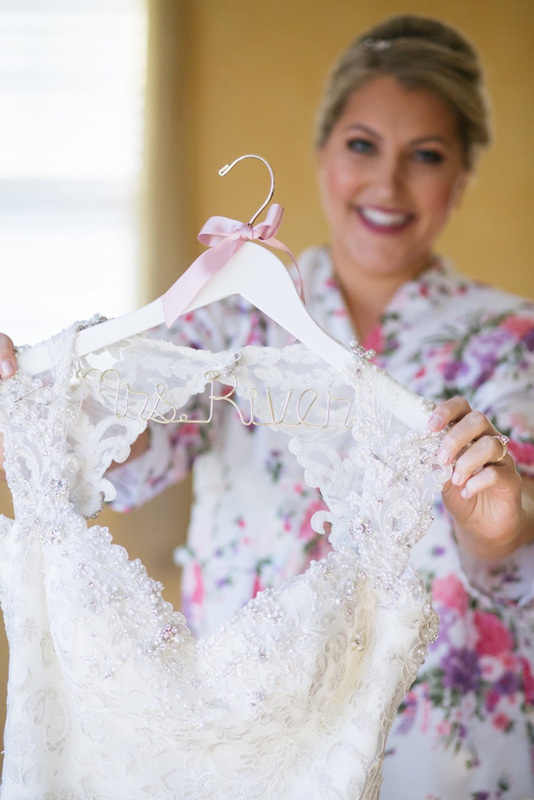 That all changed when she saw “The Dress” on a hanger and had to try it on. 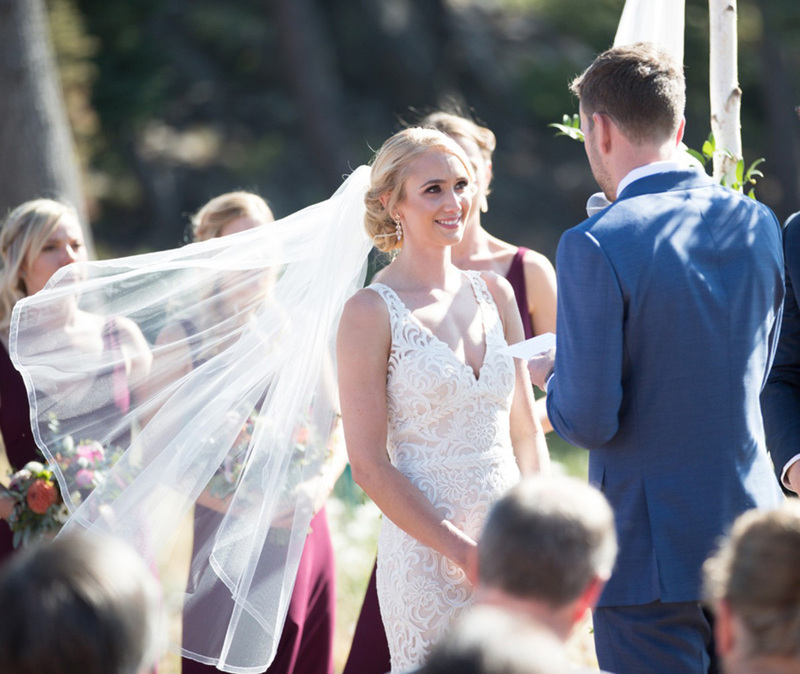 “I’ve never felt that good in a piece of clothing before,” she says, explaining the simple crepe gown had a boat neck, t-shirt like sleeves, and a cut out back. 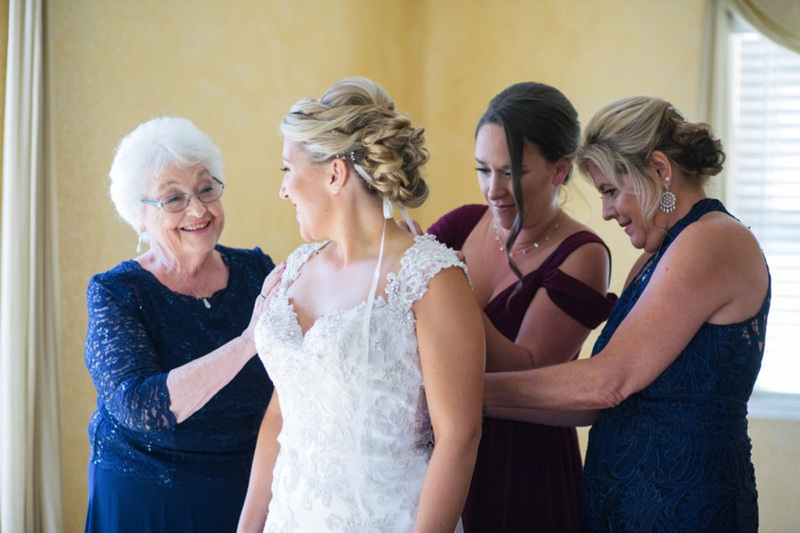 She hired a seamstress in Louisiana to take off the original sleeves and add full length sleeves. 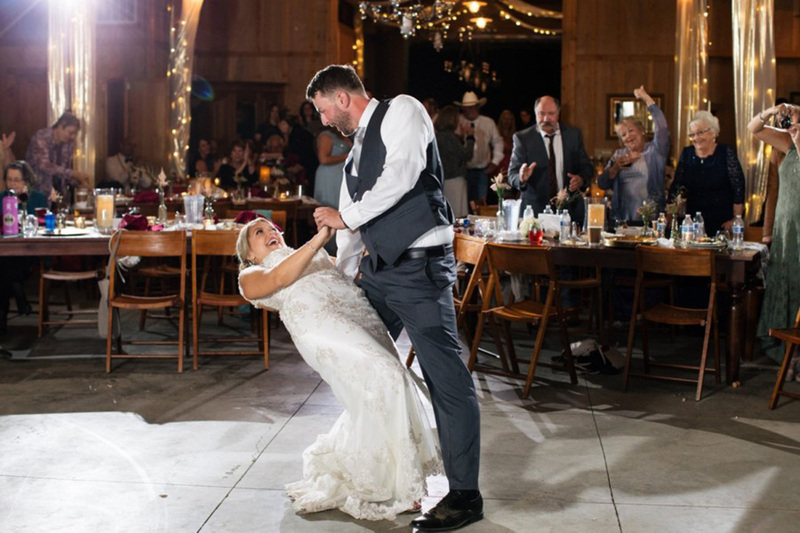 She wore a second dress, a strapless A-line, to the reception. 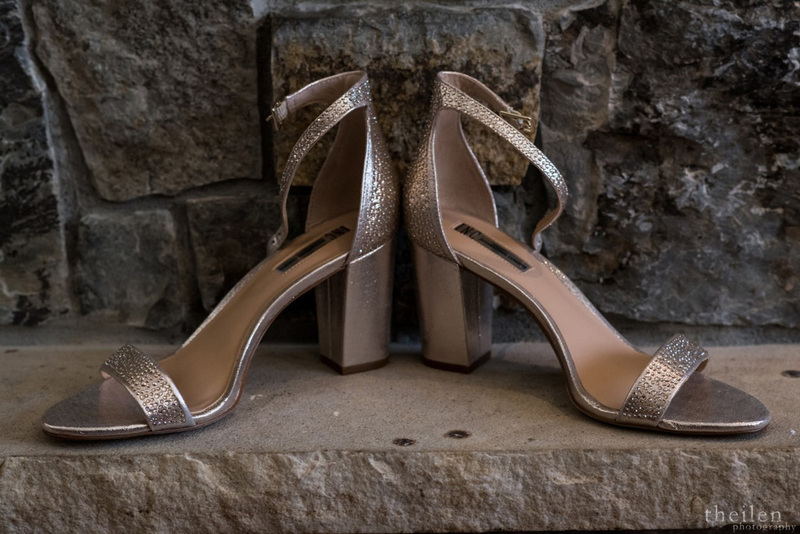 It was comfortable and easy to dance in. 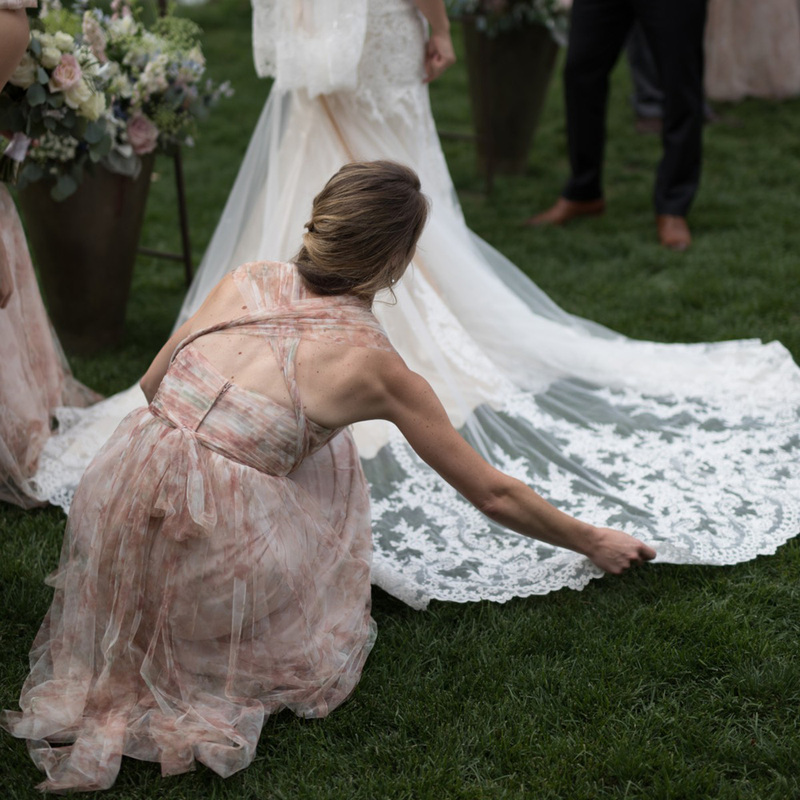 Best of all, it meant her wedding gown would stay clean for her post-wedding photo shoot. 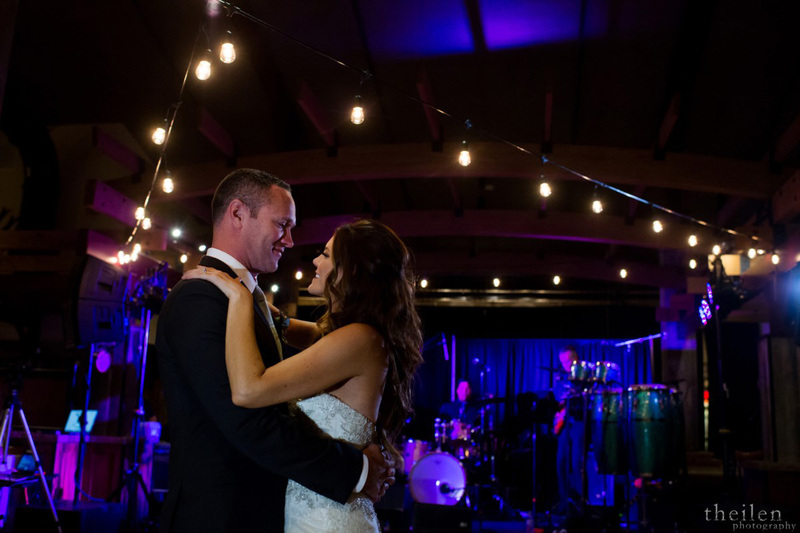 Lisa and Mark loved the beautiful resort, where they and their families were able to spend a lot of time together. 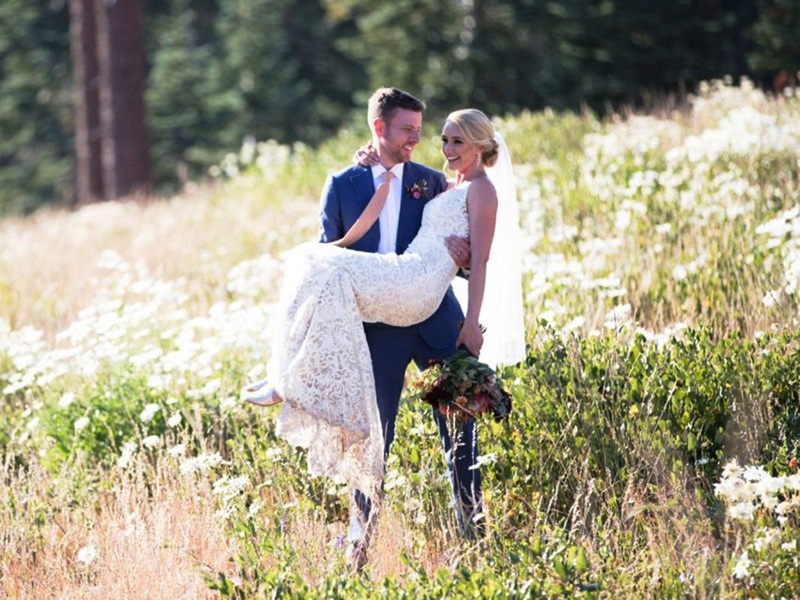 The couple stayed at the resort for a week after the wedding, a delightful setting for a mini-honeymoon. 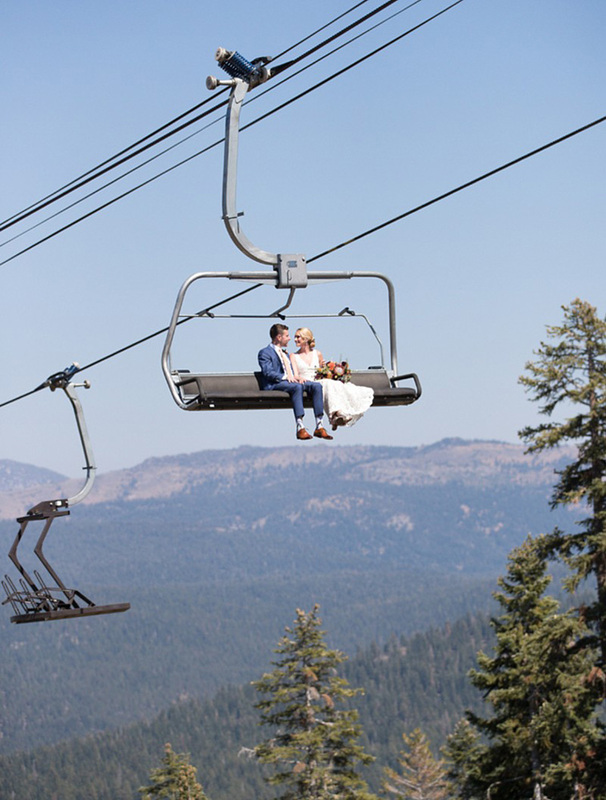 They’re still planning a big honeymoon trip. 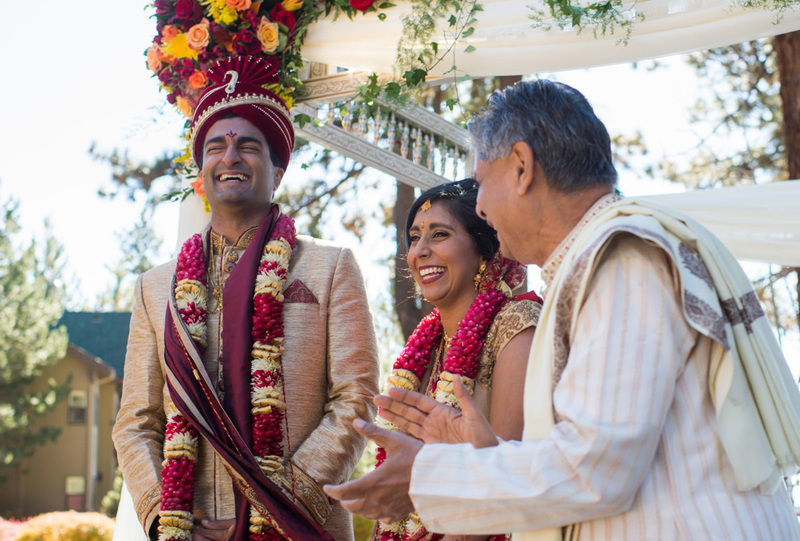 Everything about Ali and Nick’s wedding was joyfully personalized and thoughtfully fashioned. 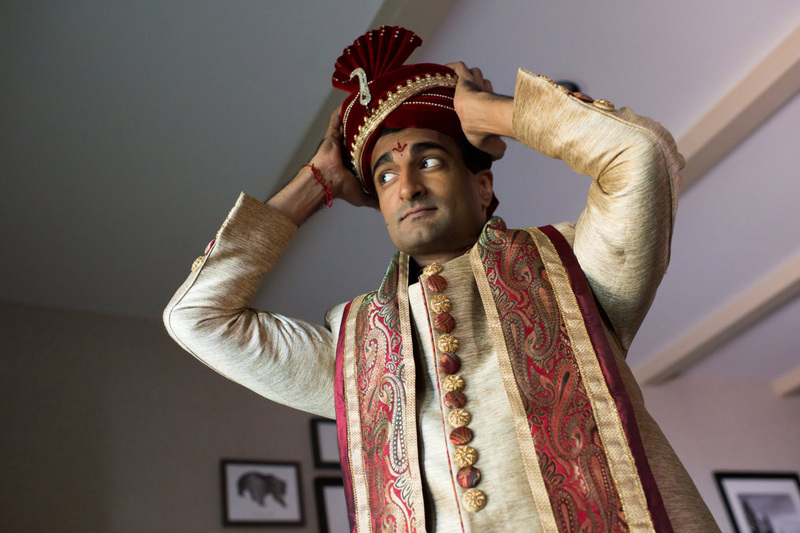 (After all, the groom is a professional jewelry designer.) 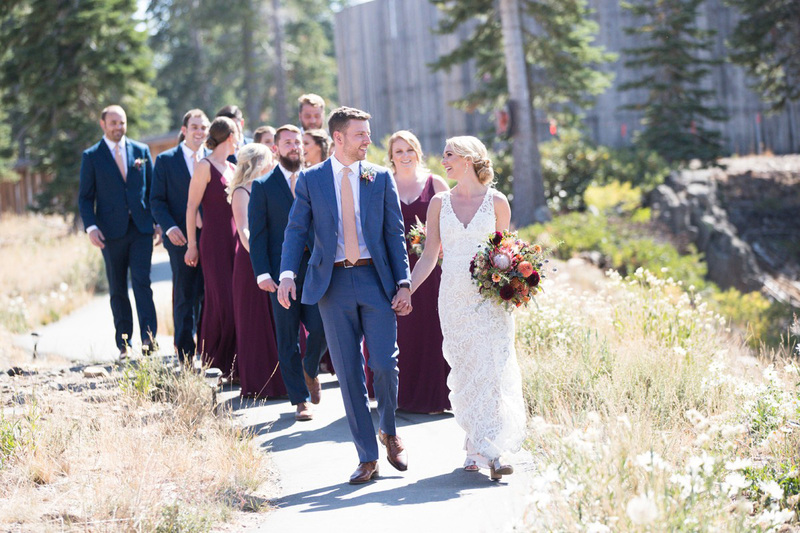 But what really mattered most to the couple was bringing their loved ones together in one place to enjoy the beauty of Tahoe. 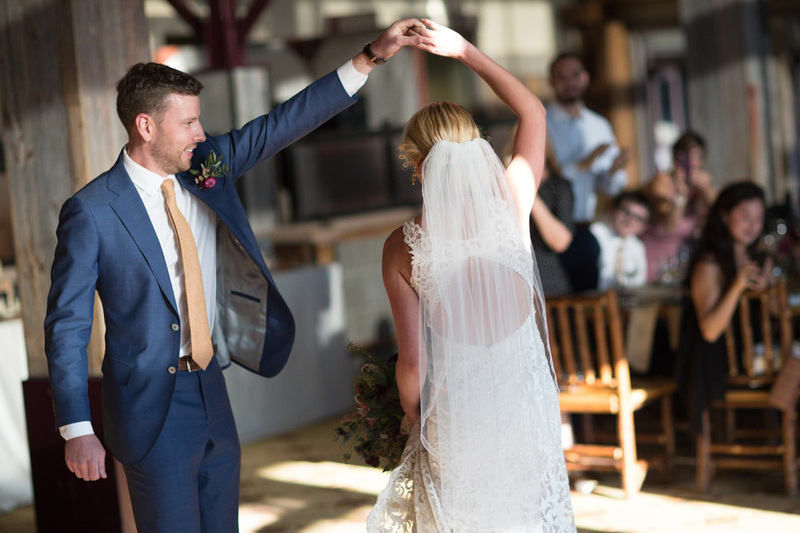 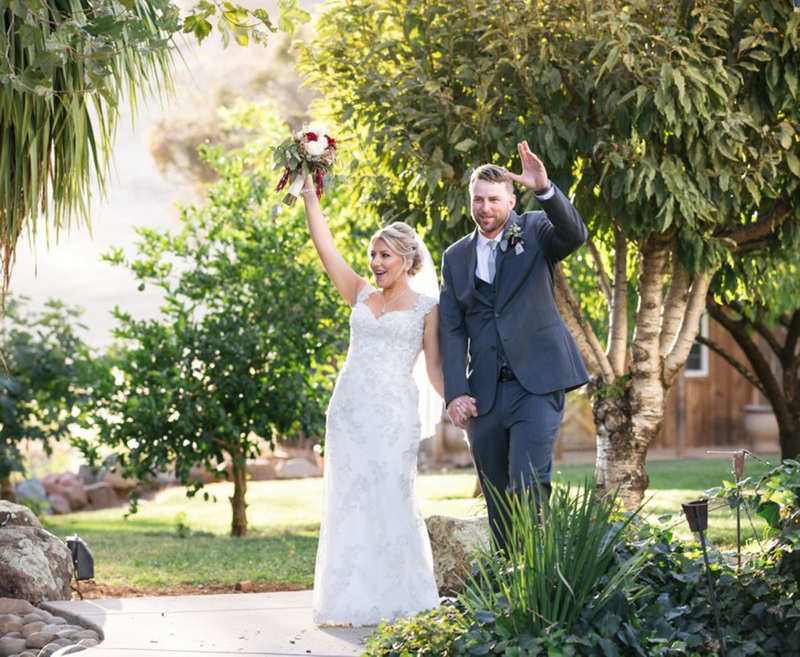 Ali and Nick loved every moment of their celebration, and it certainly shows in these photos, creatively captured by Just West Co. 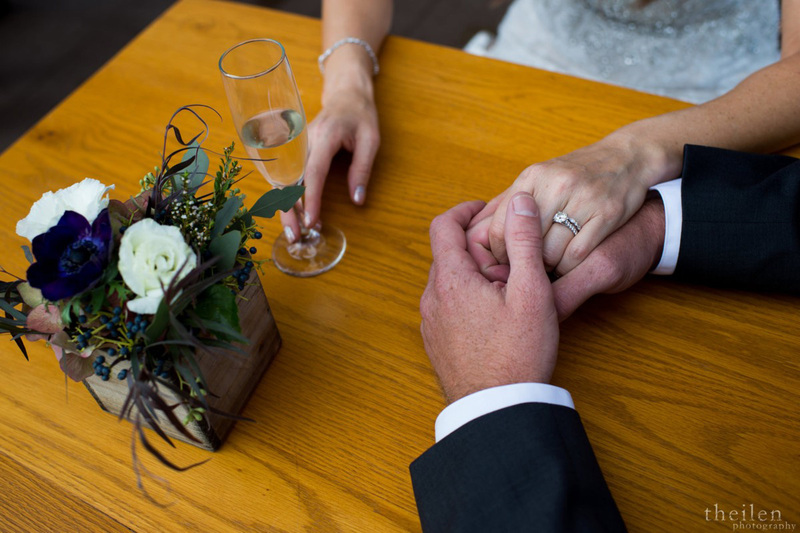 The perks of marrying a jeweler… the rings and bling. 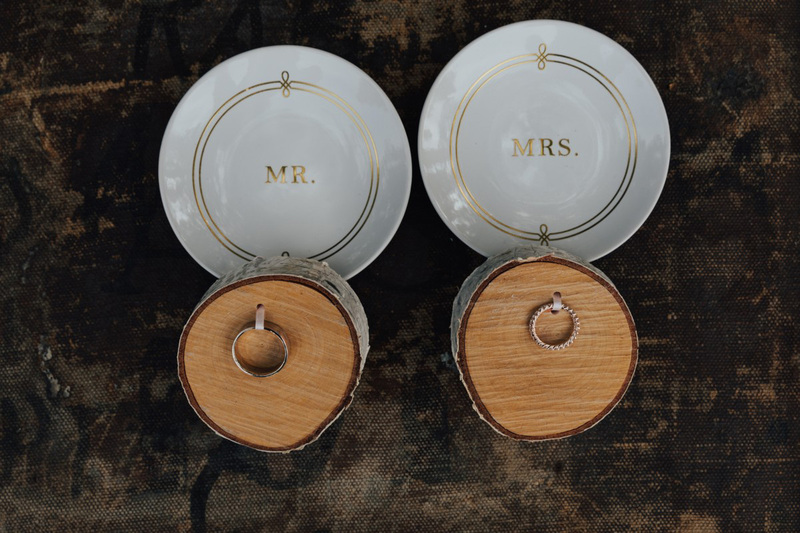 Some women plan the perfect ring and leave hints of every aspect they desire. 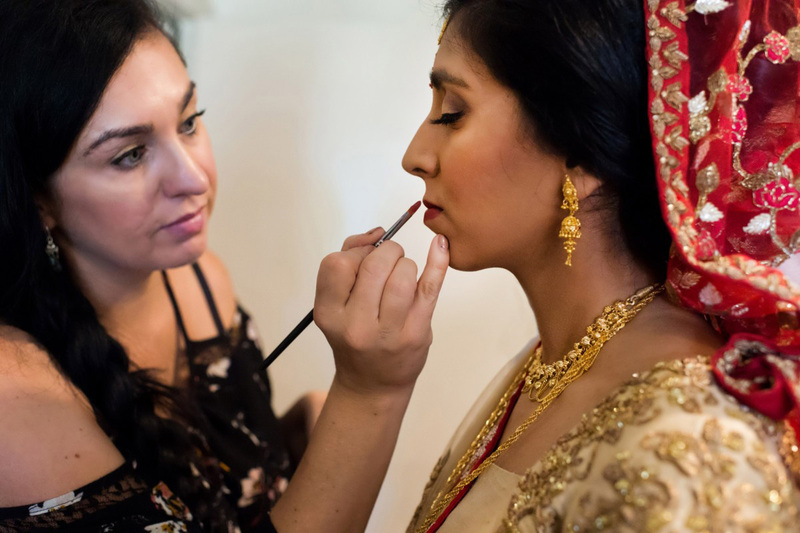 Ali took a different approach, she knew she wanted an elongated shaped diamond, rose gold, and that was it. 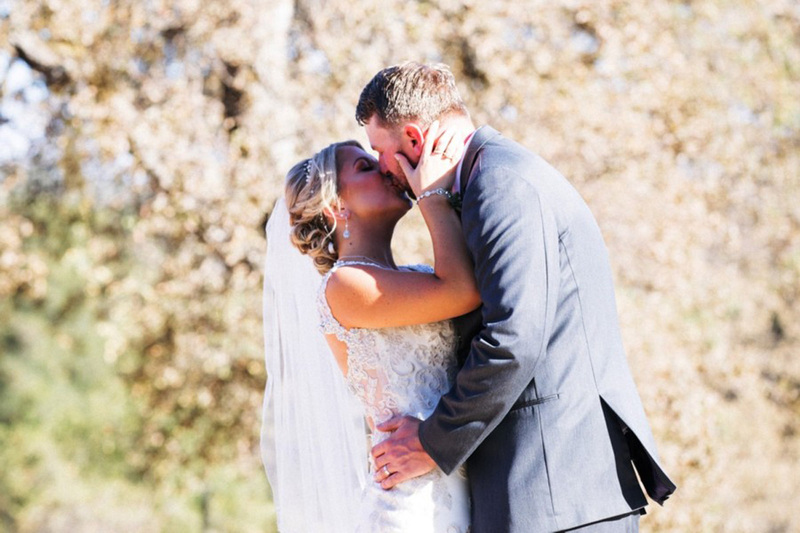 The rest was left up to the expert – and Nick hand-fabricated a completely custom, unique diamond engagement ring. 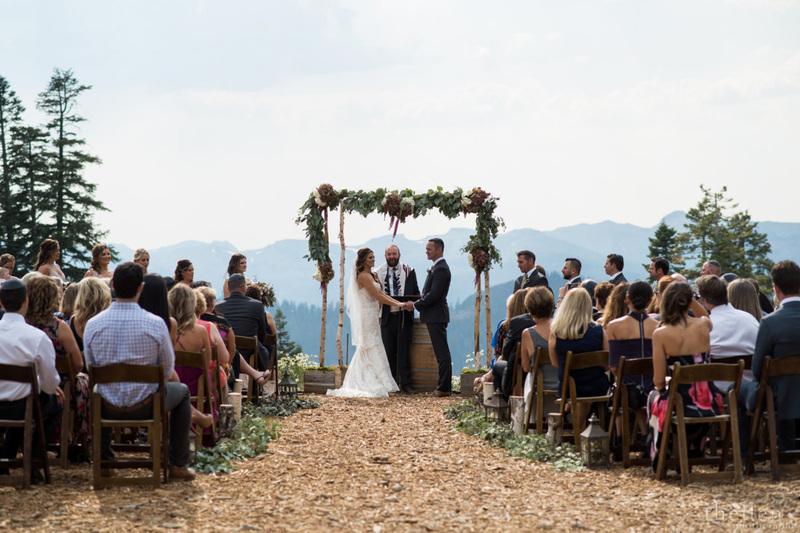 In choosing a location for Ali and Nick’s nuptials, the mountains have always called to both of their families. 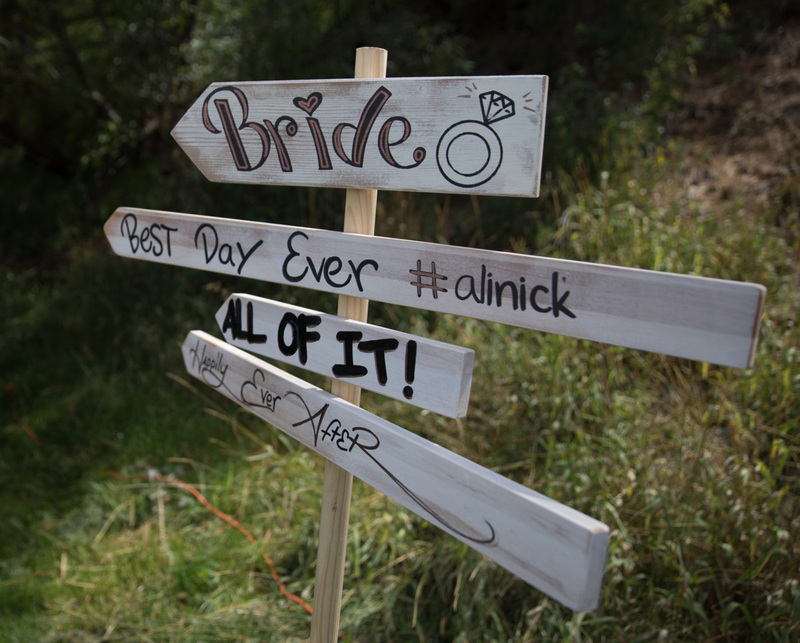 Ali’s parents met on the ski slopes in the singles line, and Nick grew up going to the slopes with his parents. 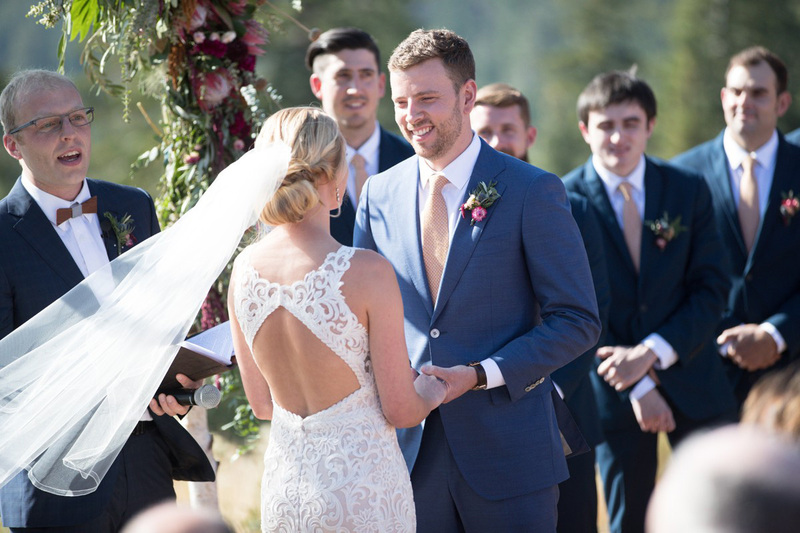 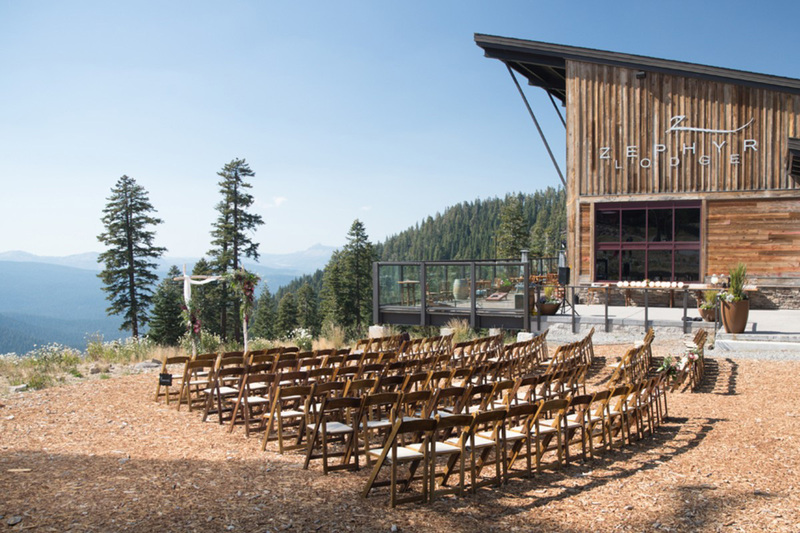 So, Nick and Ali could think of no other place to get married than in Tahoe. 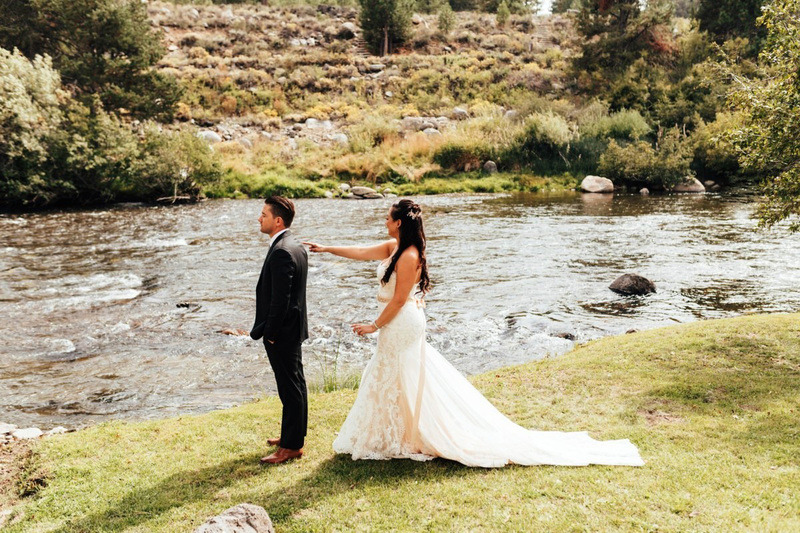 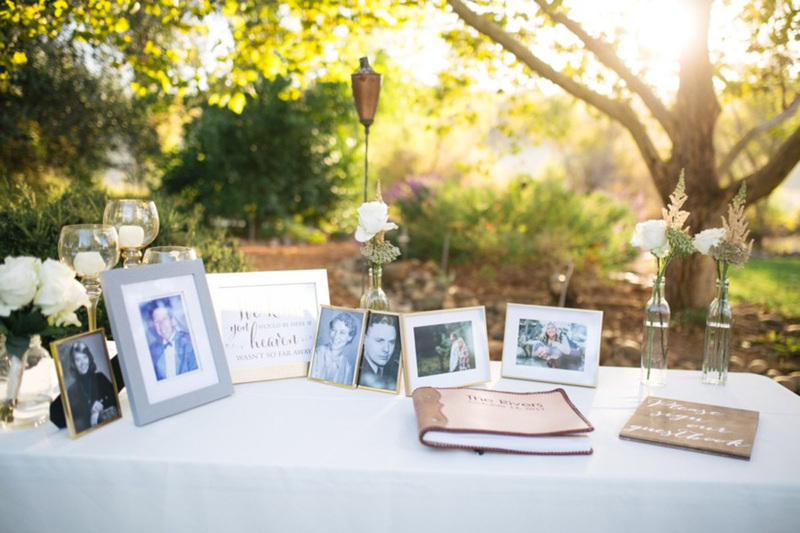 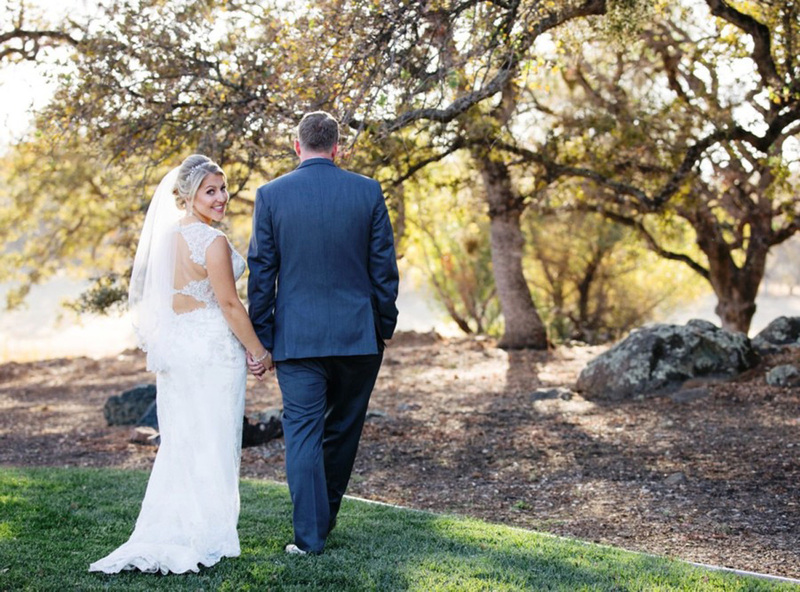 The ceremony and reception were just steps from the trail where they first said “I love you” to each other, and they were inspired by the Truckee River and all the surrounding natural beauty for their wedding theme. 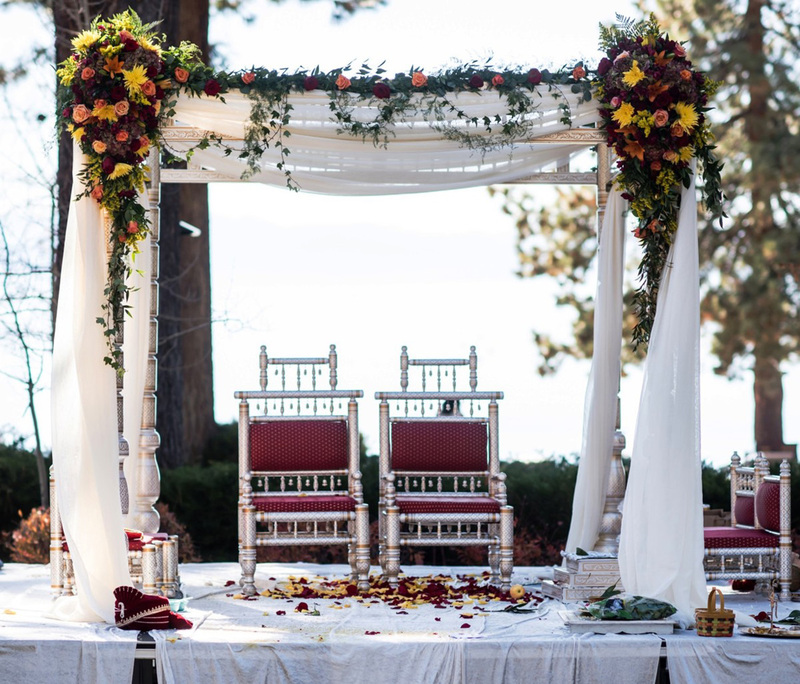 There were many projects and personal touches that transformed a riverside park into a romantic fairy tale. 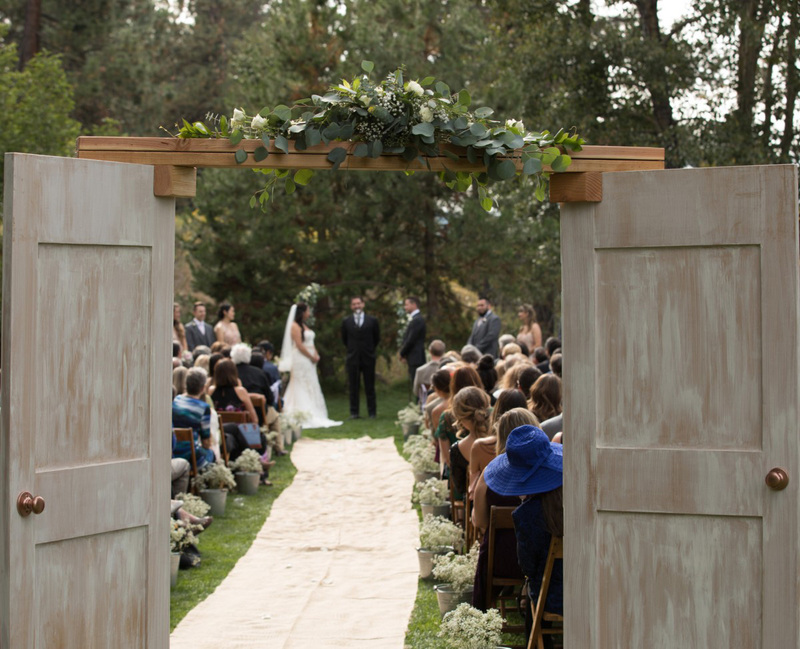 Vintage doors were draped with eucalyptus and flowers centered at the start of the aisle. 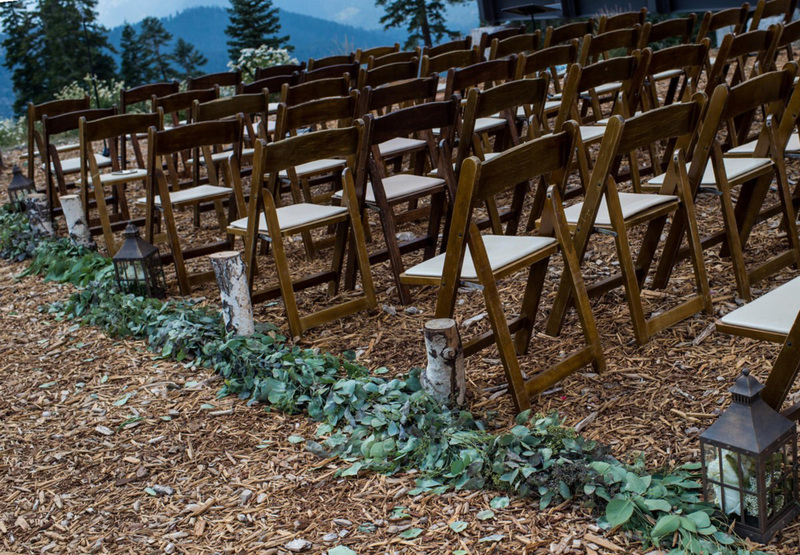 Birch wood was utilized throughout the venue, collected from a tree cut down at a friend’s house. 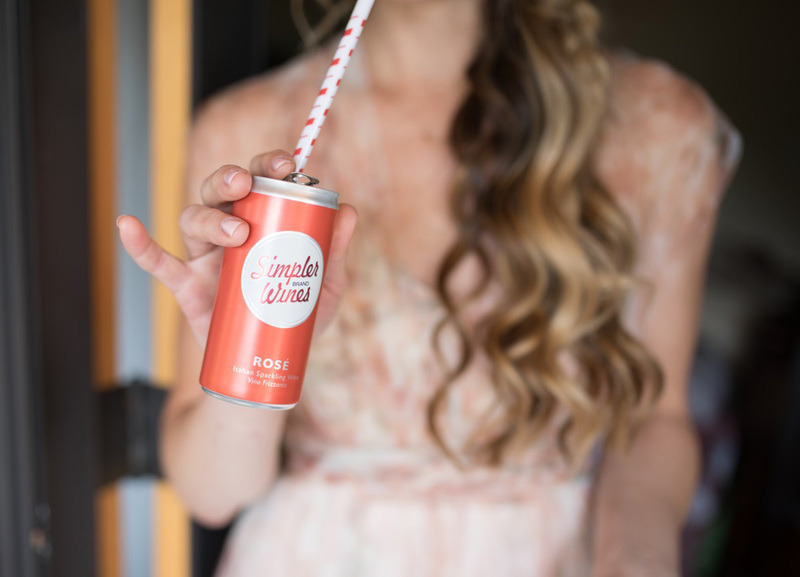 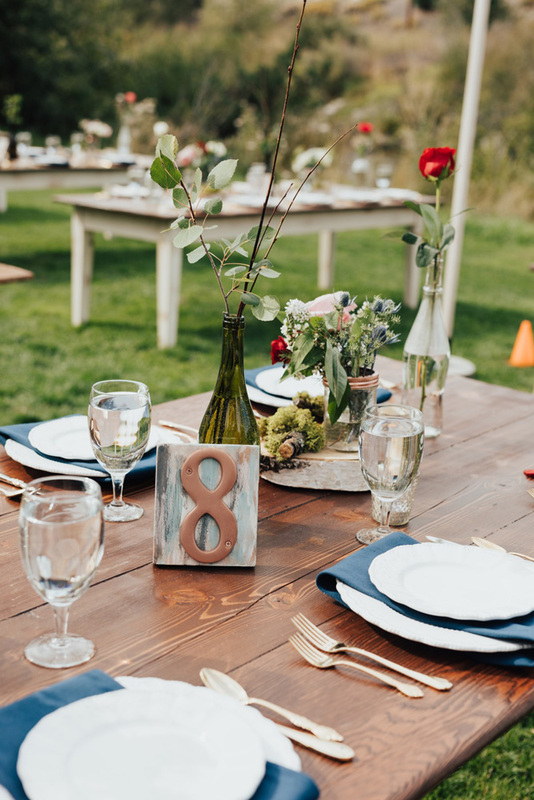 Recycled wine, whiskey, and gin bottles – all consumed by the bride and groom (now that’s what you call a labor of love!) 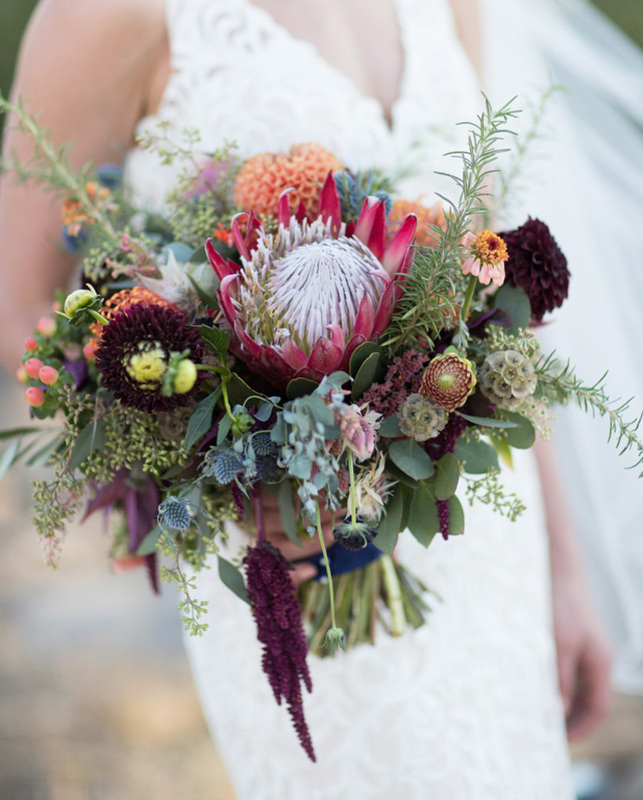 – were scattered throughout with flowers and eucalyptus. 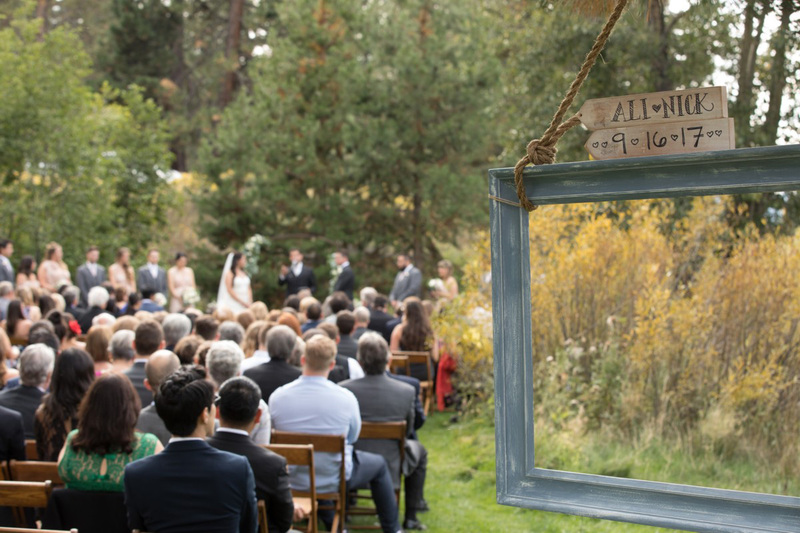 And hand-painted wooden signs displayed the groom’s artistic touch. 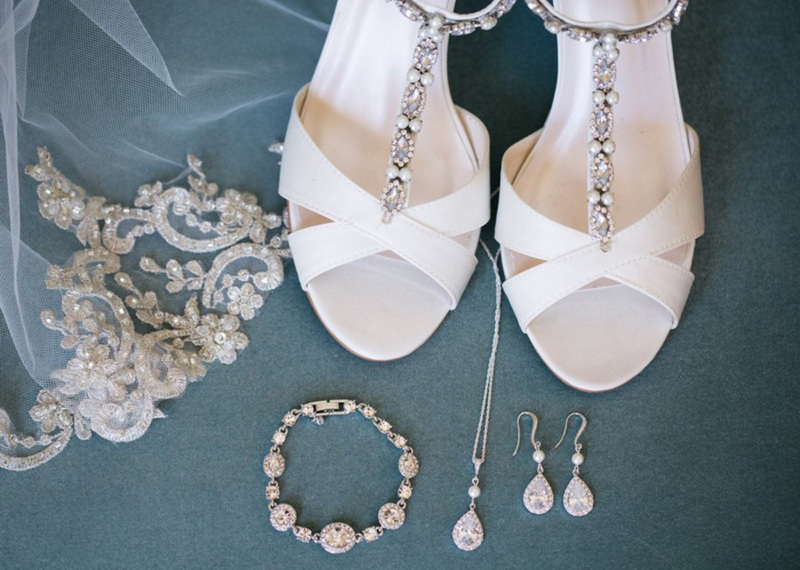 Jewelry was all over this wedding! 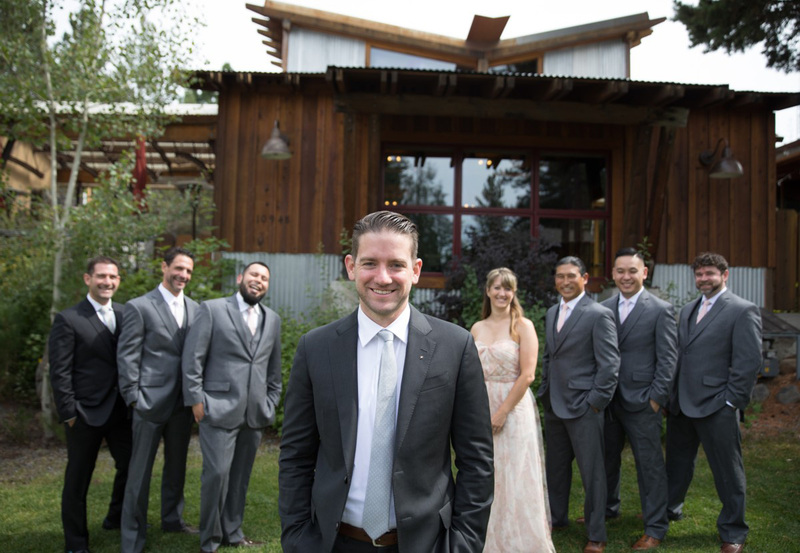 Nick and his team helped make custom earrings for all the women in the bridal party. 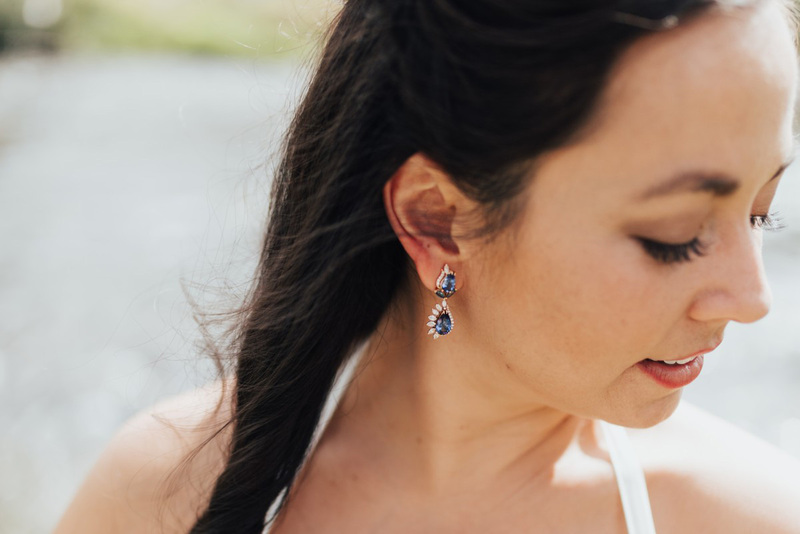 Ali also commissioned Nick to make the stunning, custom “something blue” earrings of her dreams with diamonds, sapphires, and her birthstone – tanzanite. 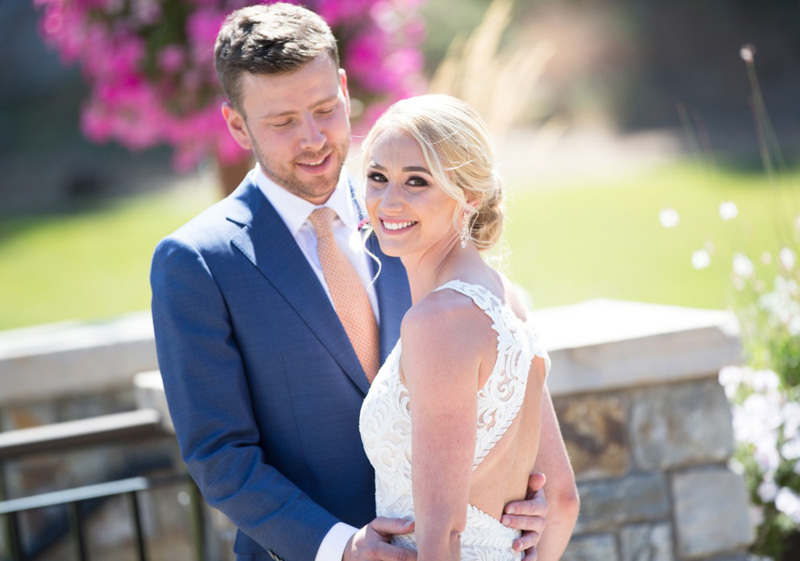 On the wedding day, Nick surprised Ali with a delicate and beautiful wedding band, and another ring circled with diamonds in a design that Ali had been admiring for months. 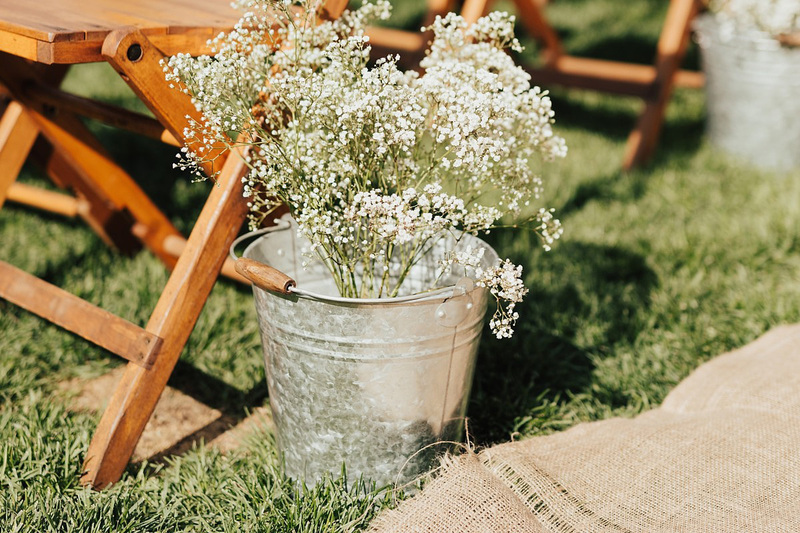 The wedding flowers had a soft, gathered, vintage feel, inspired by a field of wild flowers rather than a formal bouquet. 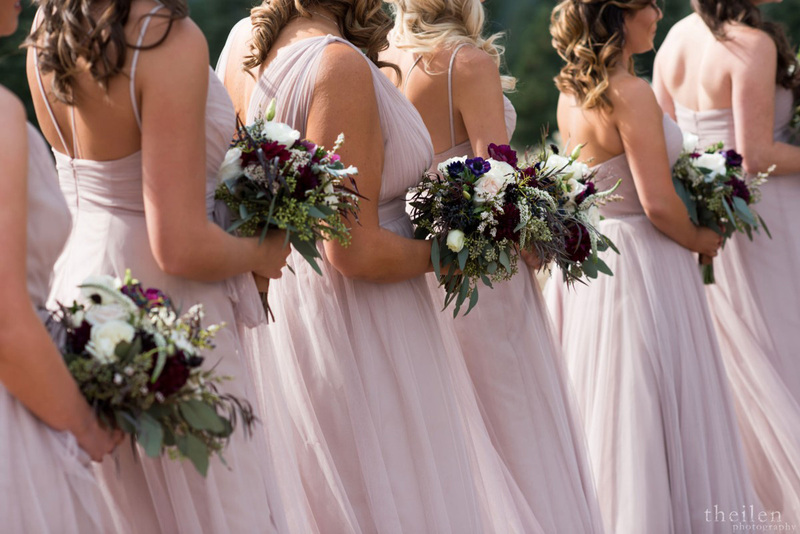 The florist used eucalyptus, baby’s breath, spray roses, delphinium, larkspur, eryngium, roses, Queen Anne’s lace, dusty miller, alstromeria, Italian ruskus, curly willow, and more! 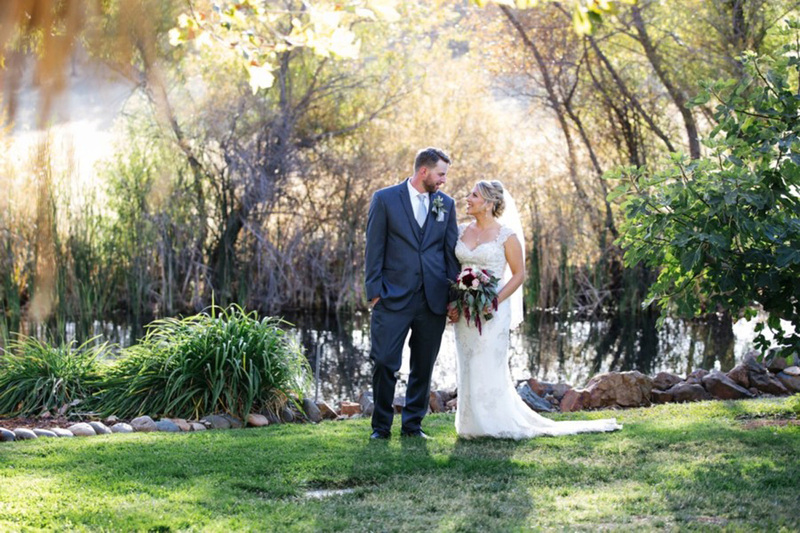 The park itself also provided a beautiful, natural backdrop and the flowers perfectly accented the outdoor venue. 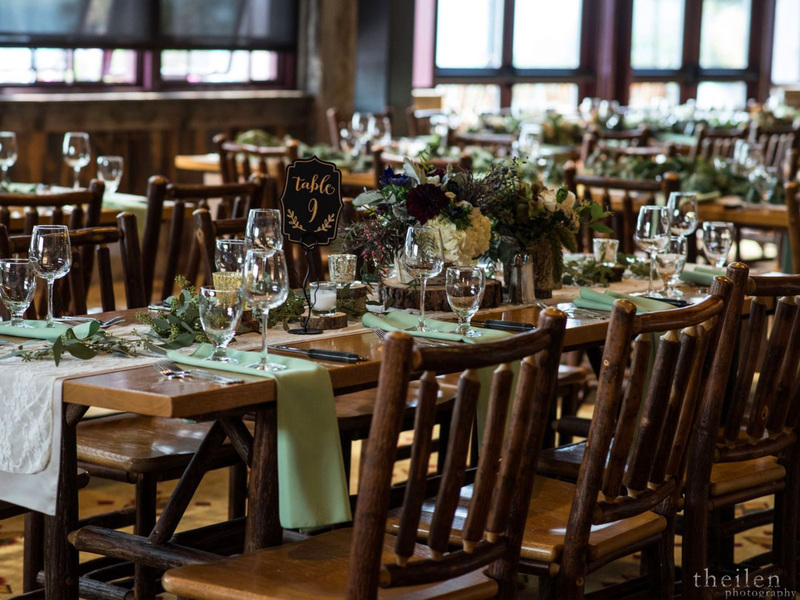 Keeping with the DIY and repurposing spirit of the wedding, the florist gathered up the flowers after the wedding reception. 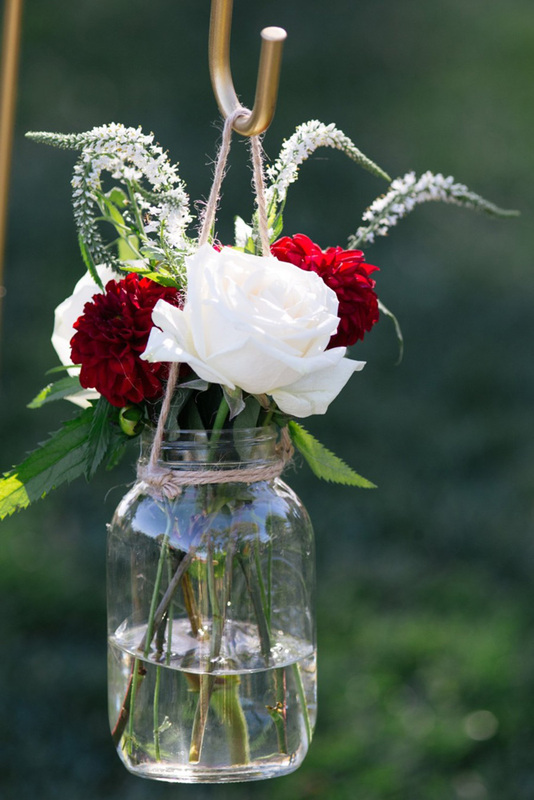 These flowers were then donated to The Petal Connection, a group of incredible volunteers who gather together to bring love and joy to hospice patients, their families, and seniors in the community. 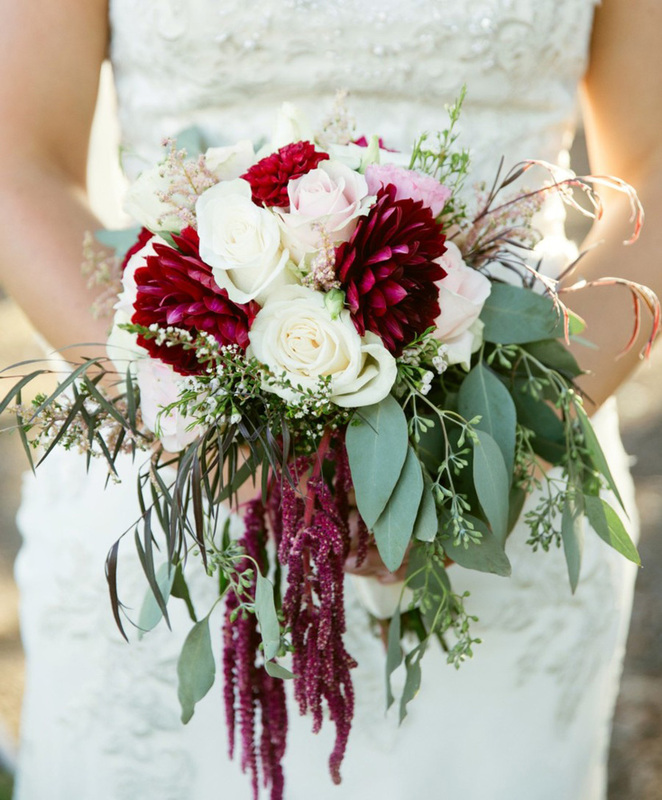 This act of kindness blesses not only the recipients, but also the person whose hands created the floral designs. 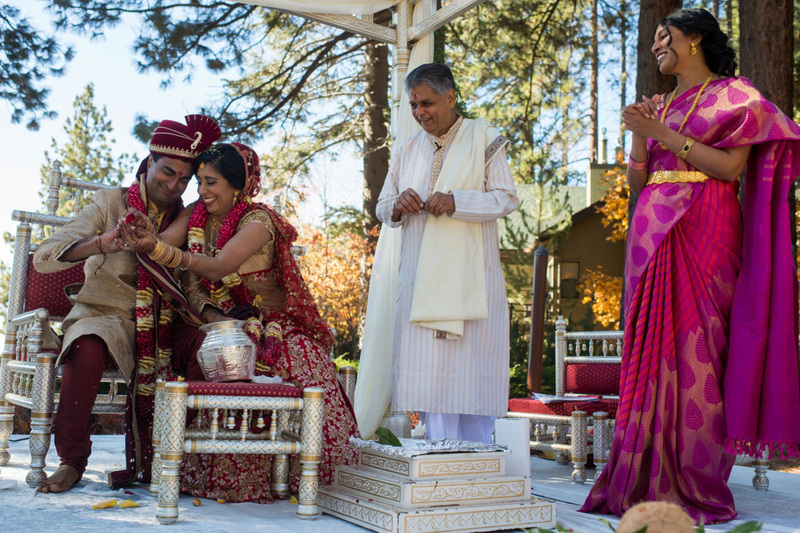 And of course, it reflects the generous spirit of the newlyweds, too! 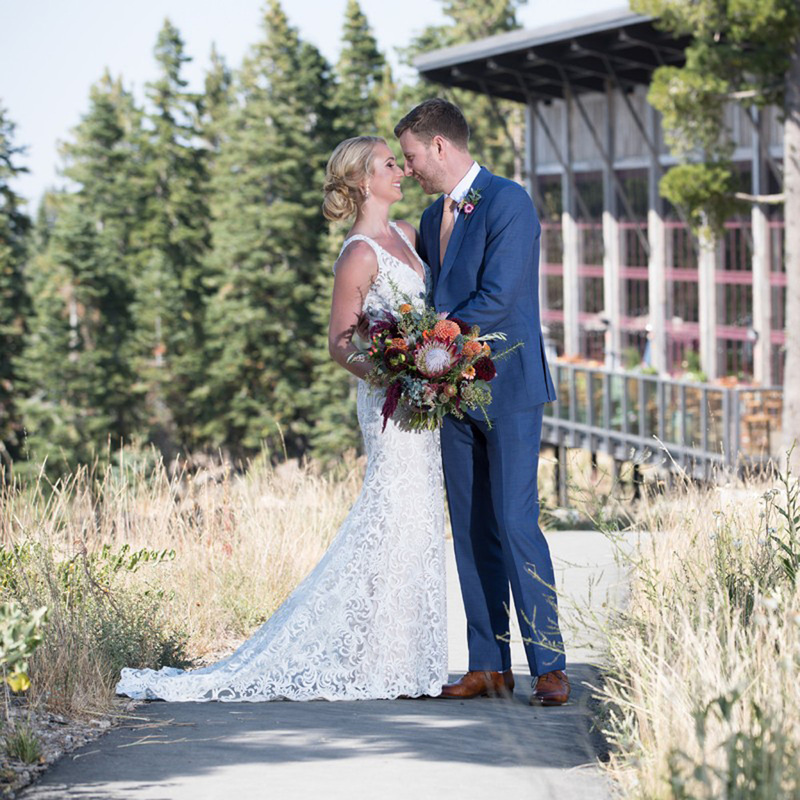 For their destination wedding, Sara Beth and Sam left behind the hustle & bustle of San Diego for the spectacular Sierra views from the Zephyr Lodge at Northstar California. 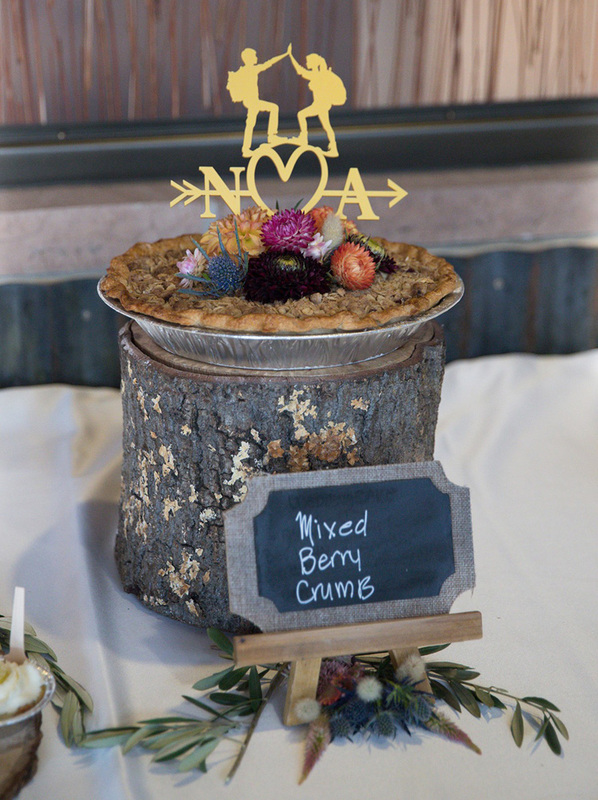 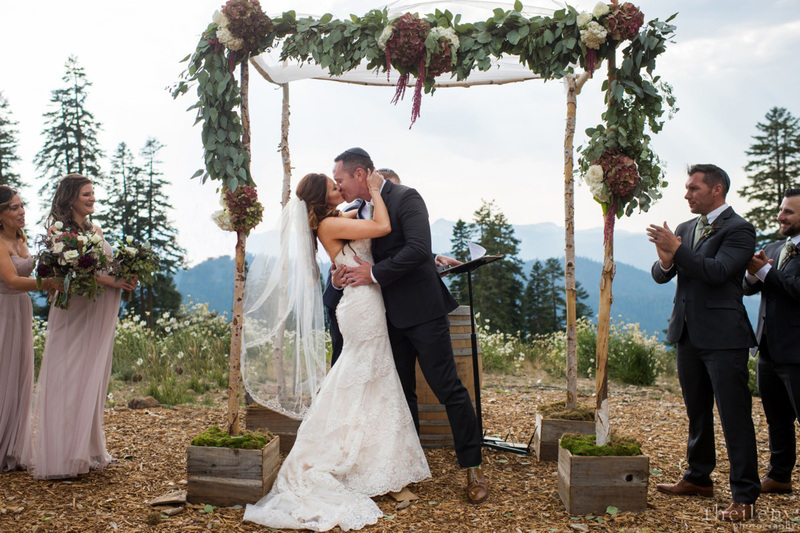 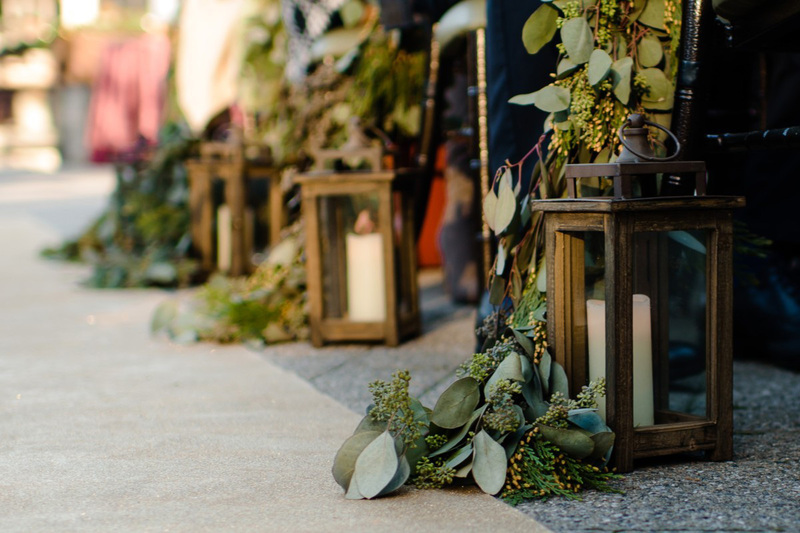 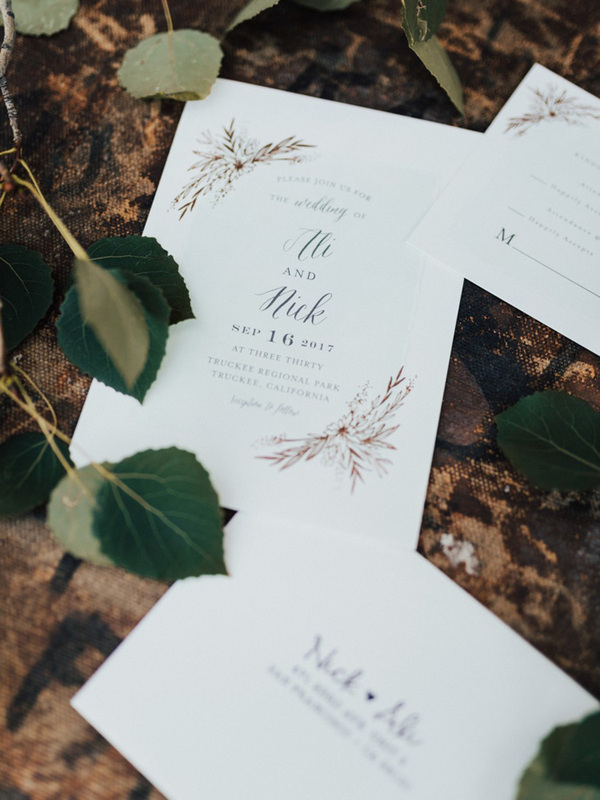 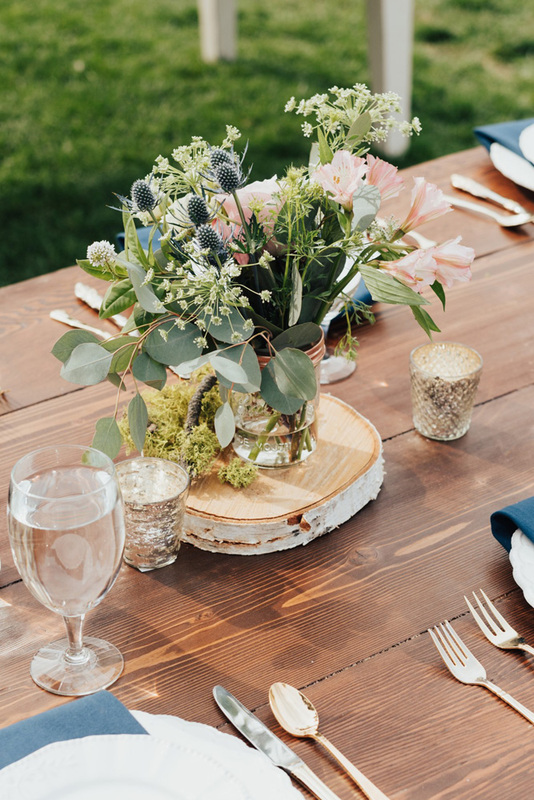 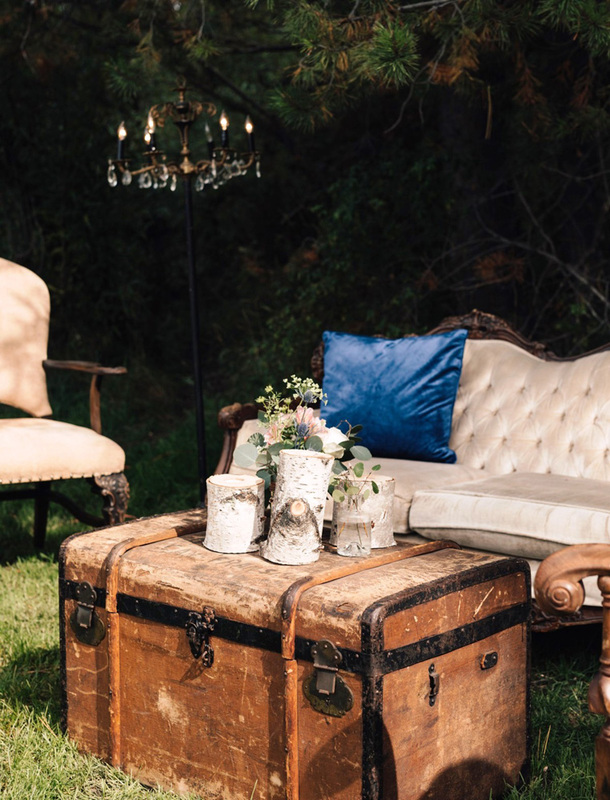 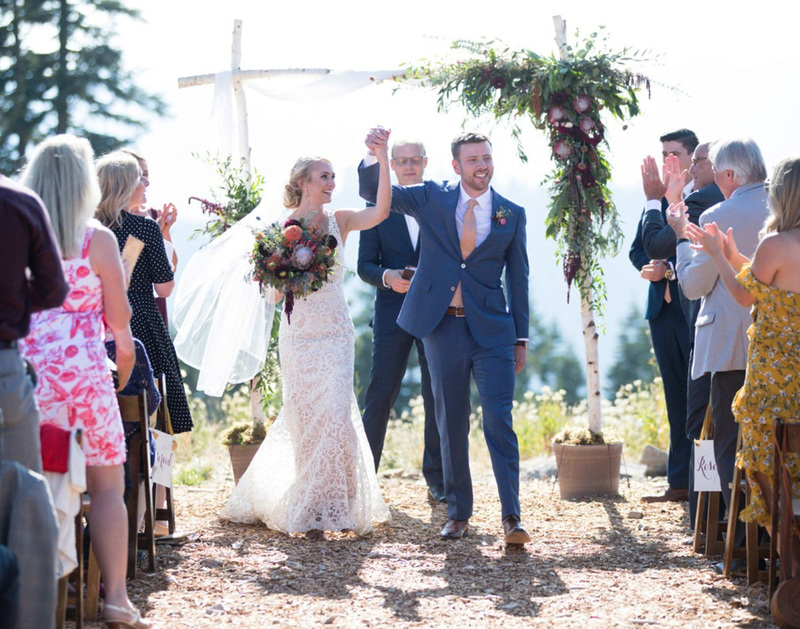 With expert planning assistance from Cara Bruno at Northstar and Lindsey Johnson with Blue Sky Events, the couple created a mountain-rustic-themed celebration that left everyone enraptured. 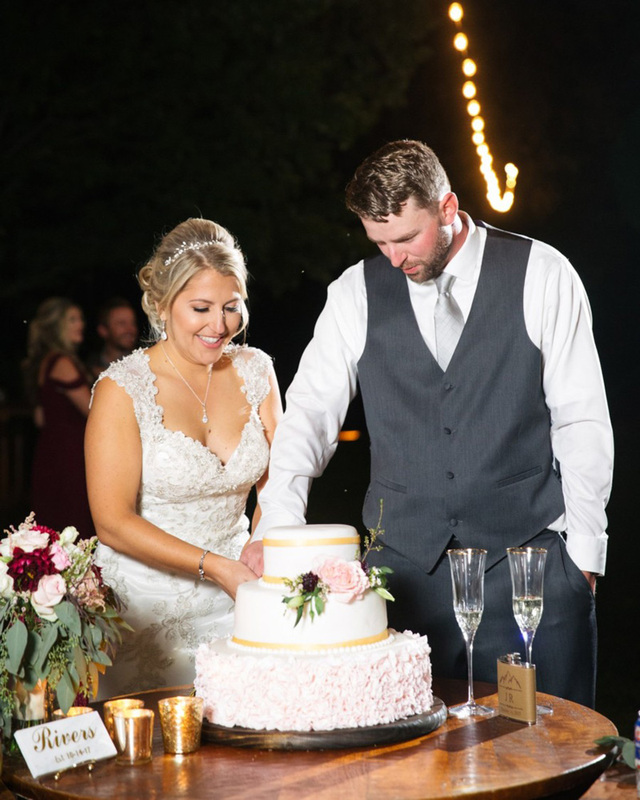 Fantastic photos of their special day were captured by Theilen Photography. 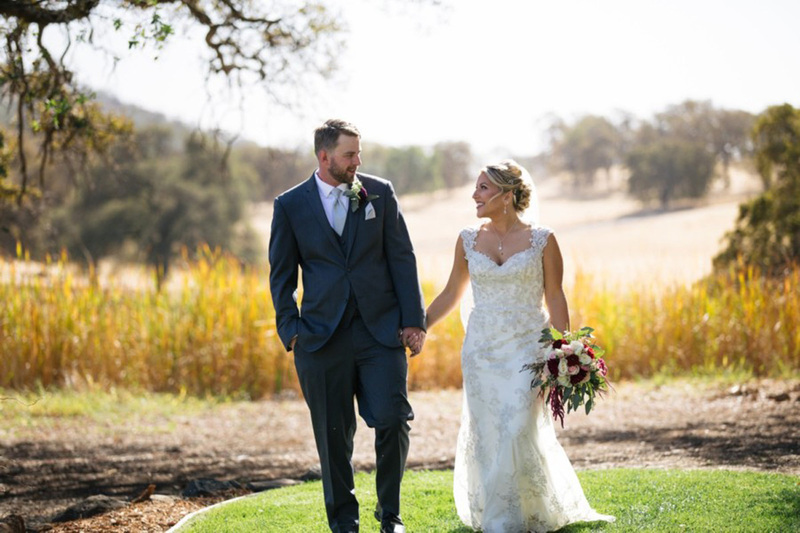 Sara Beth grew up in the San Francisco Bay Area (Fremont), while Sam was originally from Baltimore. 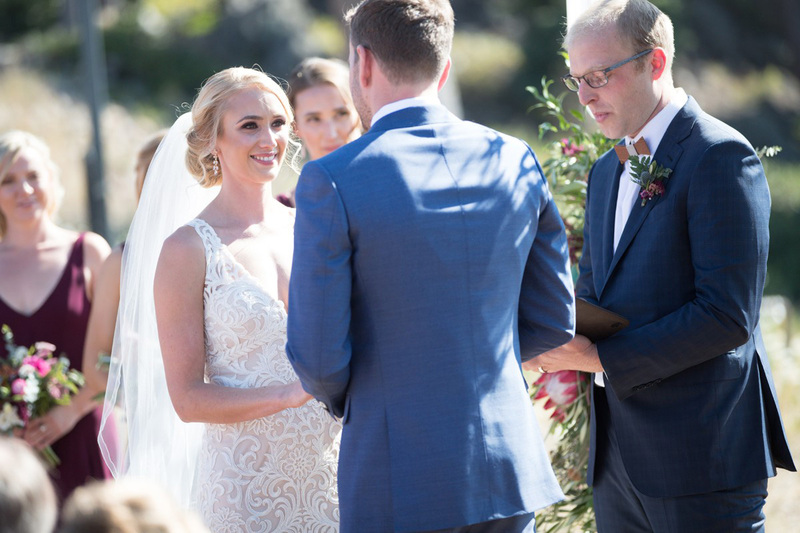 They both ended up moving to San Diego, but it took a cell phone dating app called Tinder to bring them together. 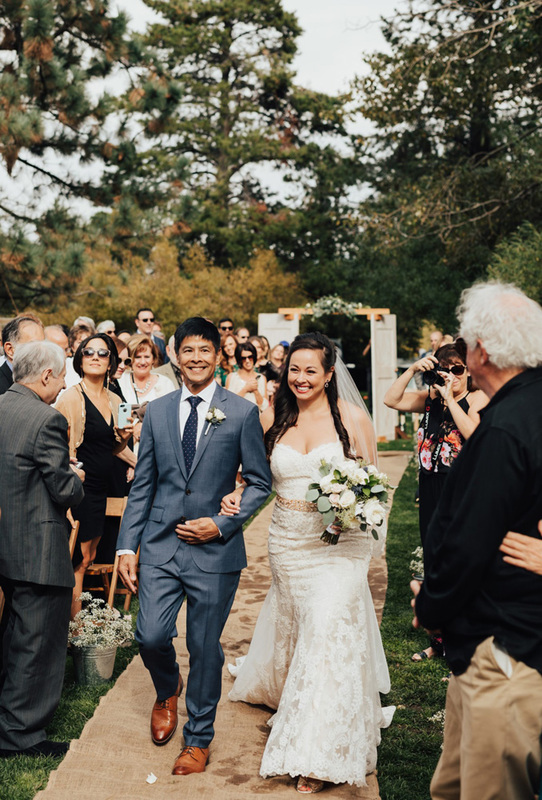 Their first date was at a restaurant in Little Italy in downtown San Diego. 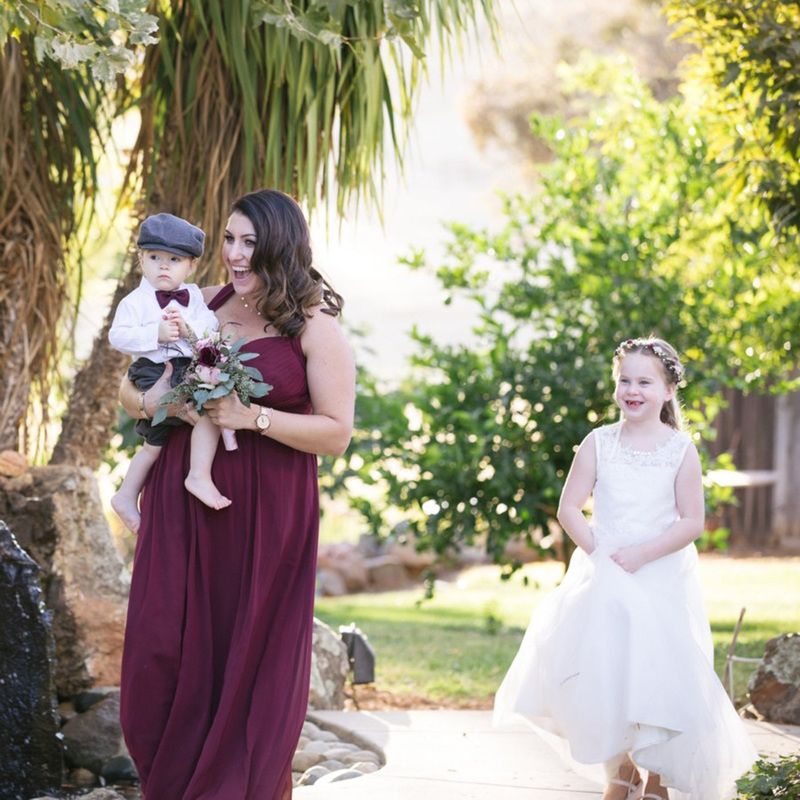 Sara Beth’s right foot was in a cast at the time, and she was using crutches to get around. 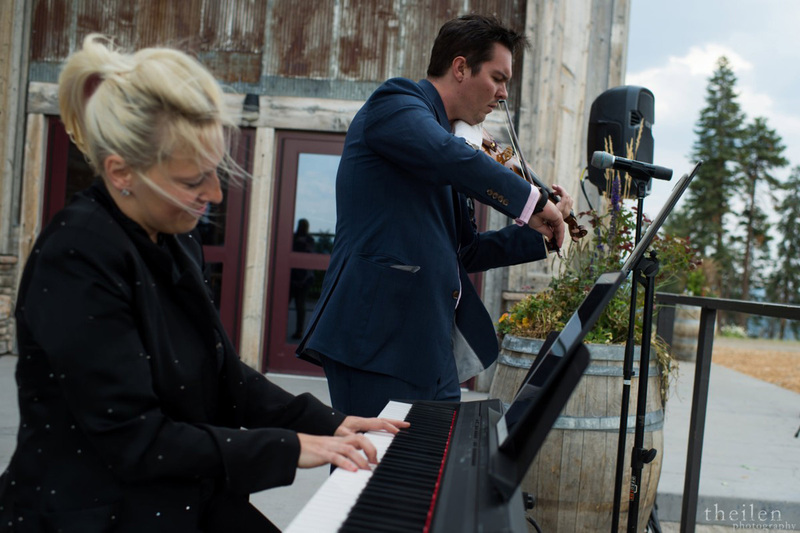 On a good day when she has all 4 limbs working properly, she doesn’t do much in the kitchen. 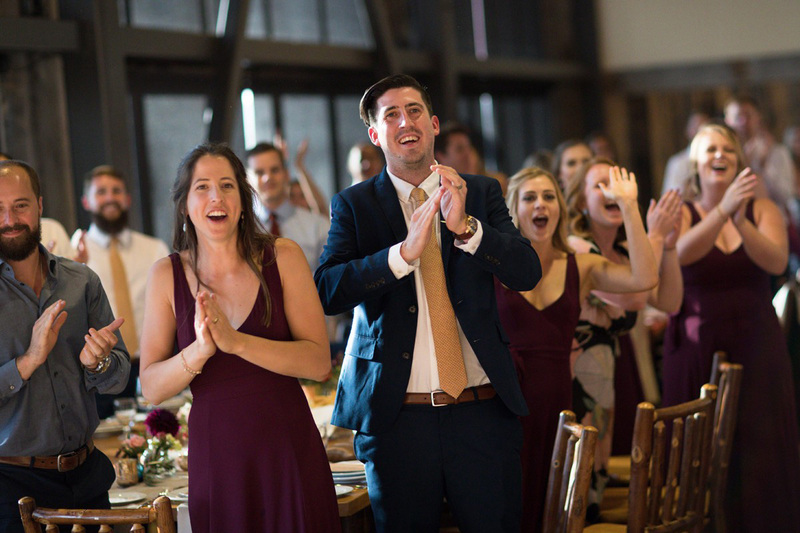 So she was thrilled when Sam said he was willing to come over to her house for a second date to help her prepare stuffing for a “Friendsgiving.” And soon they became much more than friends. 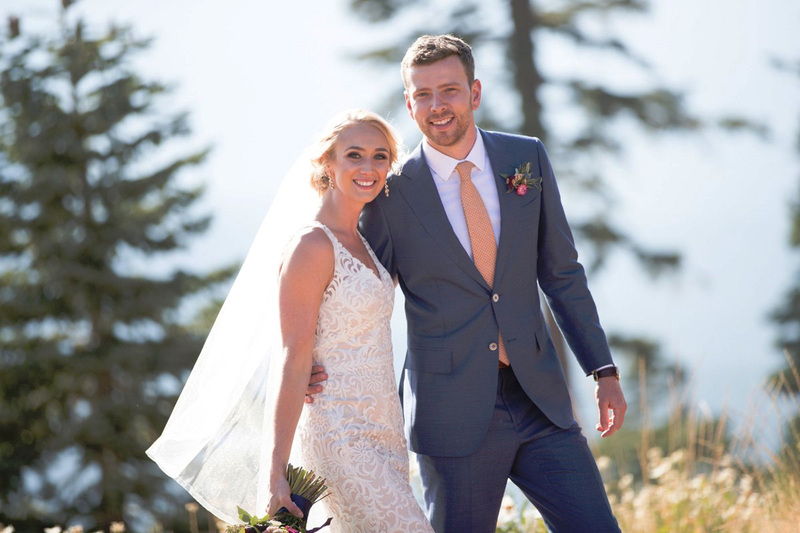 While enjoying a summer vacation in Oregon, Sam took Sara Beth to see the beautiful Multnomah Falls. 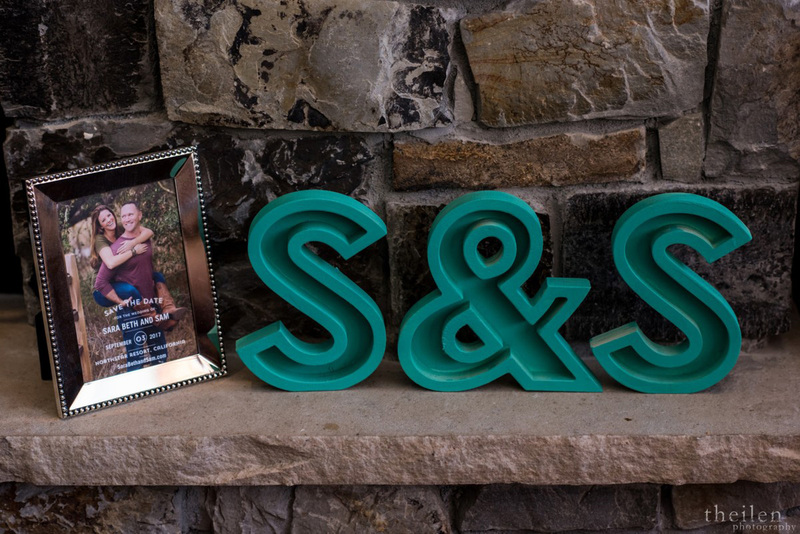 It was Sam’s birthday and he wanted to make the occasion memorable. 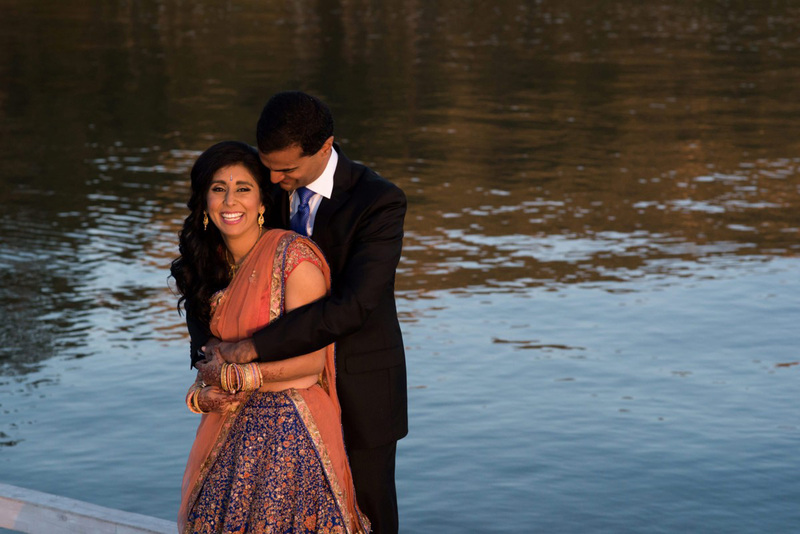 So, while standing on a bridge in front of the falls, he got down on one knee and proposed! 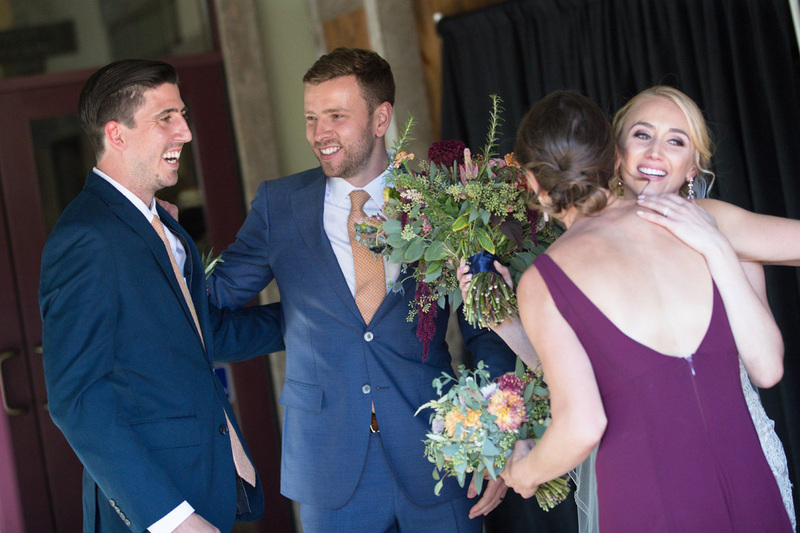 Sara Beth was very surprised but immediately said “Yes!” For Sam, it was the best birthday present ever. 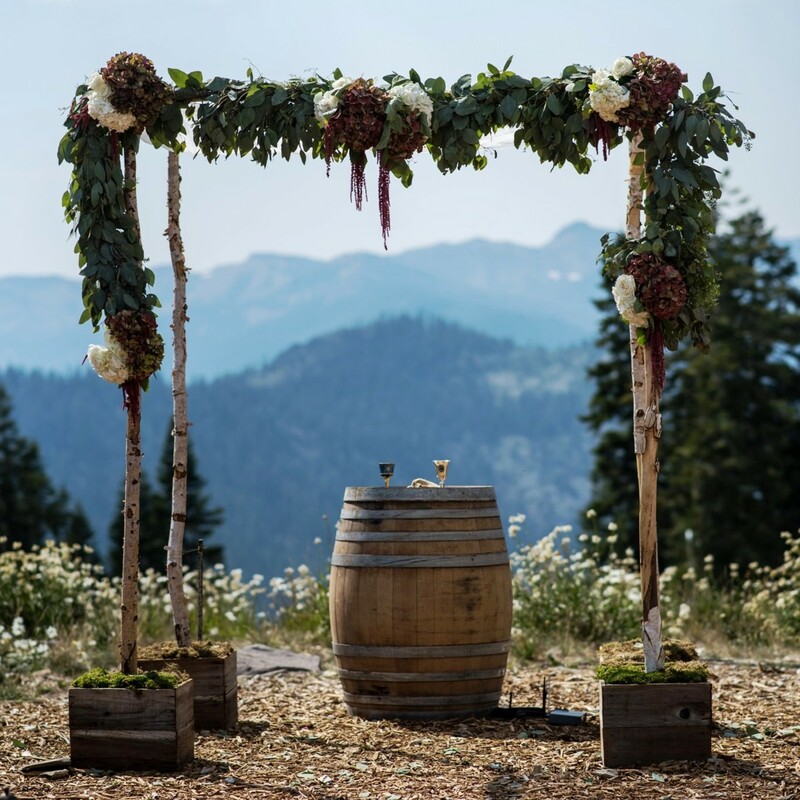 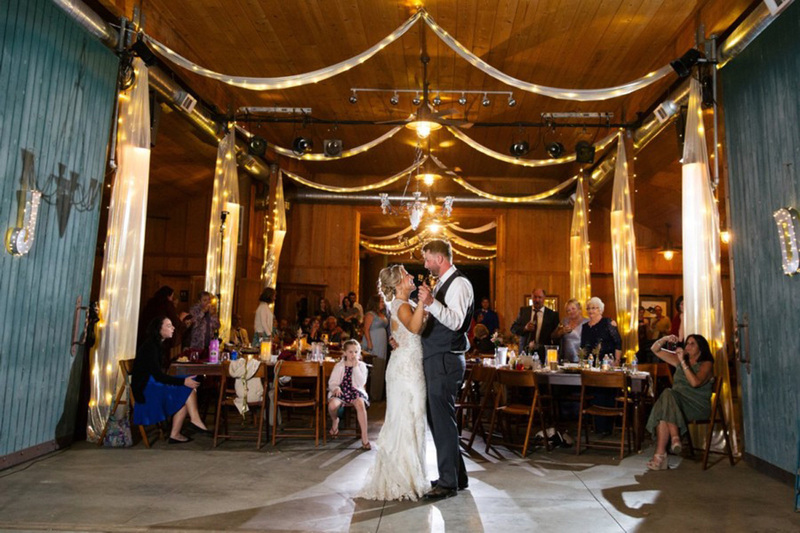 The couple chose Northstar California as the site for their celebration because they loved so many things about the location! 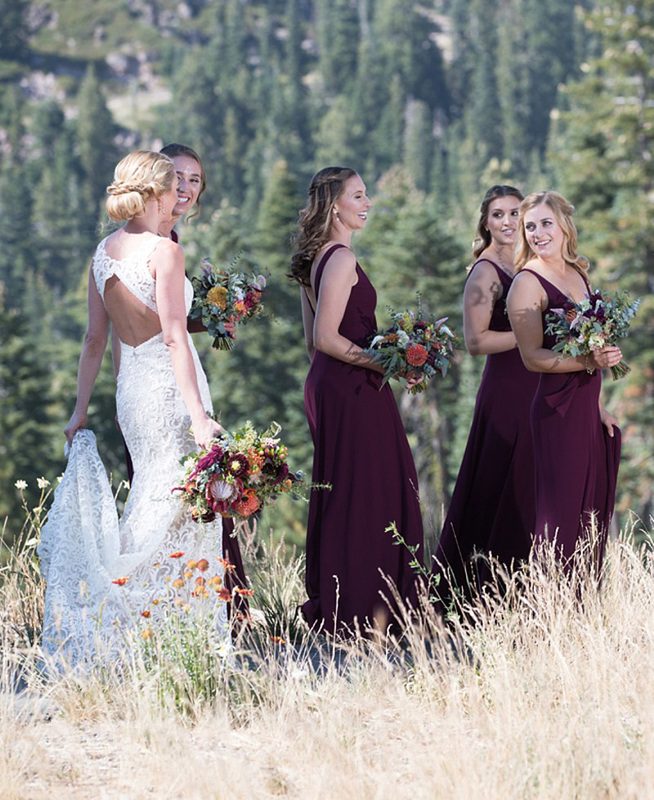 Sara Beth and Sam found the mountains to be breathtaking regardless of the season… whether they were covered with beautiful vegetation or snow. 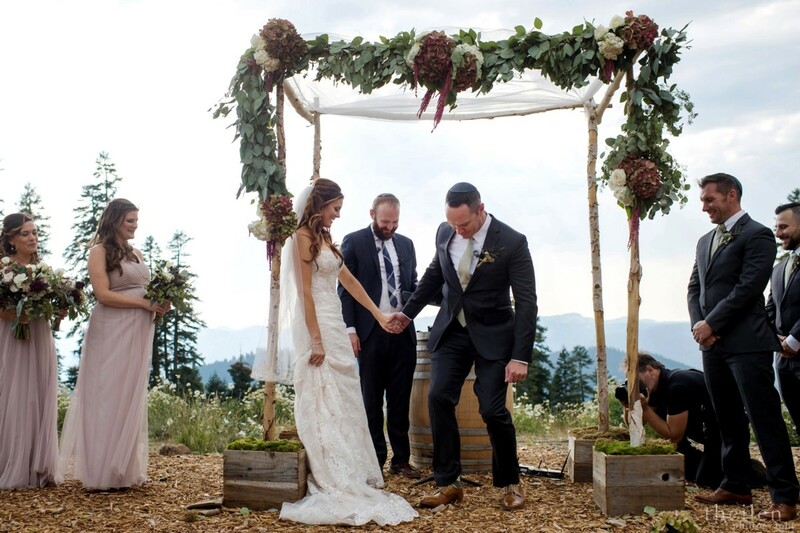 So the mountaintop venue was the perfect place for their celebration. 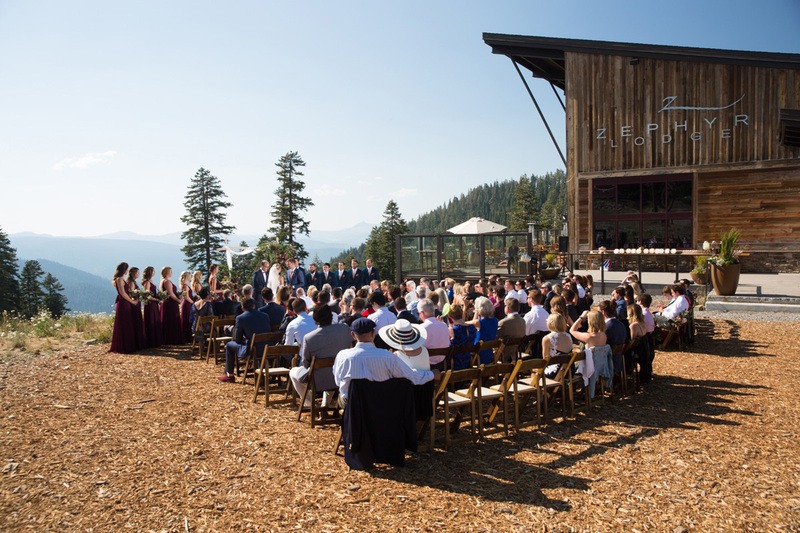 They also liked The Village at Northstar – with its shops, restaurants and lodging options, guests would not need transportation to any of the events once they arrived. 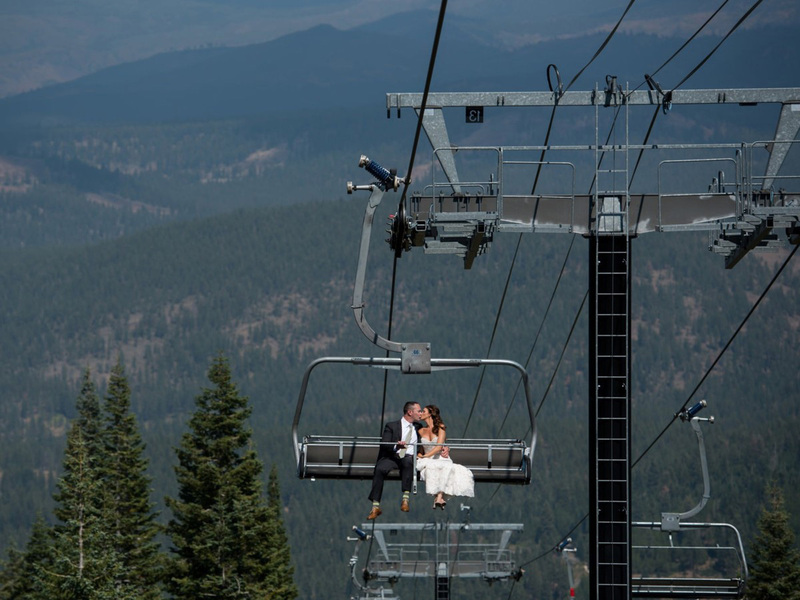 A fun added feature was having the guests take the gondola and chairlift rides to the top of the mountain for the wedding. 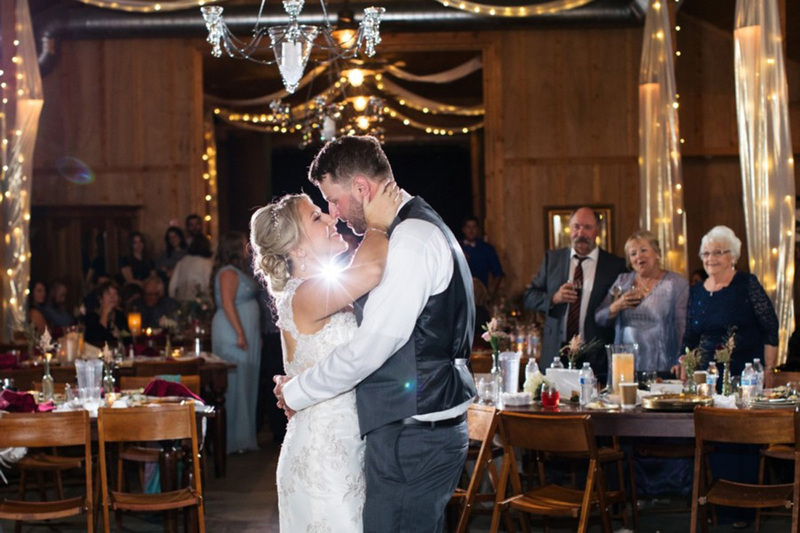 The beauty and emotion of Sara Beth and Sam’s special day was wonderfully captured in this highlight film from Videoquest Productions. 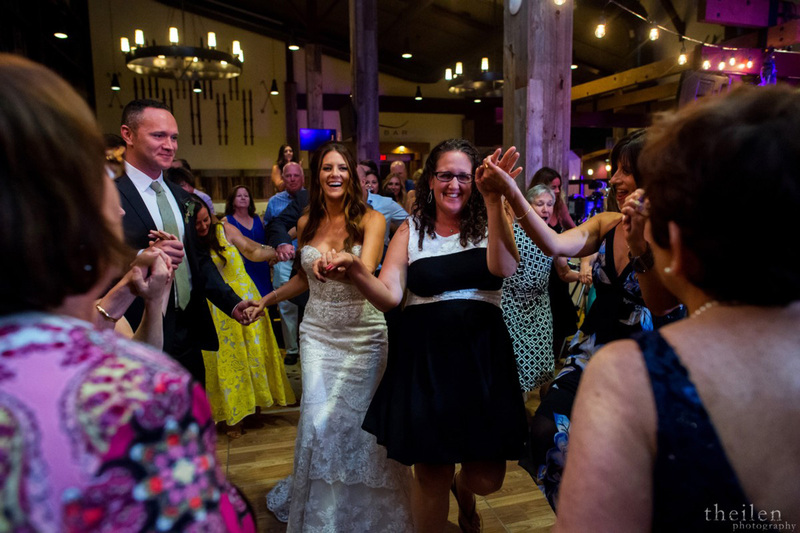 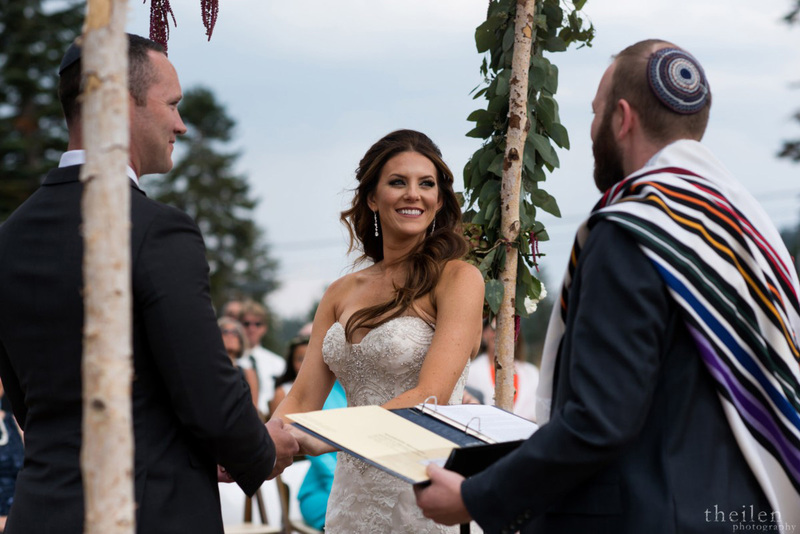 To sanctify their marriage, Sara Beth and Sam chose to incorporate many important traditions from their Jewish faith. 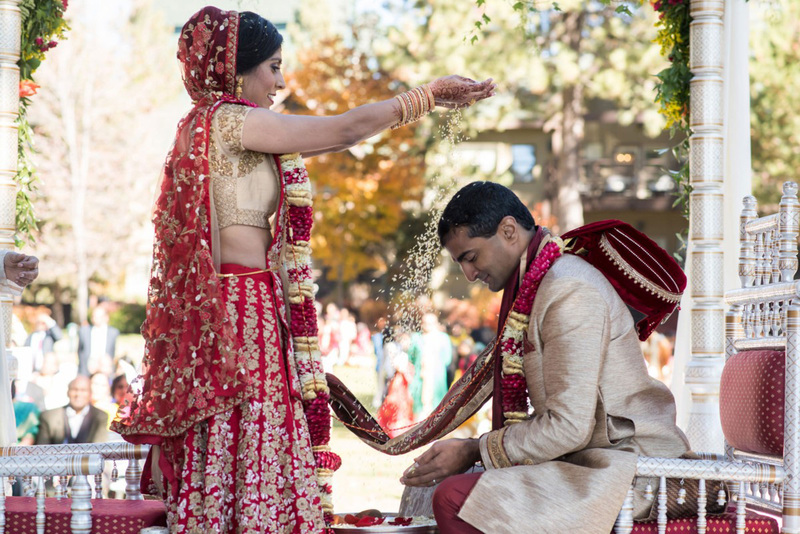 Some of these traditions are described below and beautifully illustrated through the images from Theilen Photography. 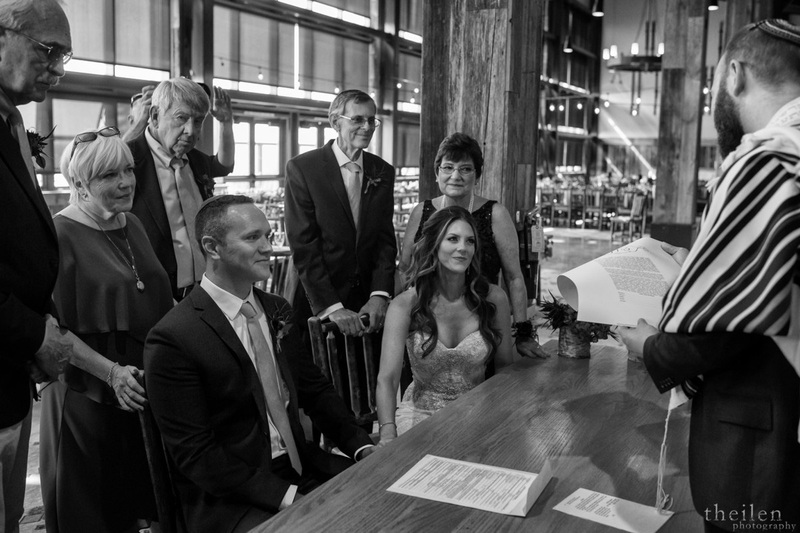 Prior to the ceremony, the couple, immediate family, wedding party members and the rabbi gather for the ketubah ceremony – the traditional Jewish marriage contract signing. 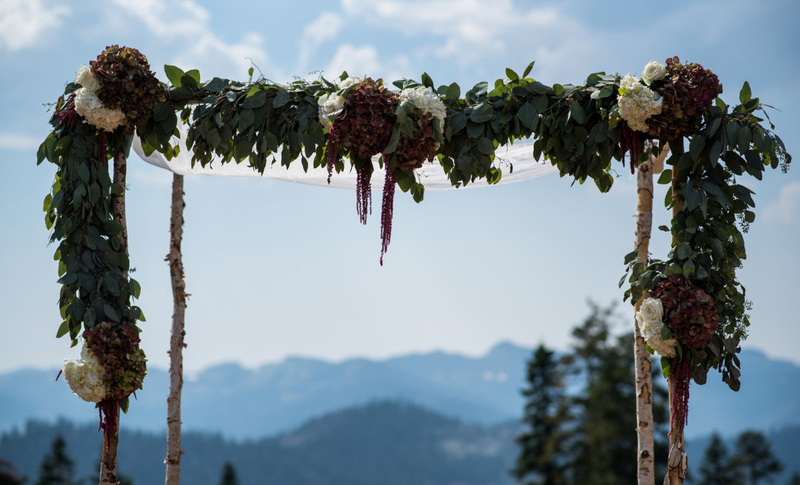 The chuppah serves as the focal point for the ceremony, under which the couple stands. 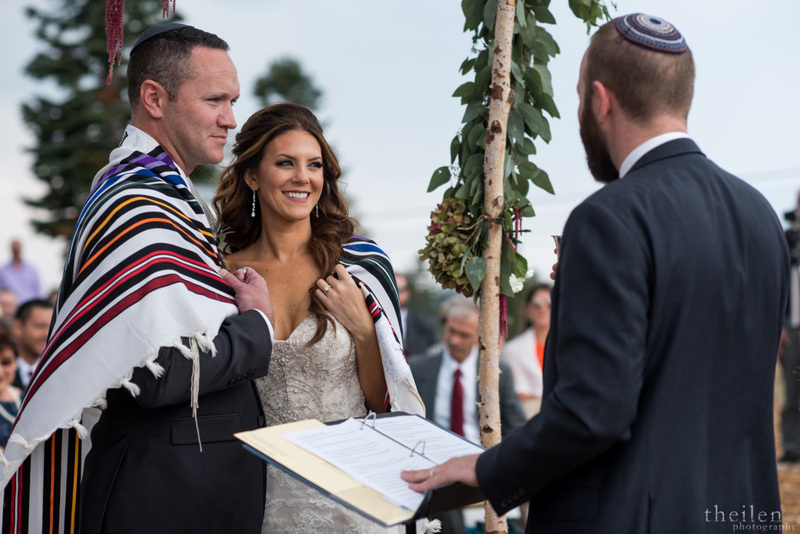 It represents a Jewish home, symbolized by a cloth canopy and the four poles. 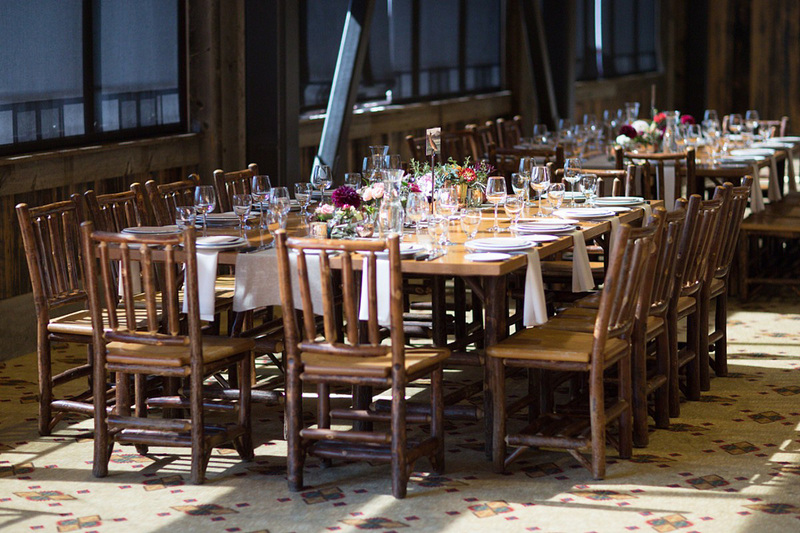 It is open on all sides, to represent hospitality to one’s guests. 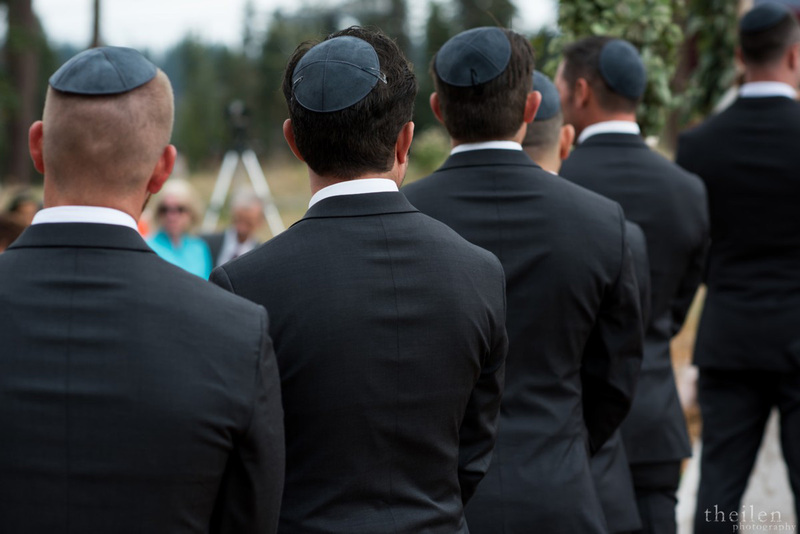 Male guests, Jewish or not, typically cover their heads with a cap, known as a kippah or yarmulke, as a sign of respect. 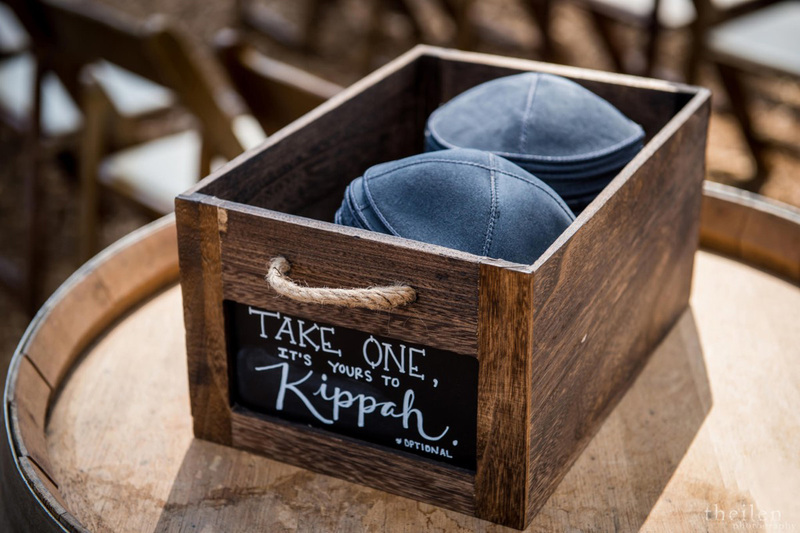 Two Kiddush cups are placed under the chuppah and used for the ceremony. 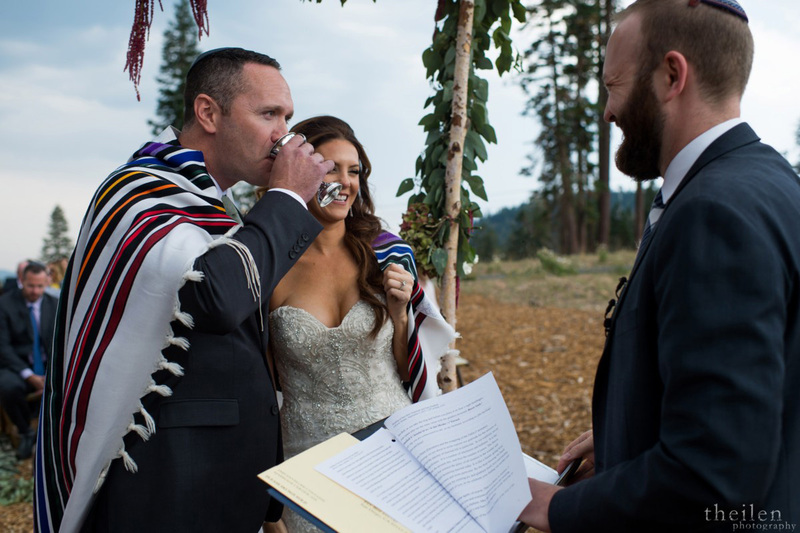 The couple sips ceremonial wine from the first cup and receives a blessing from the rabbi. 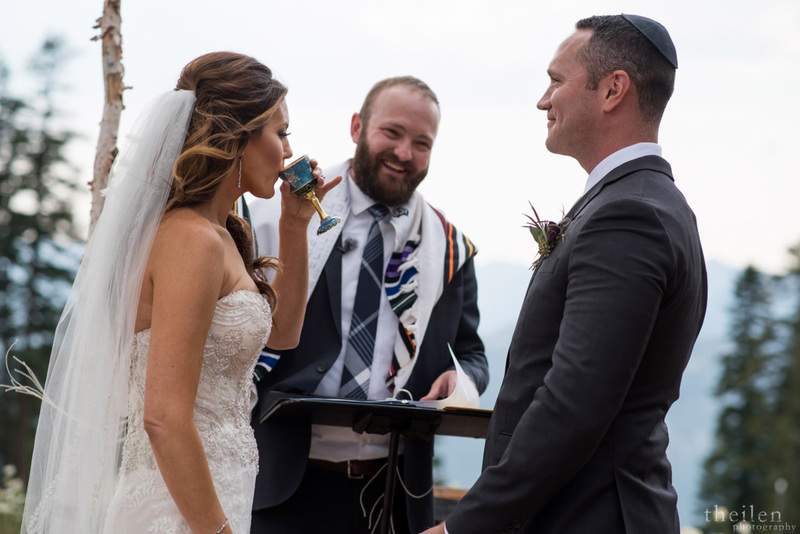 Later, after the exchange of rings, the rabbi reads or chants seven blessings called the Sheva Brachot. 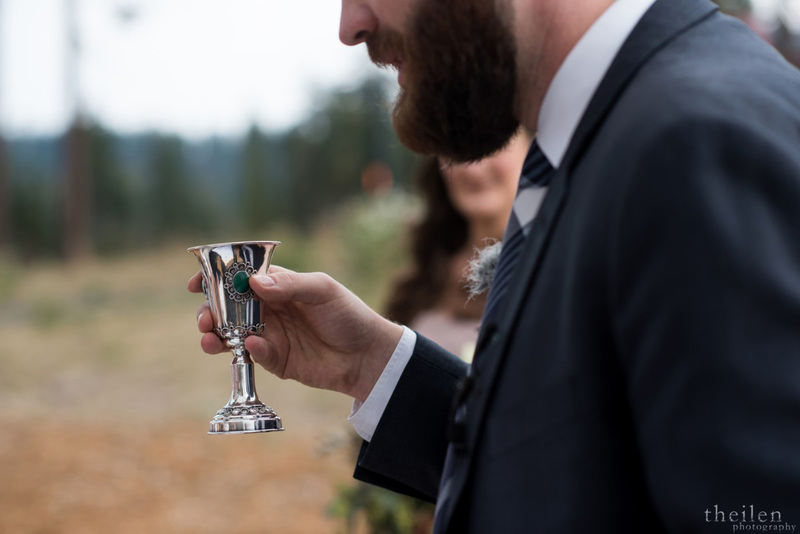 These blessings are completed with the sipping of wine from the second cup. 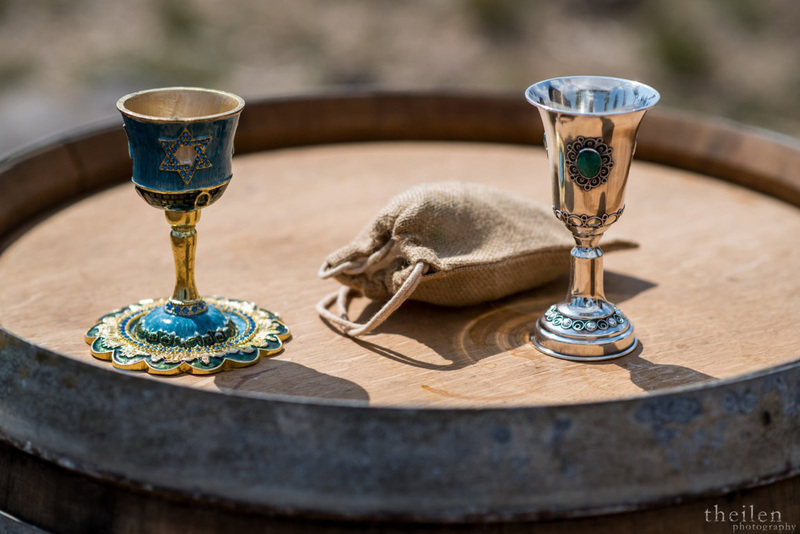 Kiddush cups are often kept as family heirlooms – the cups used at this wedding were also used by Sara Beth’s parents when they were married. 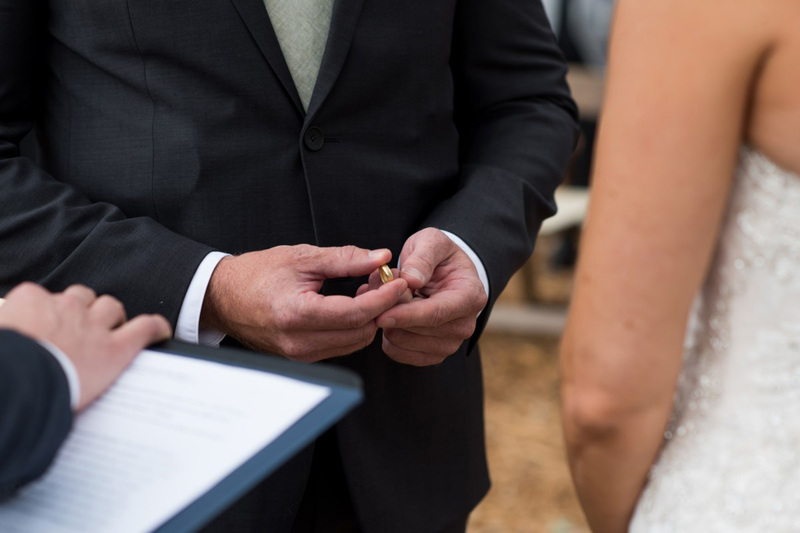 According to Jewish tradition, the groom places a gold ring on the bride’s index finger of her right hand because it is believed that the index finger has a direct connection to the heart. 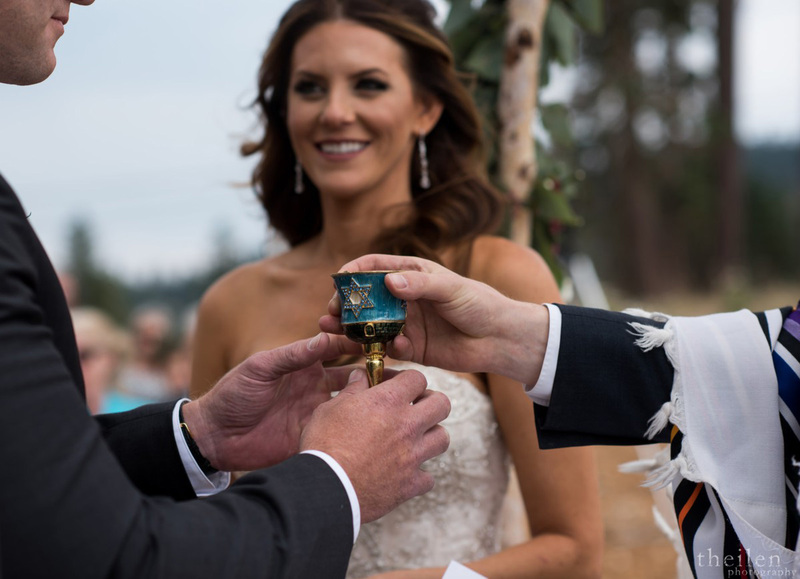 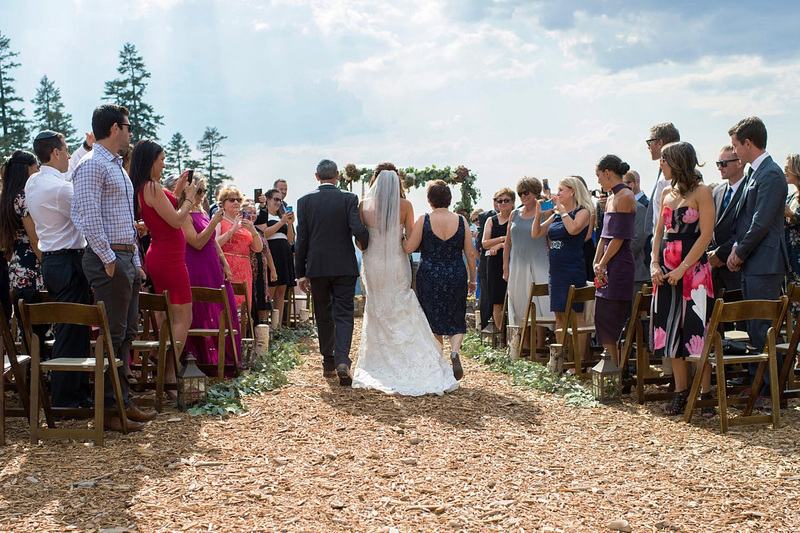 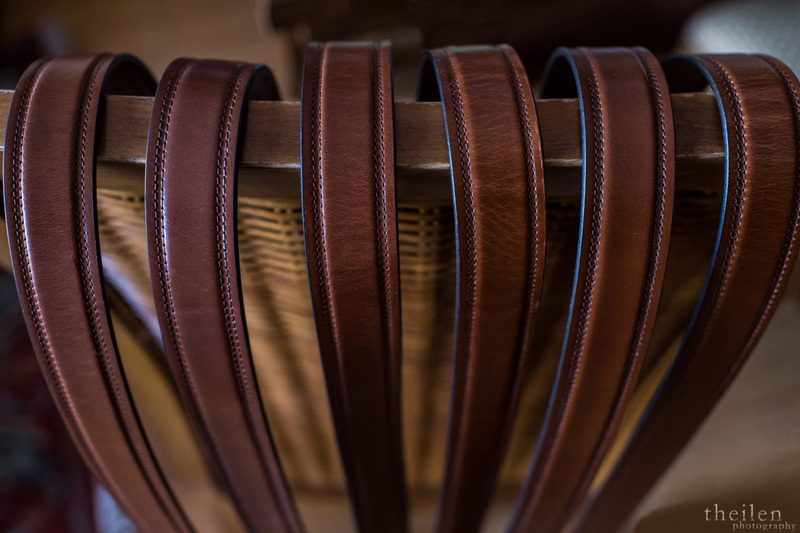 For this ritual, Sam and Sara Beth used a wedding band that had been passed down through several generations of Sara Beth’s family for over a hundred years. 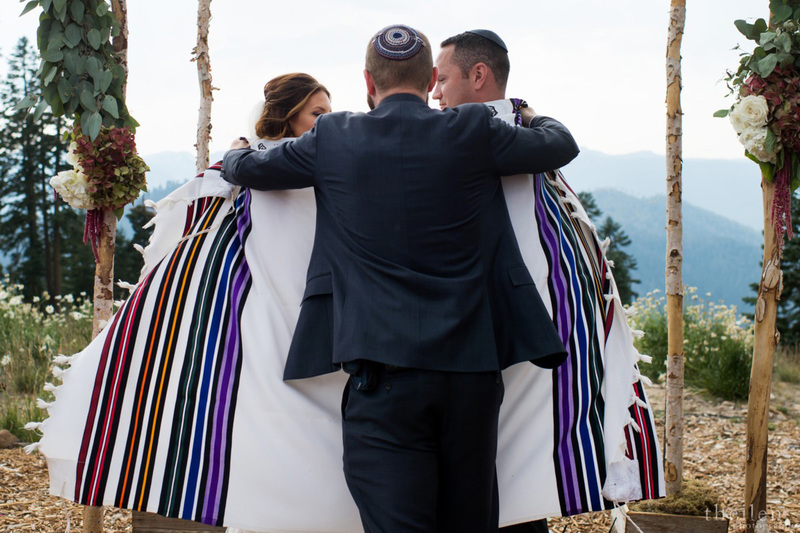 In the Sephardic culture, a Tallit cloth is used to wrap the couple under the chuppah, symbolizing their union, as well as the protection of God. 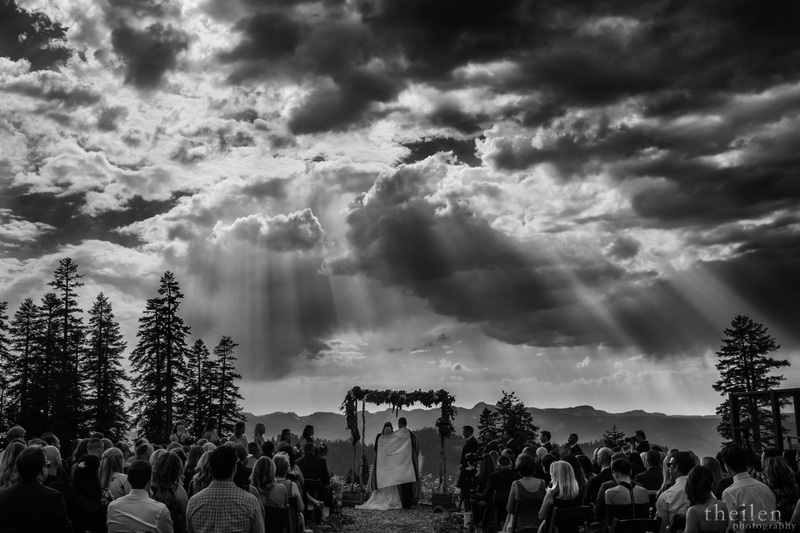 If you’re wondering whether God was watching over this wedding, check out the awesome final photo in the batch below. 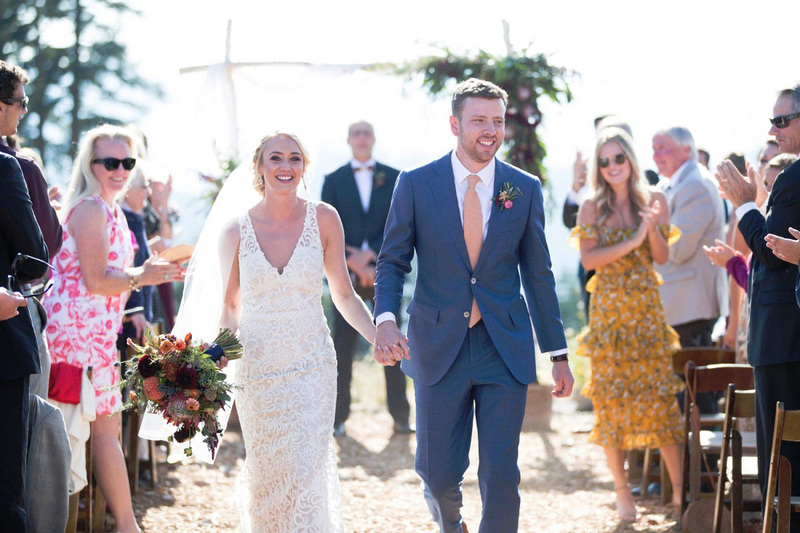 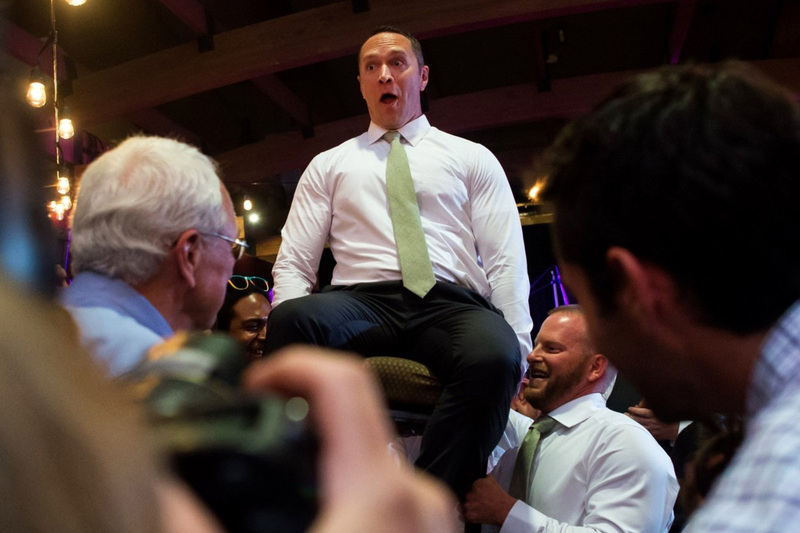 Congratulations to Sara Beth and Sam for elevating their relationship – and their wedding celebration – to a new level! 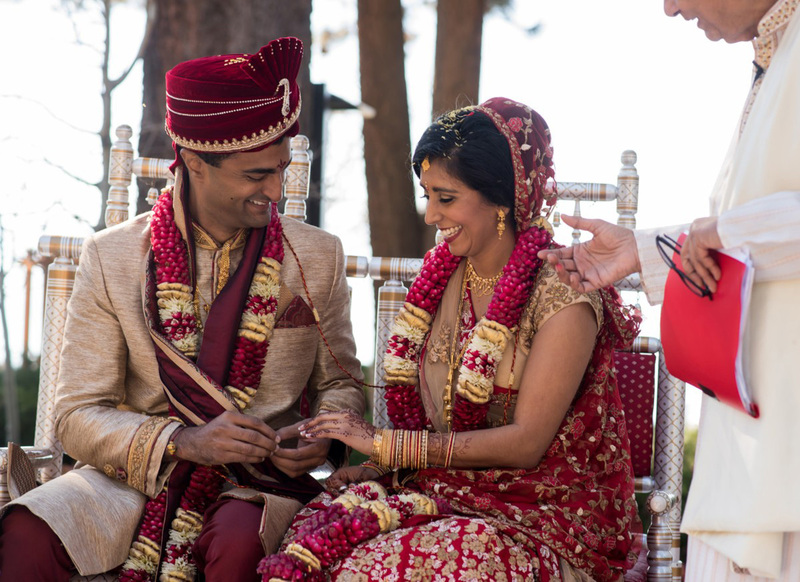 Like many couples, Amita and Sagar wanted to have a destination wedding to make their celebration memorable – and to have a bit of a vacation – both for their guests and themselves. 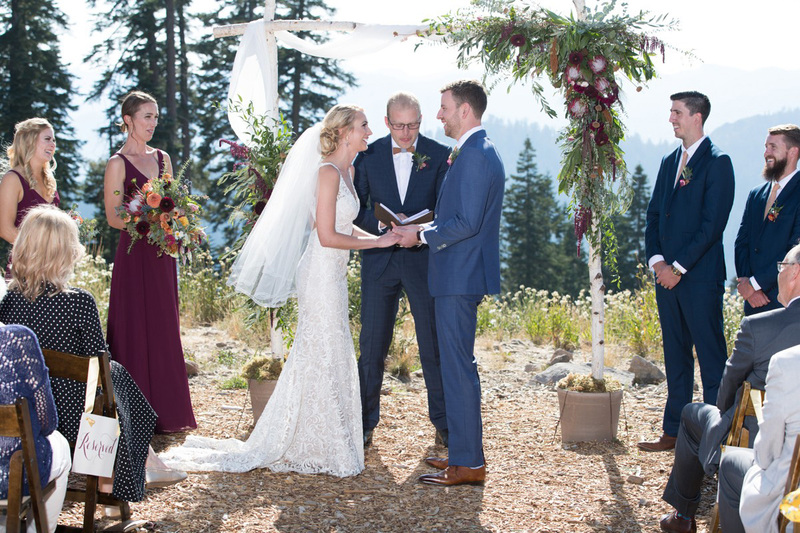 Since they love being out in nature and by the water, Lake Tahoe was the perfect choice for their wedding location. 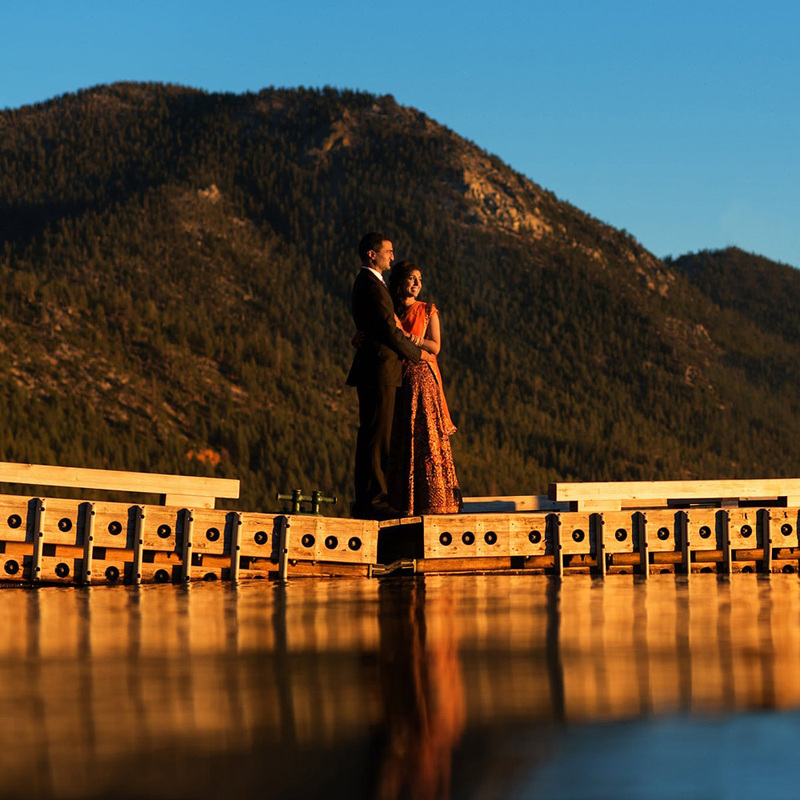 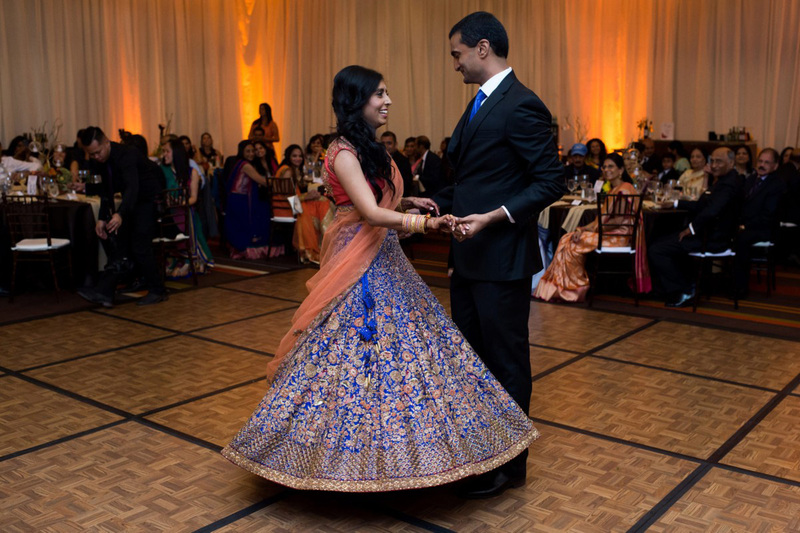 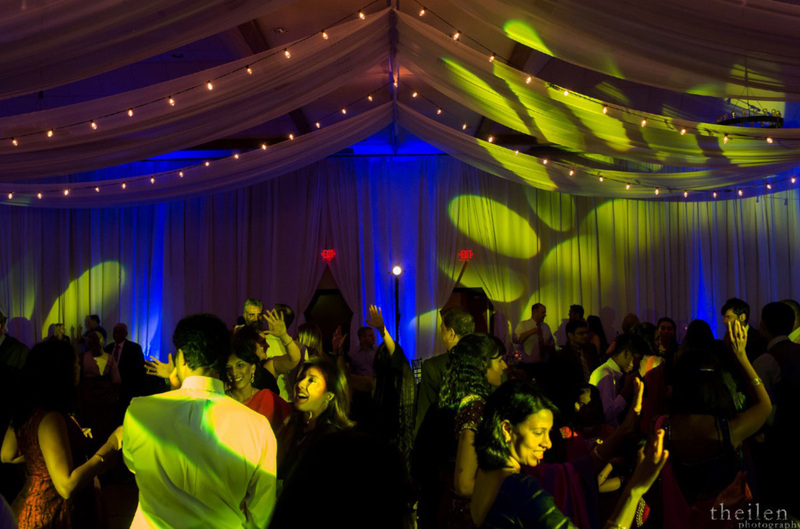 Amita and Sagar selected the Hyatt Regency Lake Tahoe as their wedding venue. 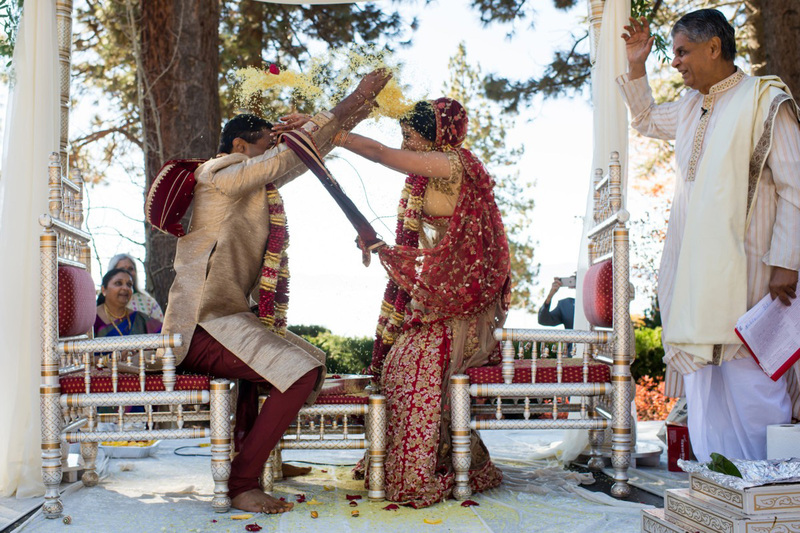 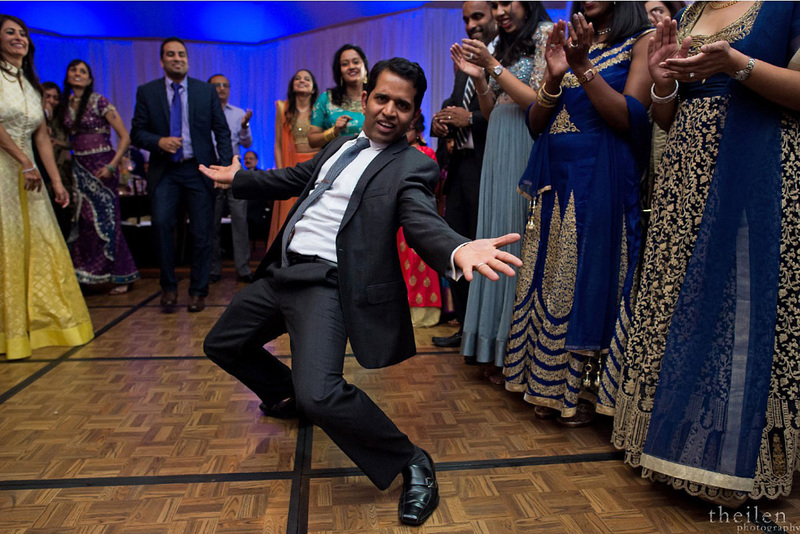 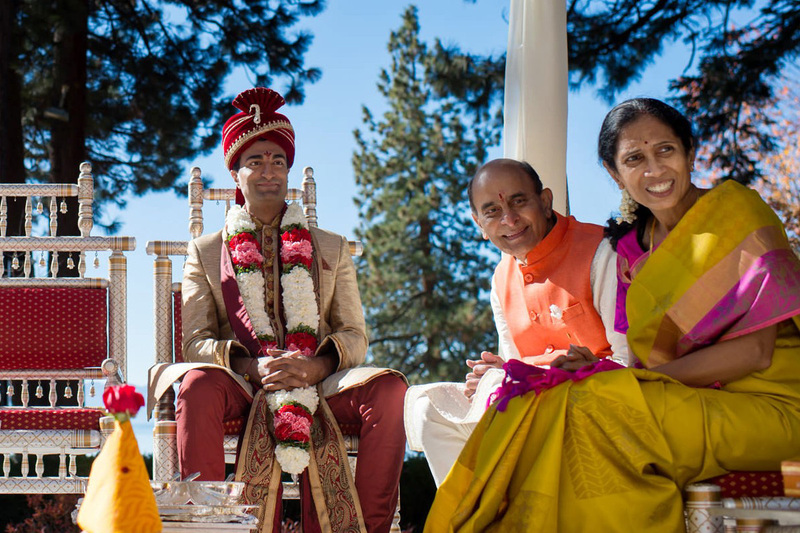 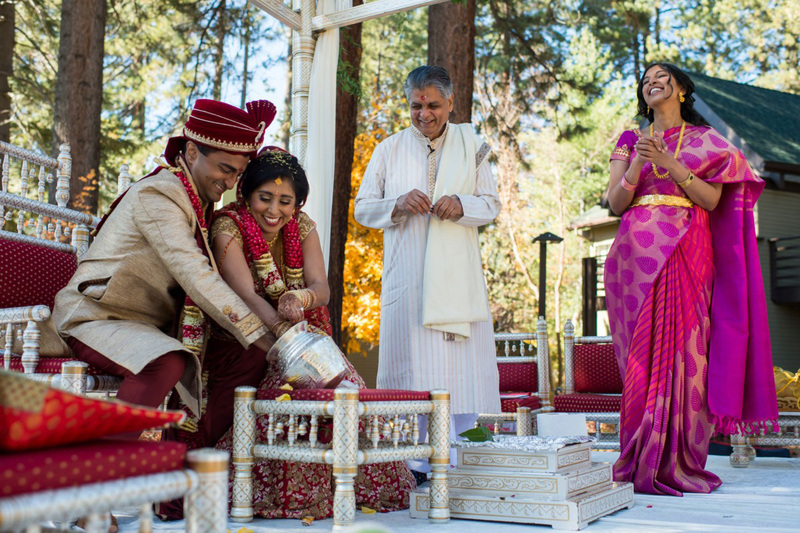 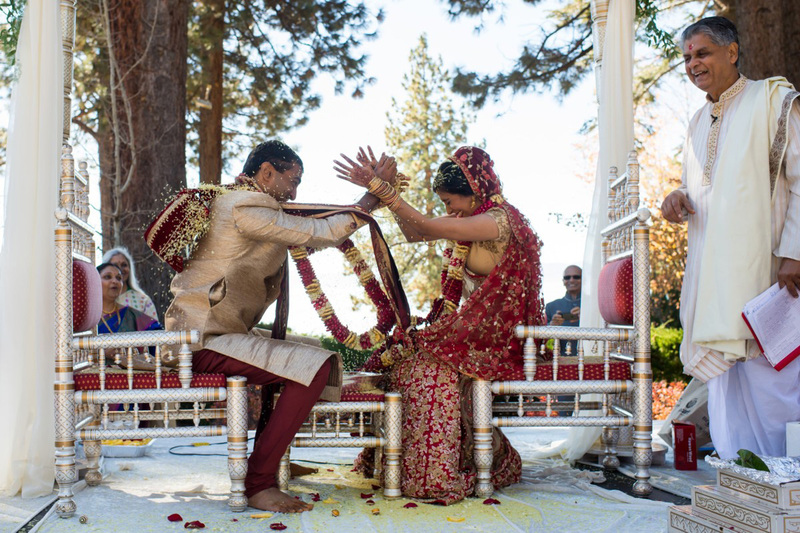 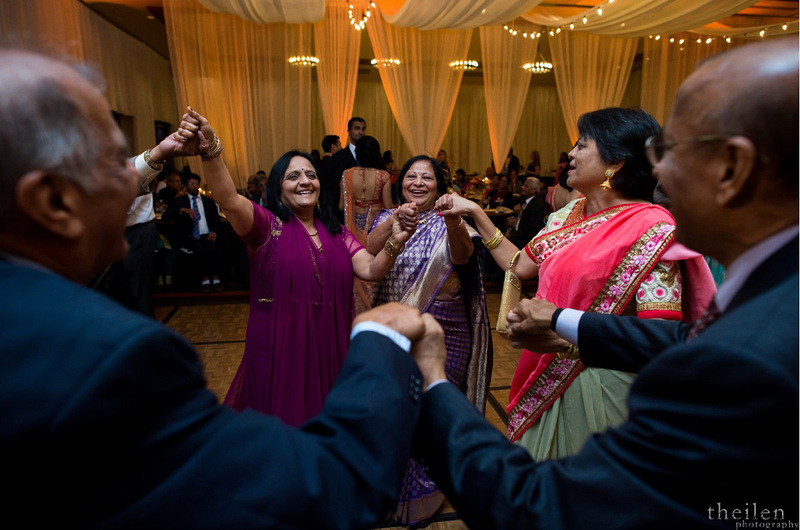 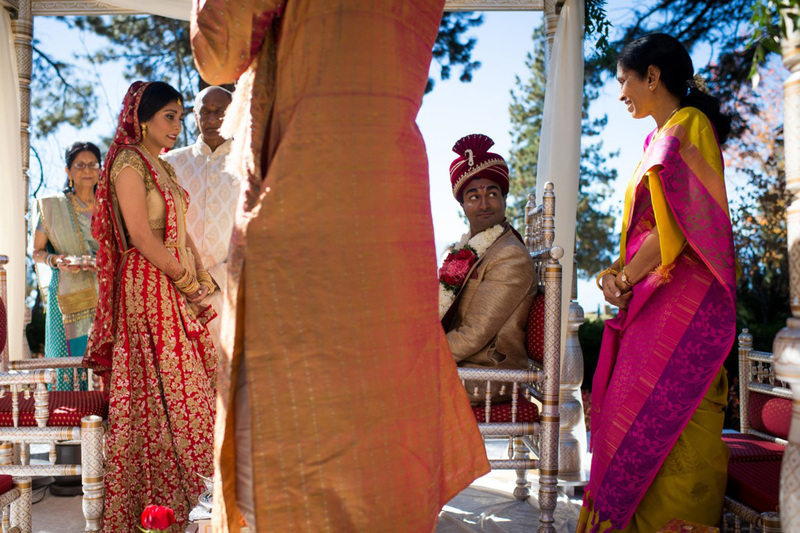 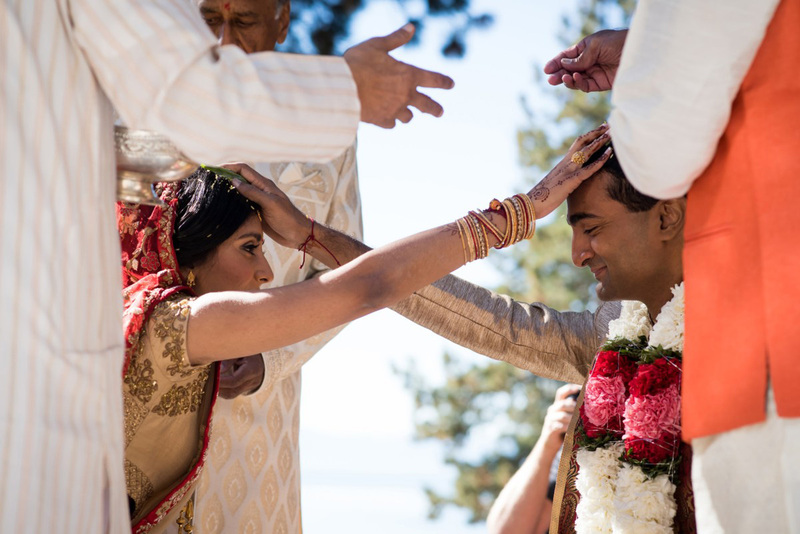 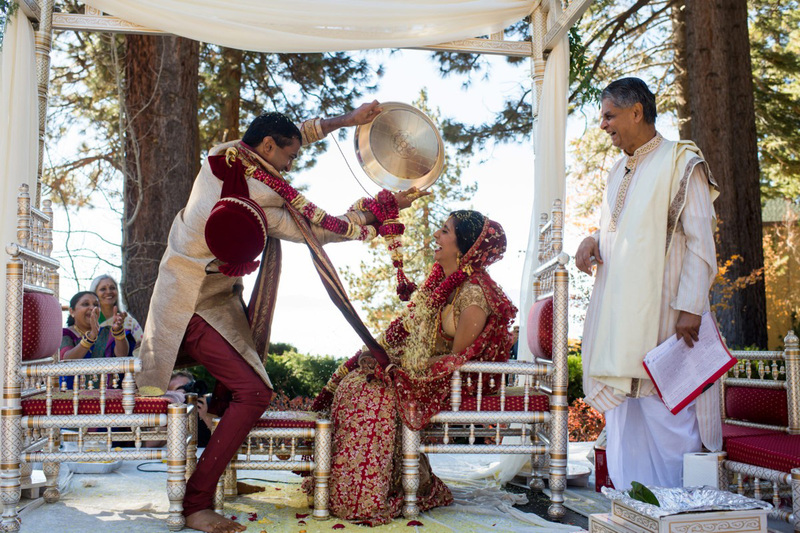 Their special day was picturesque, relaxed and fun – as beautifully documented by Tahoe-based Theilen Photography – full of the rich colors and customs of Indian weddings that have existed for hundreds of years. 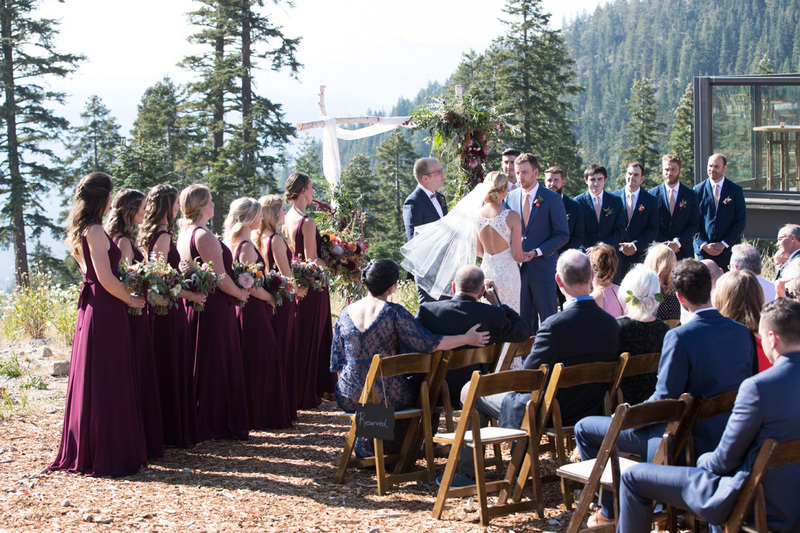 The lake, mountains and evergreens provided a majestic backdrop for the ceremony. 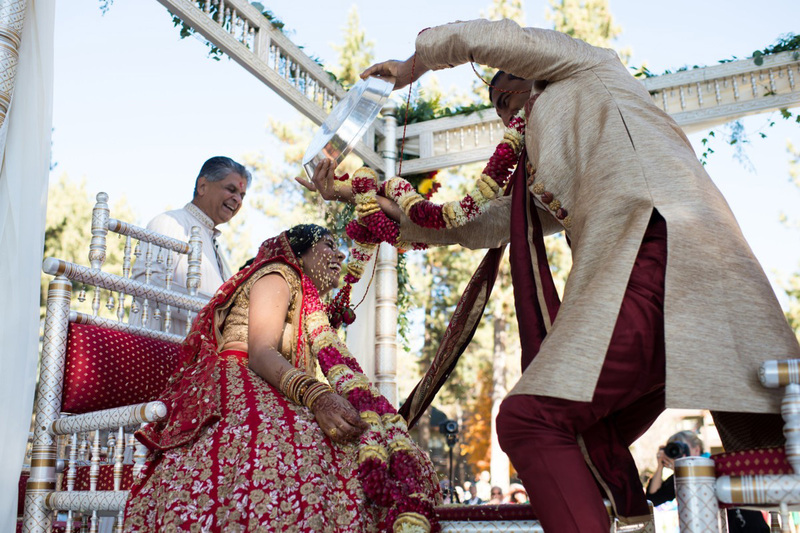 Amita and Sagar showered each other with turmeric-coated rice, which according to tradition, is supposed to bring the couple a life filled with happiness, love, and laughter. 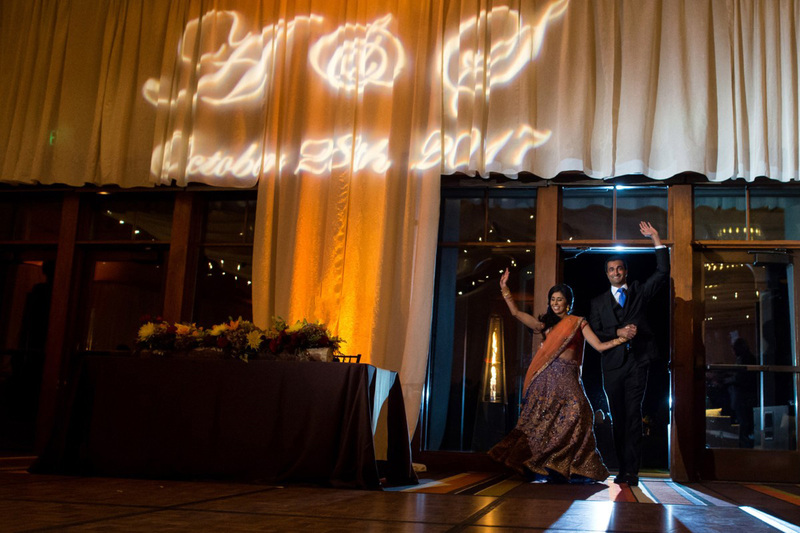 And judging by these photos, they are certainly off to a great start with that! 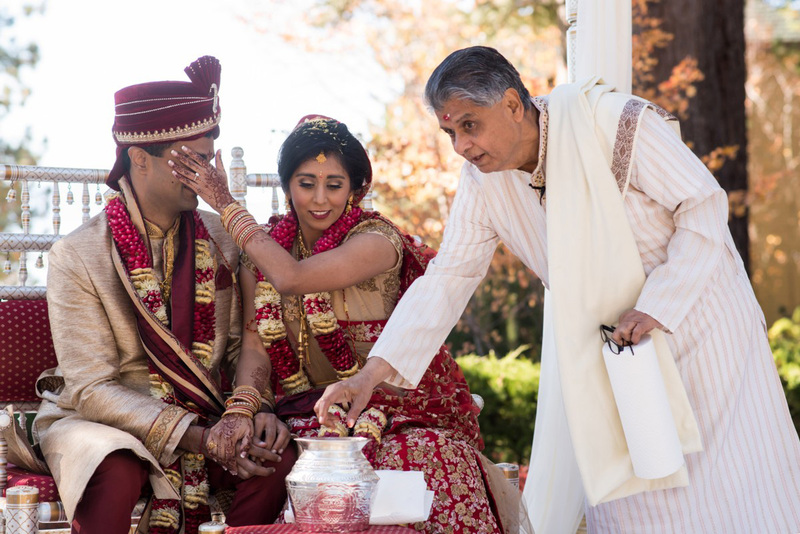 But one tradition that Amita felt was essential for celebrating their heritage was the Mehendi Ceremony, where a professional mehendi artist applies henna (a paste made from the finely ground leaves of the henna plant) in intricate designs to the hands and feet of the bride. 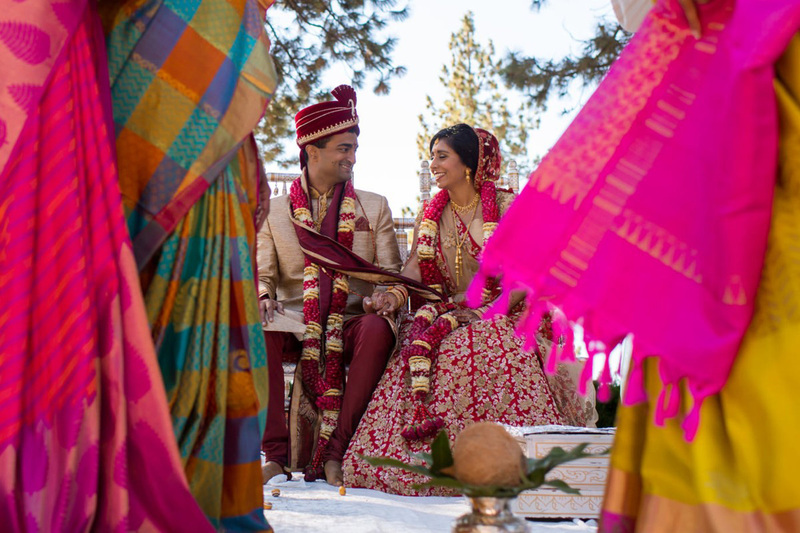 These designs symbolize joy, beauty, spiritual awakening and offering. 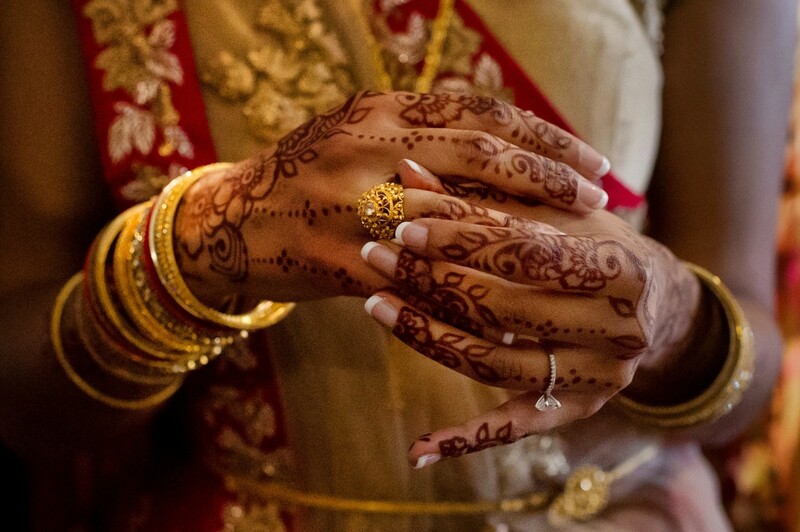 According to tradition, the darker the color of the bride’s henna, the more her partner will love her. 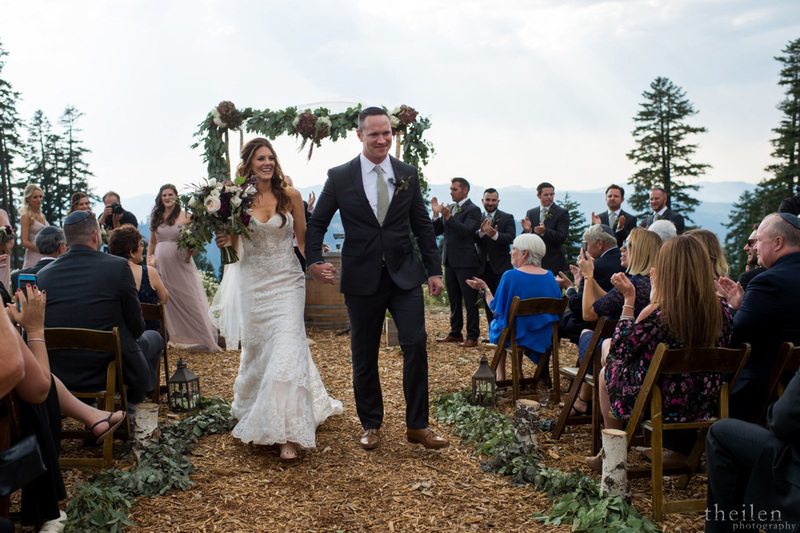 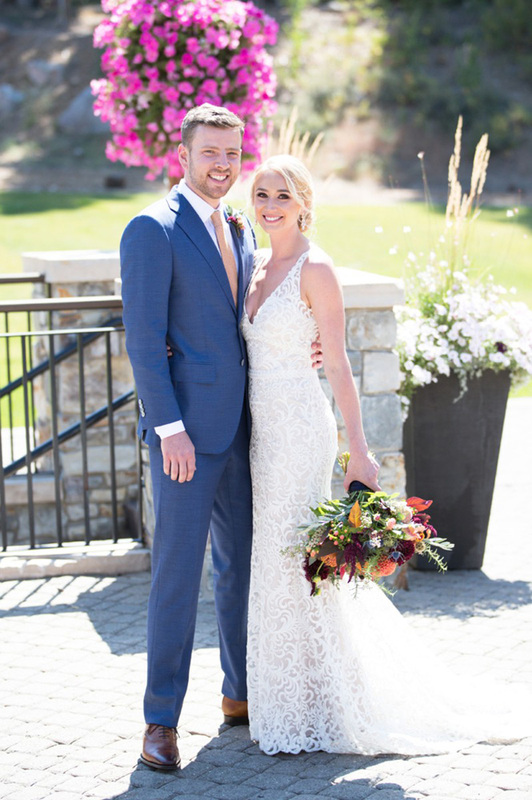 As the Director of Special Events at the Tahoe Mountain Club, Dana Rivers has helped couples plan their Lake Tahoe weddings for the past six years. 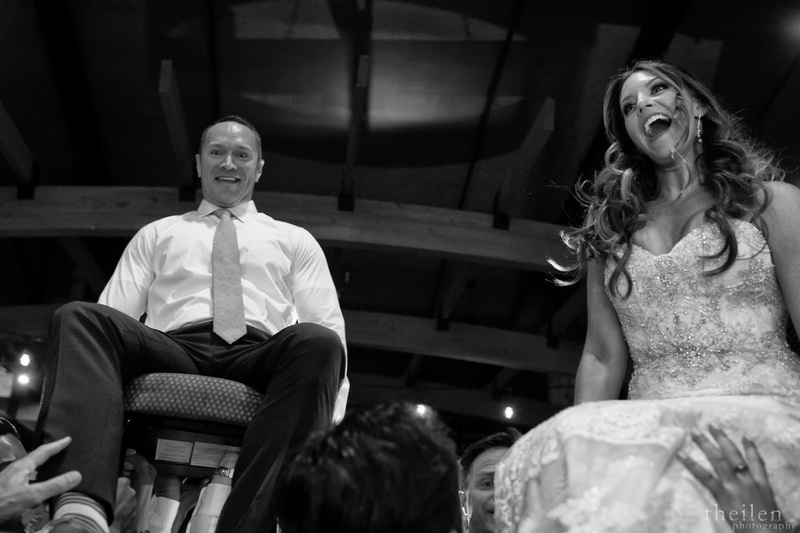 Recently, Dana celebrated her own special day. 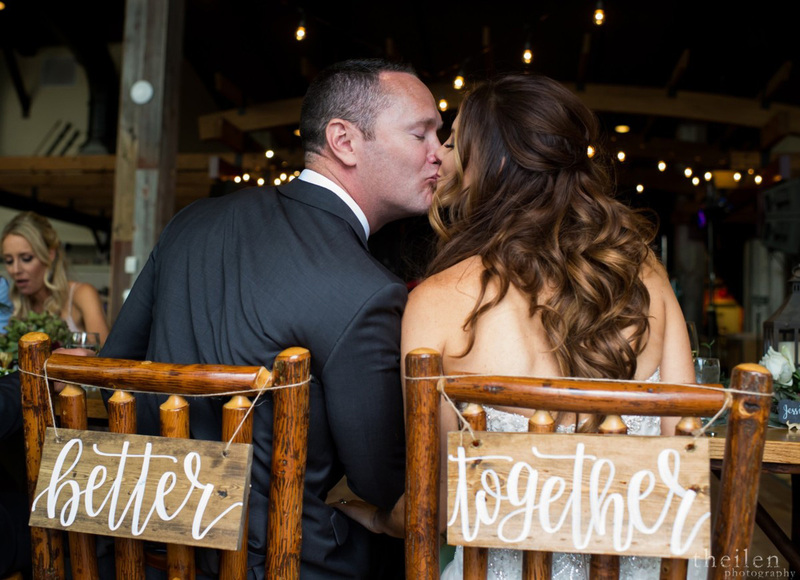 So, having seen the planning process from the perspective of a bride, as well as an industry professional, Dana is in a unique position to offer advice to engaged couples. 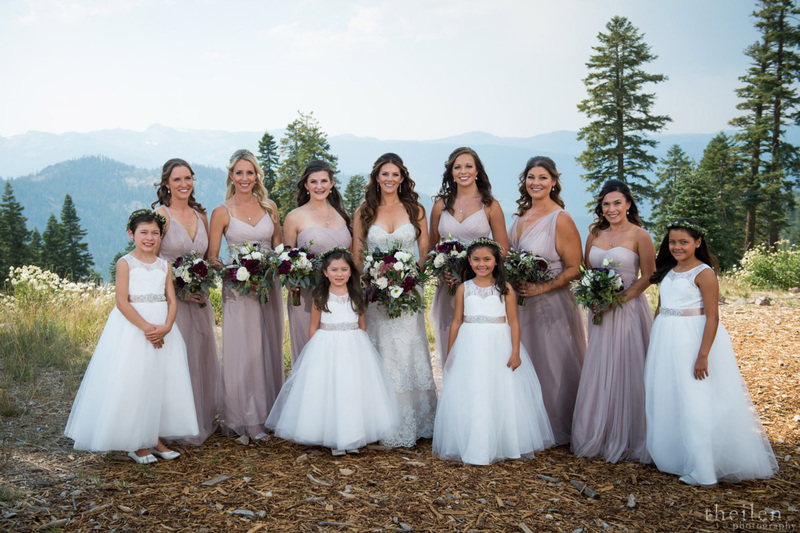 Tahoe Engaged is delighted to share the story of Dana’s wedding. 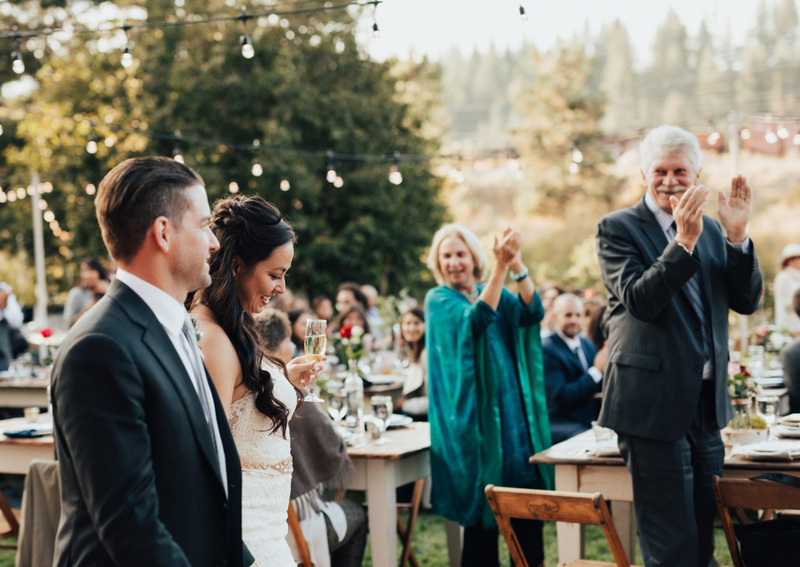 Along with this story, Dana also offers her knowledgeable suggestions for a successful celebration. 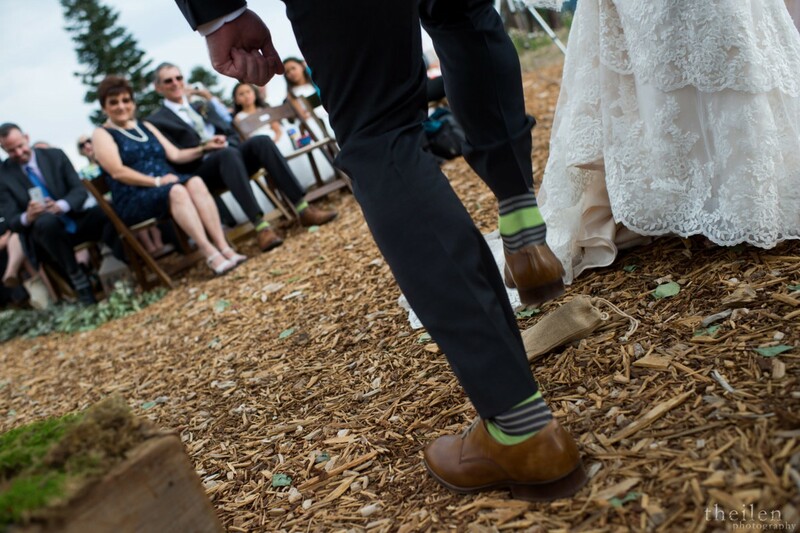 Never second guess yourself. 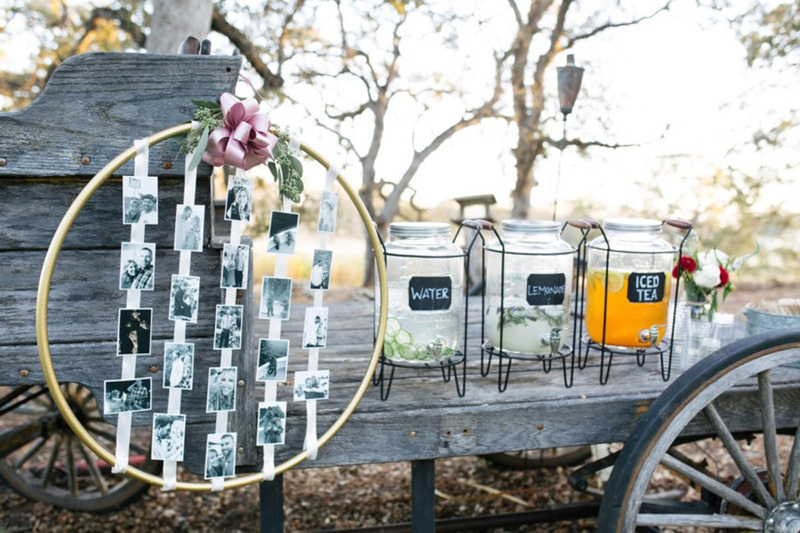 Never stray from your ideas and decisions. 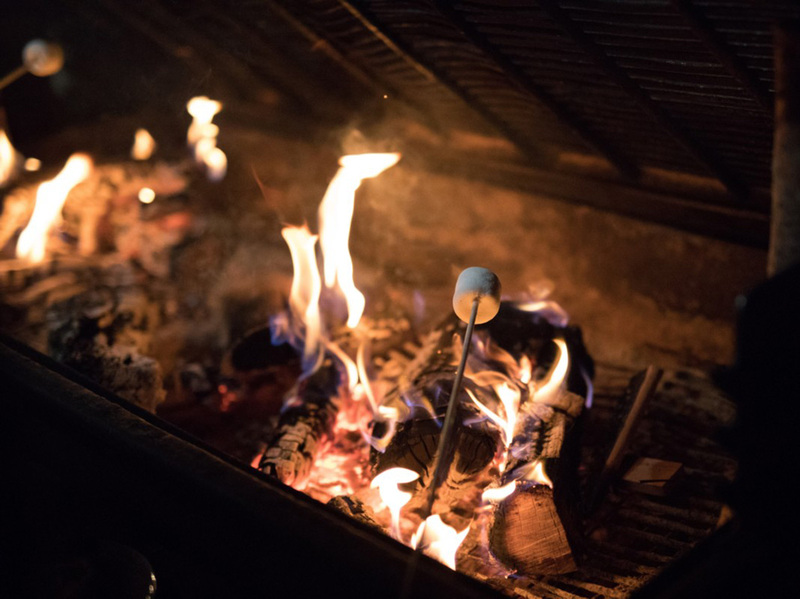 Once you make a decision, stick with it! 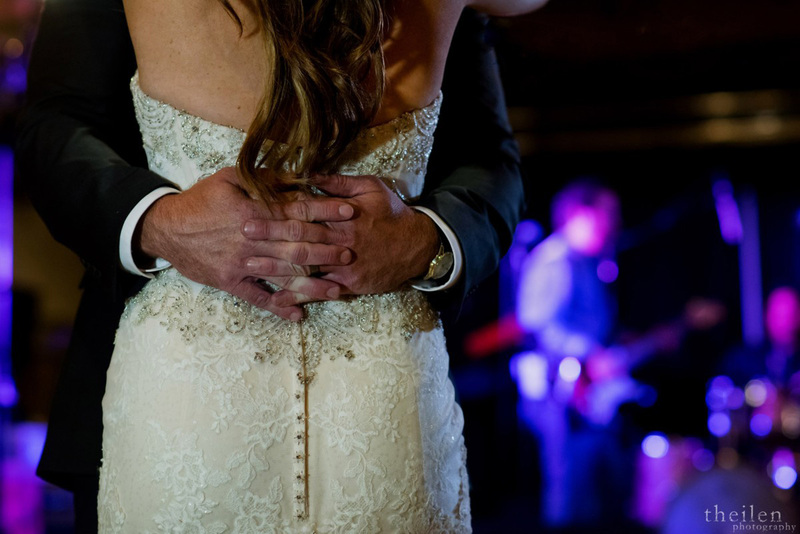 So how did this love affair begin? 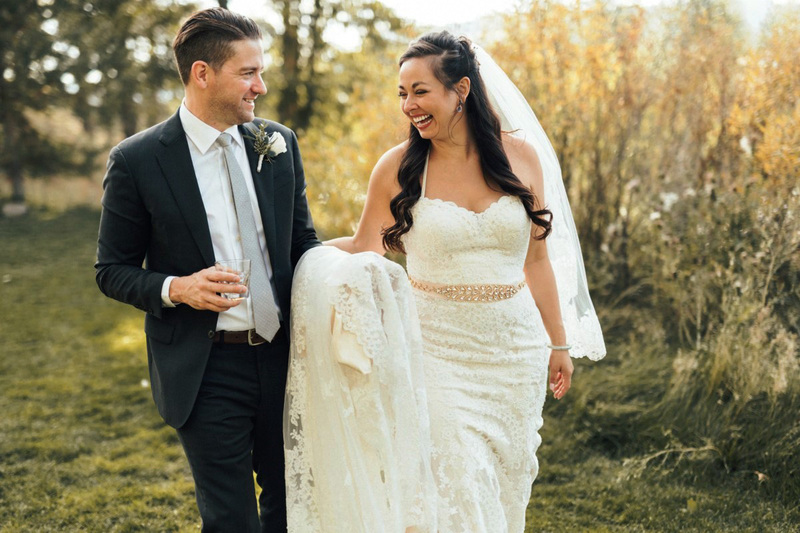 Dana and Jack actually met through an online dating site called Tinder. 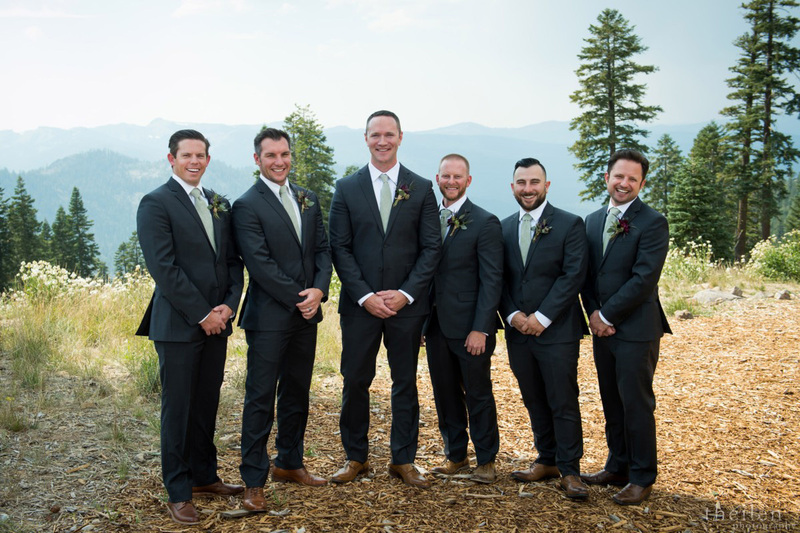 Jack was living in South Lake Tahoe at the time. 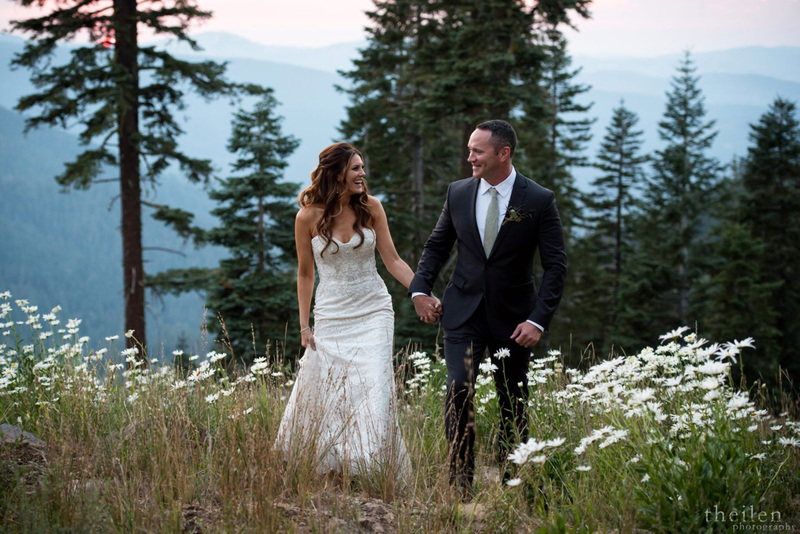 Although the drive to Truckee to see Dana was spectacular, it took more than an hour each way. 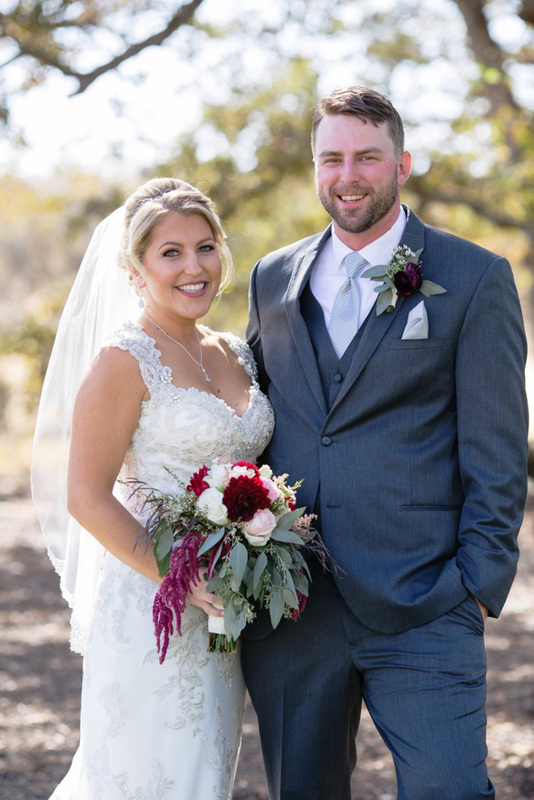 After 9 months of dating, Jack decided Dana was “the one,” so he made the move to be with her all the time. 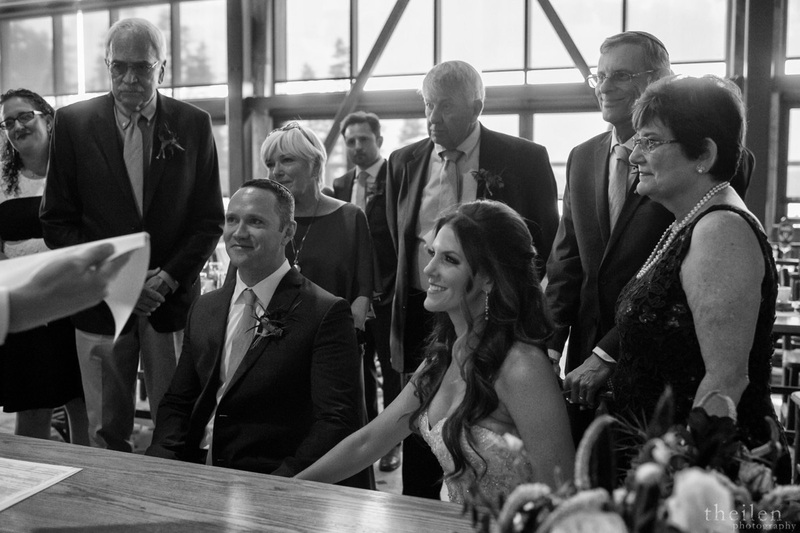 In October 2016, Jack took it upon himself to ask Dana’s grandfather for permission to marry Dana before he passed away from cancer. 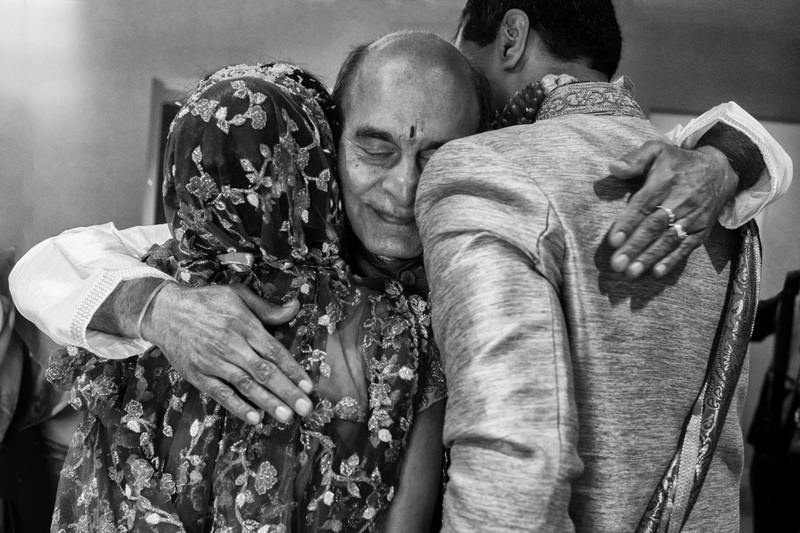 (Dana loved and adored her grandpa.) 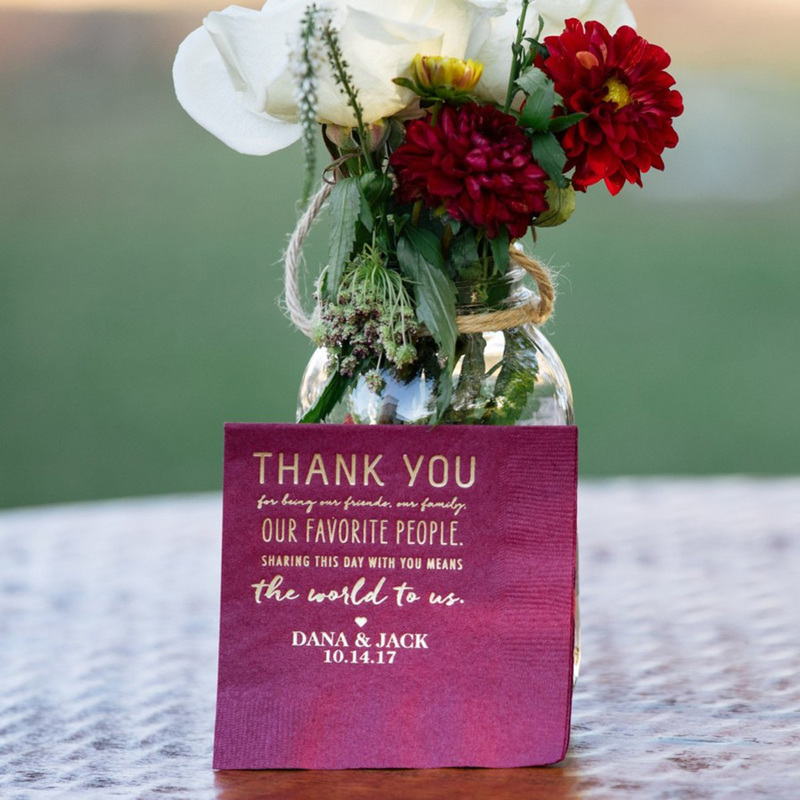 Then Jack conferred with Dana’s mom to select an engagement ring, and he securely packed the ring away for what was to come. 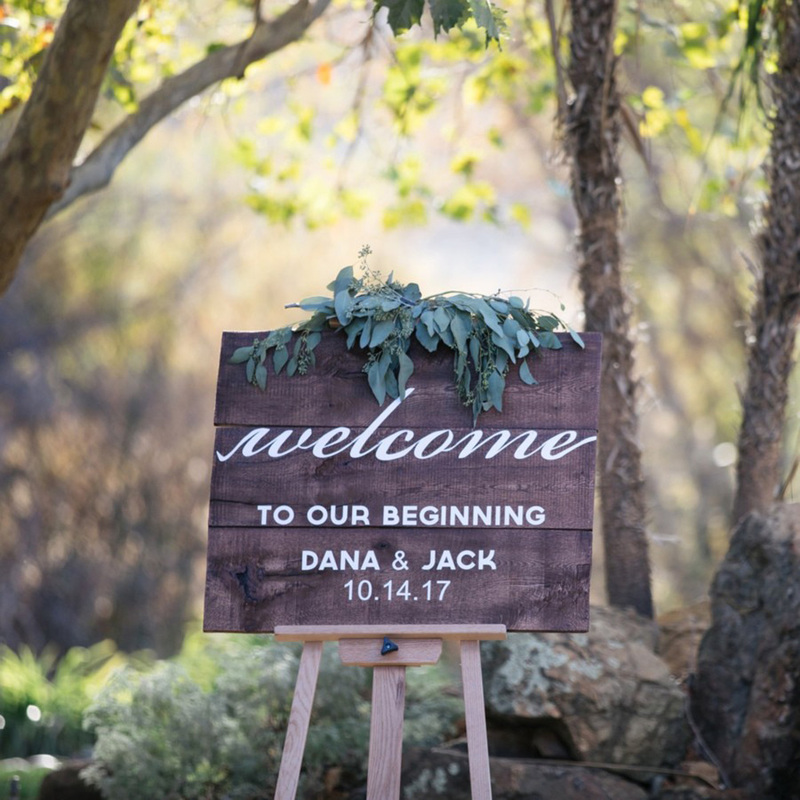 The following month, Dana & Jack, along with two of their friends, took a 2-week vacation to New Zealand. 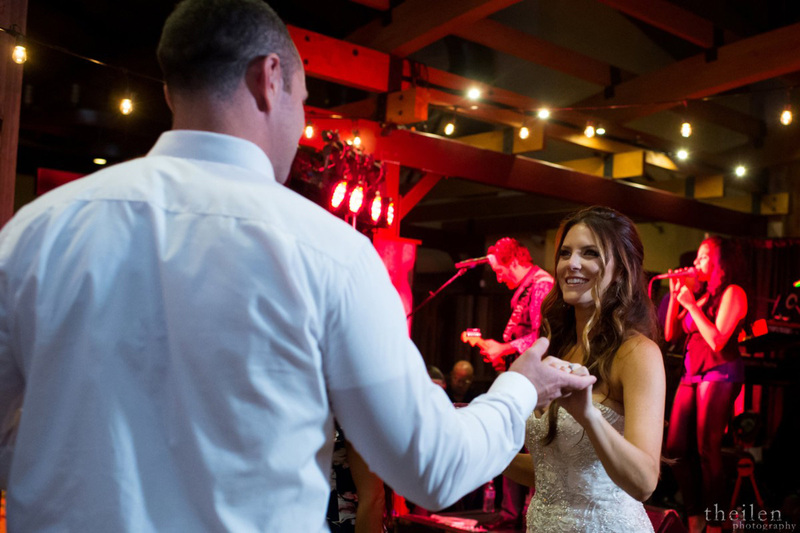 The highlight of their trip was a boat cruise on spectacular Milford Sound. 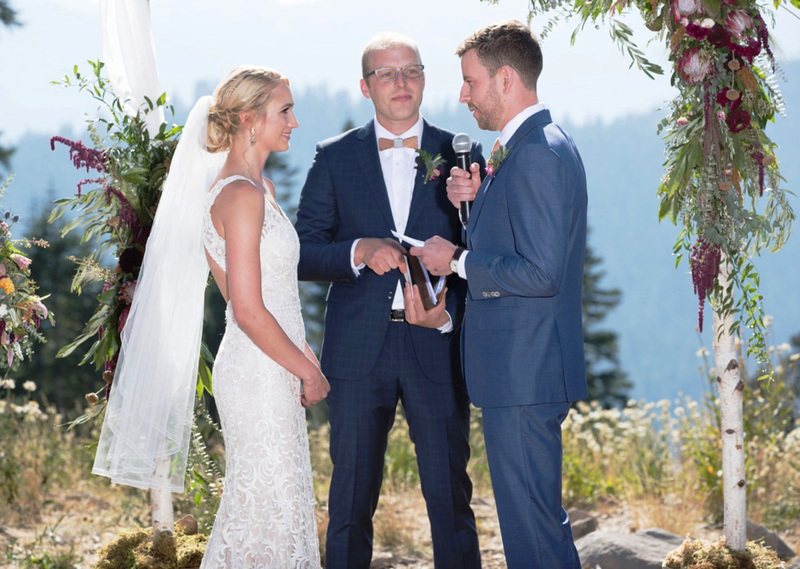 As the boat passed in front of a gorgeous waterfall, Jack pulled out the ring and popped the question. 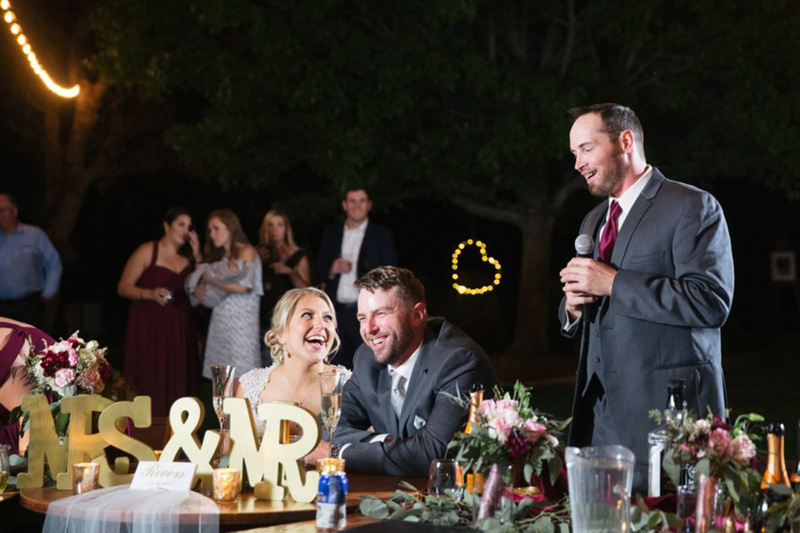 Although it was a cold and rainy day, and Dana was soaking wet, she delightedly screamed “YES!” The two friends who were traveling with them were tipped off about the “surprise” proposal, so they were ready with their cameras. 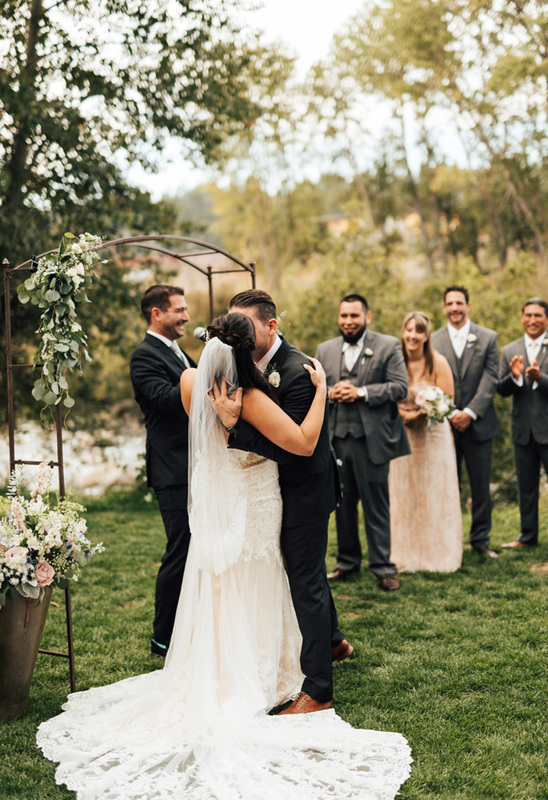 Following a recommendation from their photographer, Andrew and Melanie Photography, the couple ended up securing the River Highlands Ranch near Grass Valley for their wedding venue. 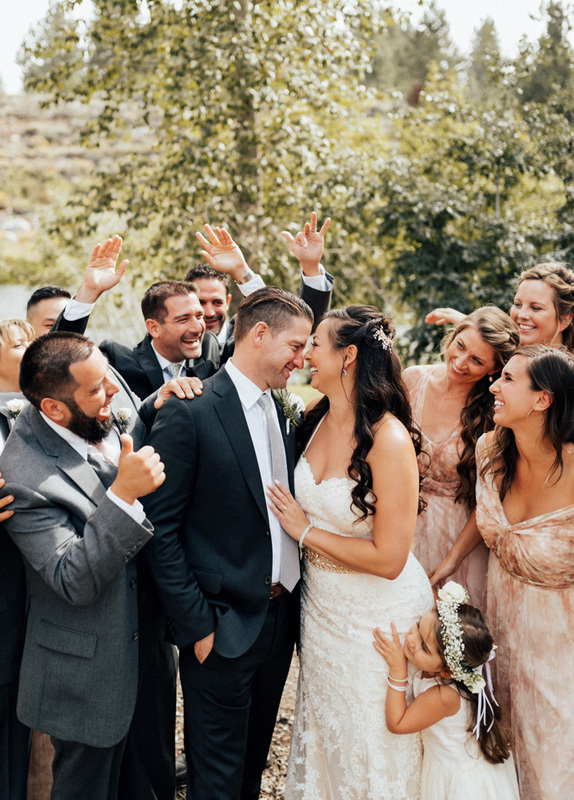 So this was a destination wedding, as Jack is originally from Idaho and Dana’s family traveled from Southern California. 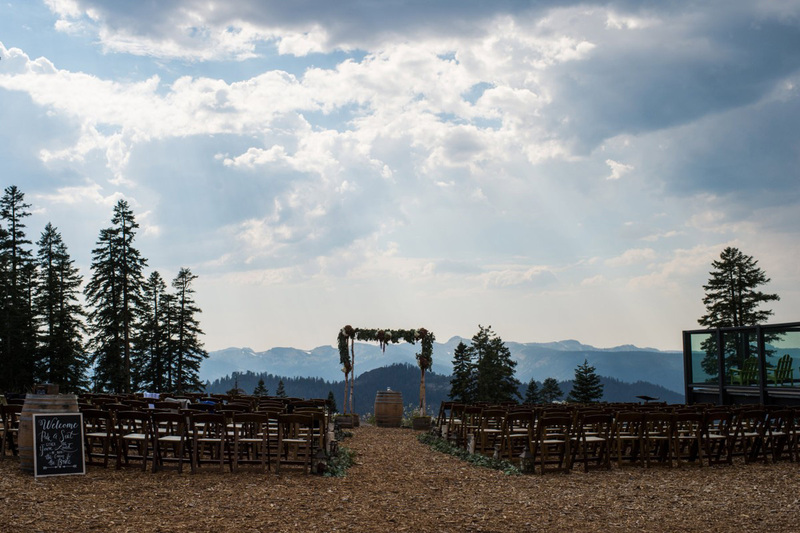 To make it easier for out-of-towners to get to their gathering, the couple arranged for a room block at the Gold Miners Inn in Grass Valley. 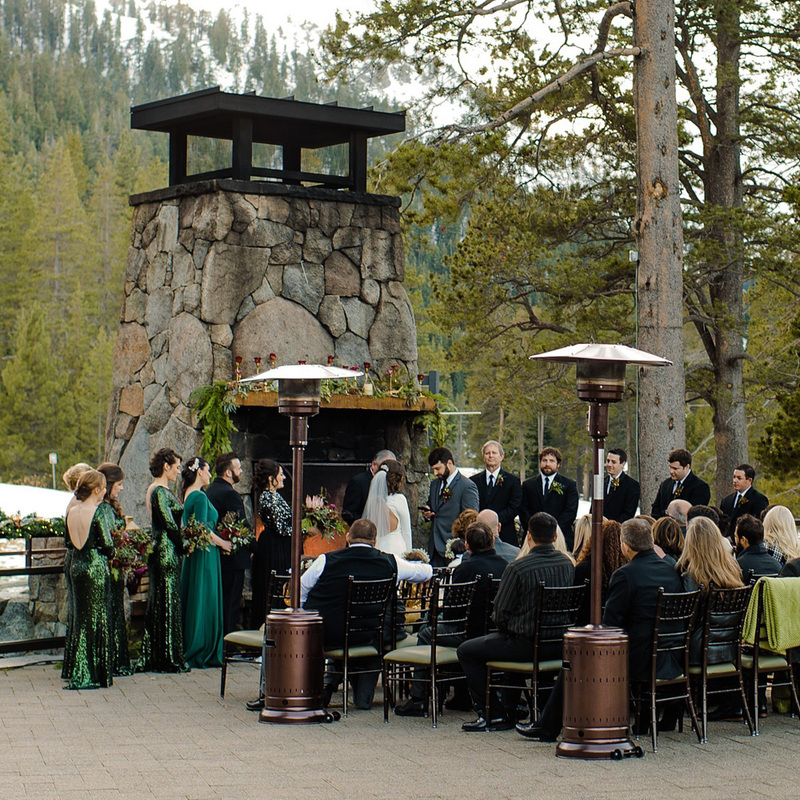 It’s never too early to start planning your wedding. 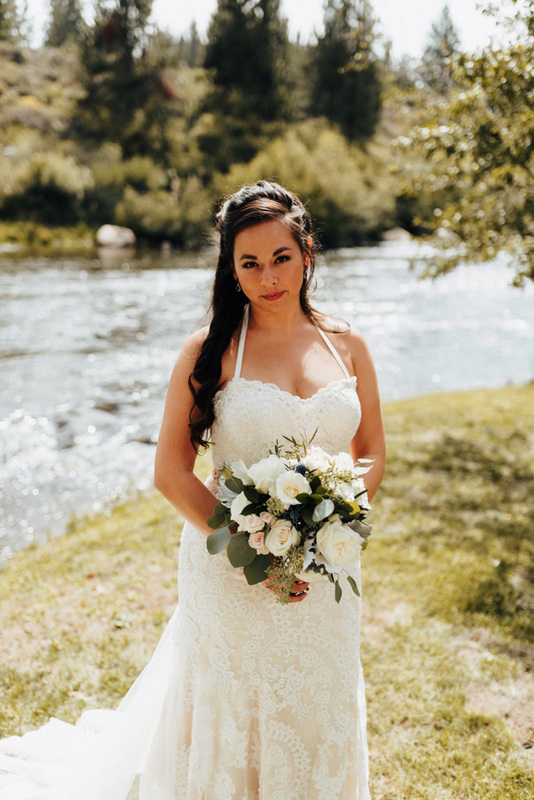 My whole goal was to not get stressed out in the last month. 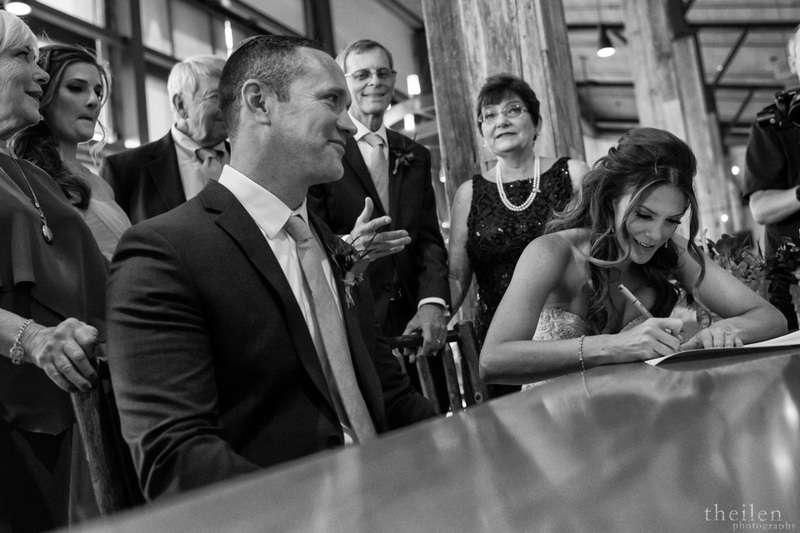 I didn’t want to be overwhelmed, and I recommend you try to get things done as soon as you can. 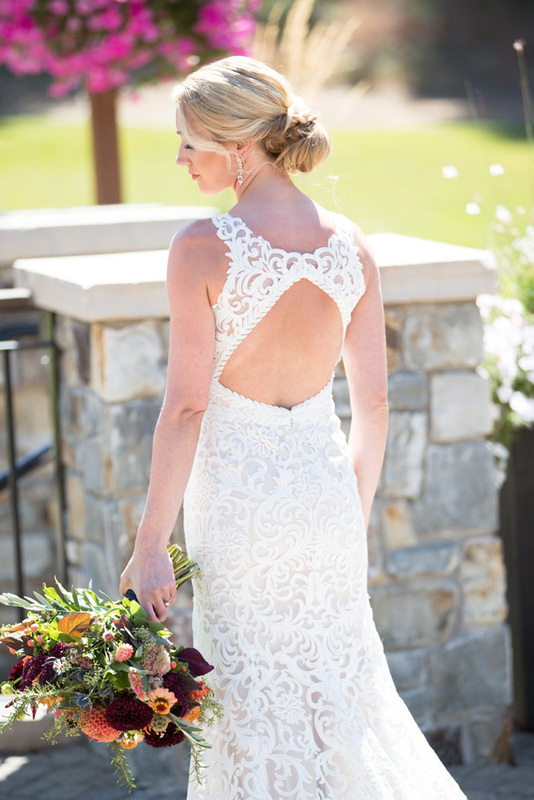 For her hair, Dana definitely wanted to show off the back of her gown. 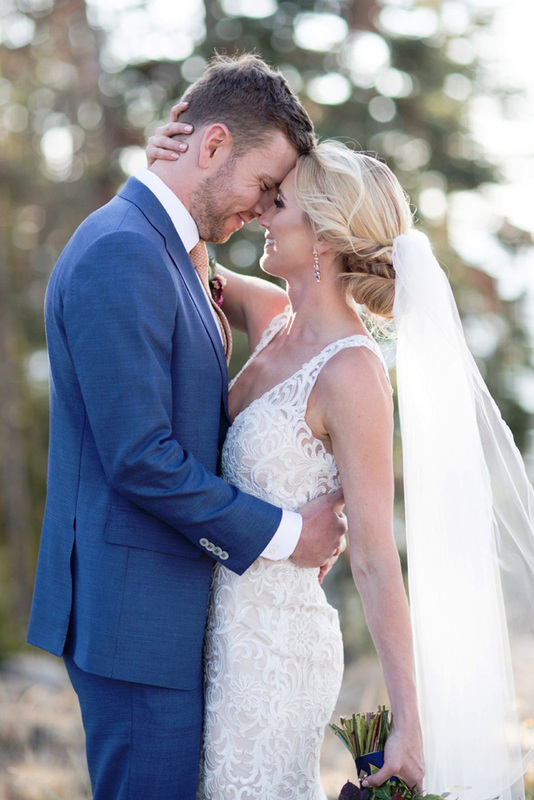 “I made a joke before my wedding that I was going to walk down the aisle backwards because I was just so in love with the back of my dress!” So she chose an up-do for her hairstyle, with little curls pulled around the sides of her face. 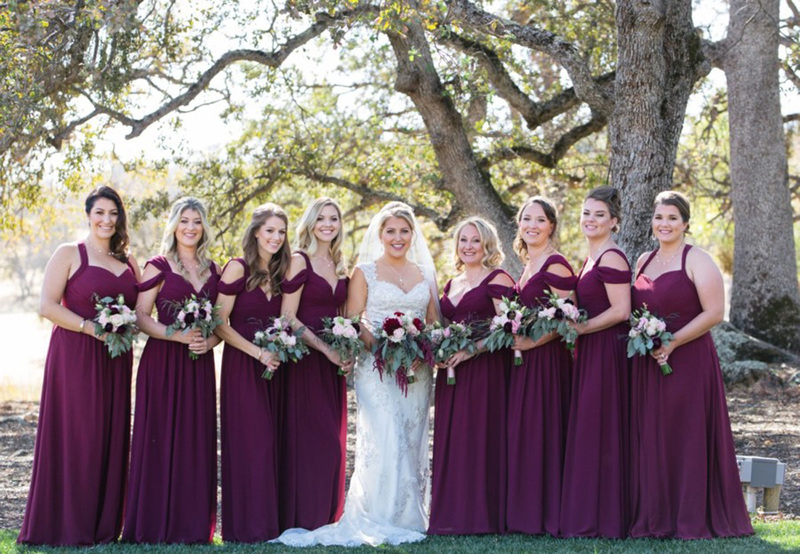 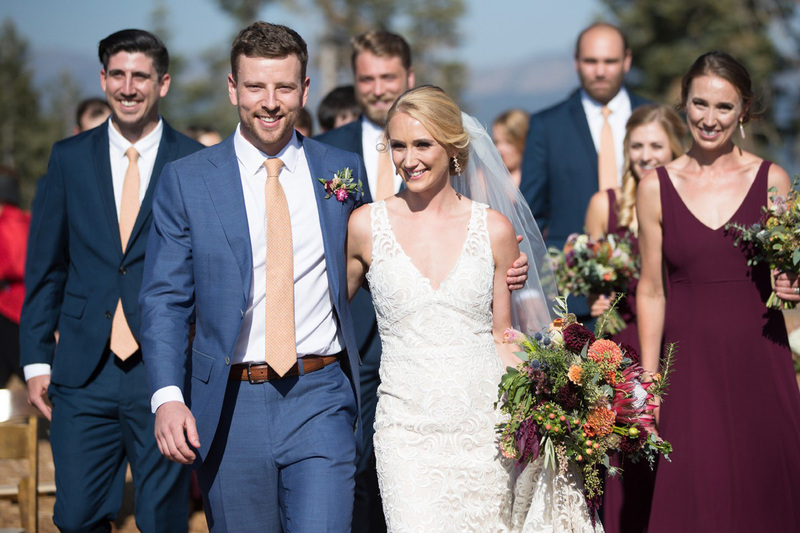 Dana’s eight bridesmaids wore off-the-shoulder long burgundy dresses, while Jack and his six groomsmen wore charcoal gray suits with burgundy ties. 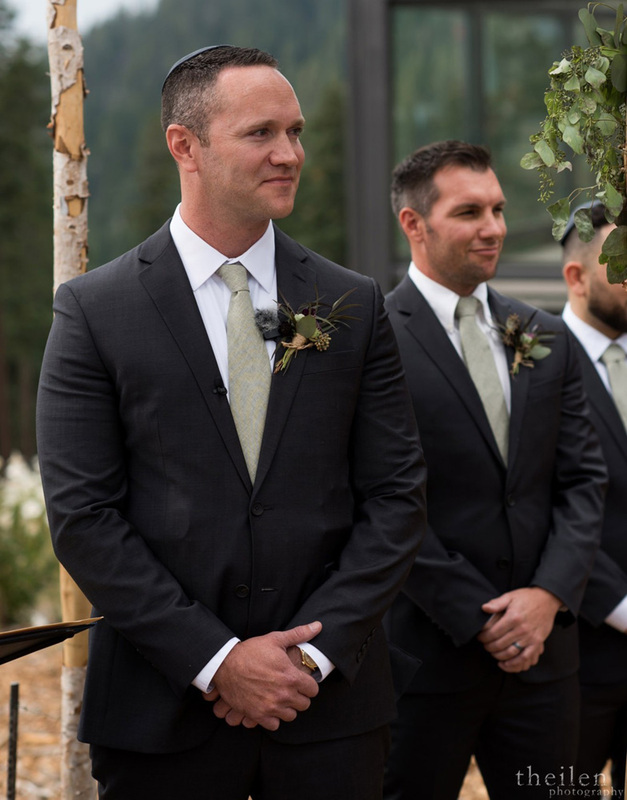 I always imagined him seeing me for the first time walking down the aisle. 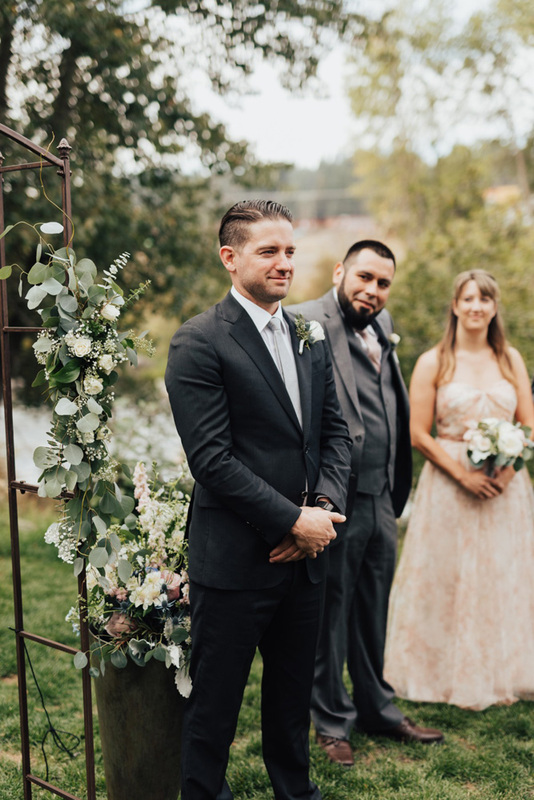 But on such a big day, I knew the time was going to fly by. 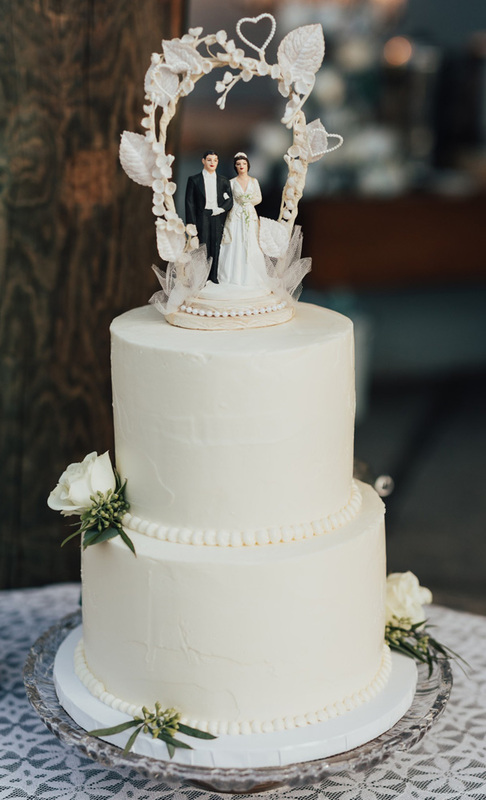 I really wanted to make sure that I made the most of the timing of the day. 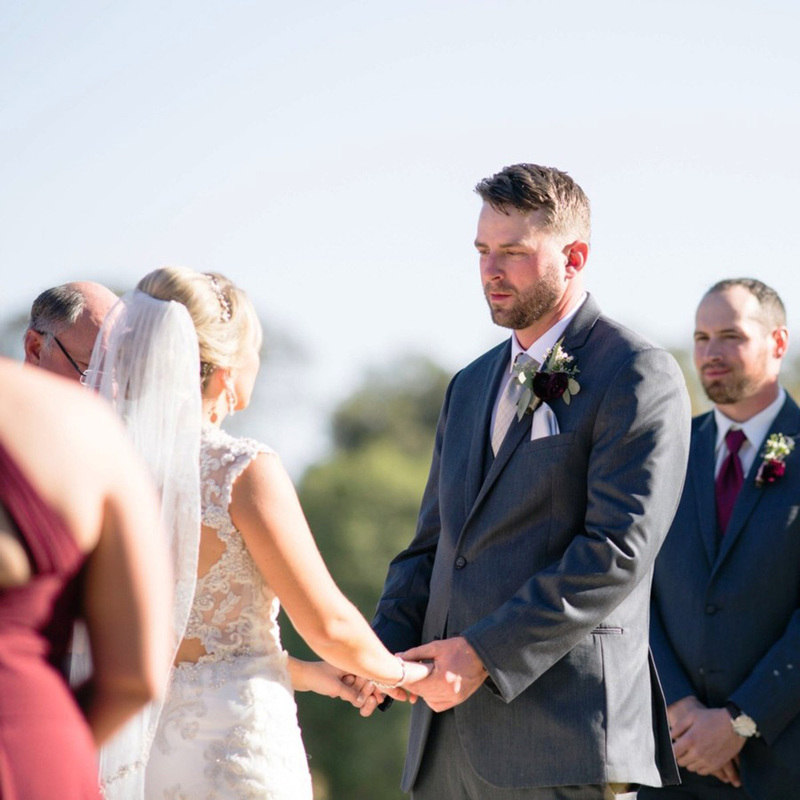 I also wanted just that private moment with Jack before the ceremony. 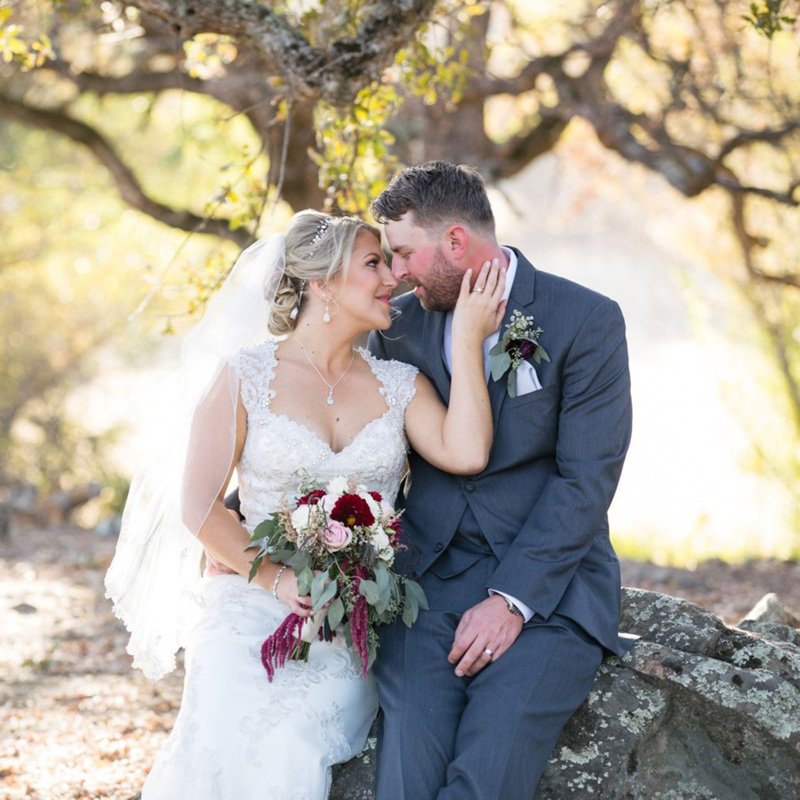 So we did do a First Look. 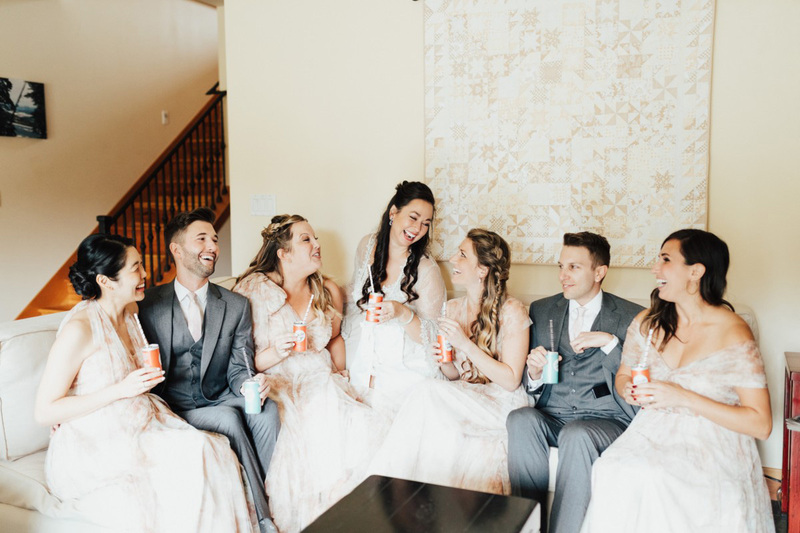 We then did our pre-ceremony photos with the wedding party, and I’m glad we did! 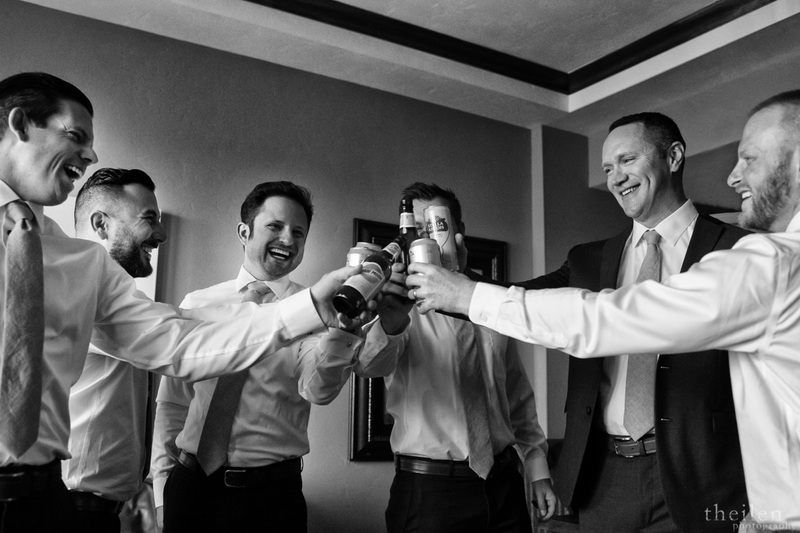 It relaxed my excitement and allowed us to enjoy our cocktail reception. 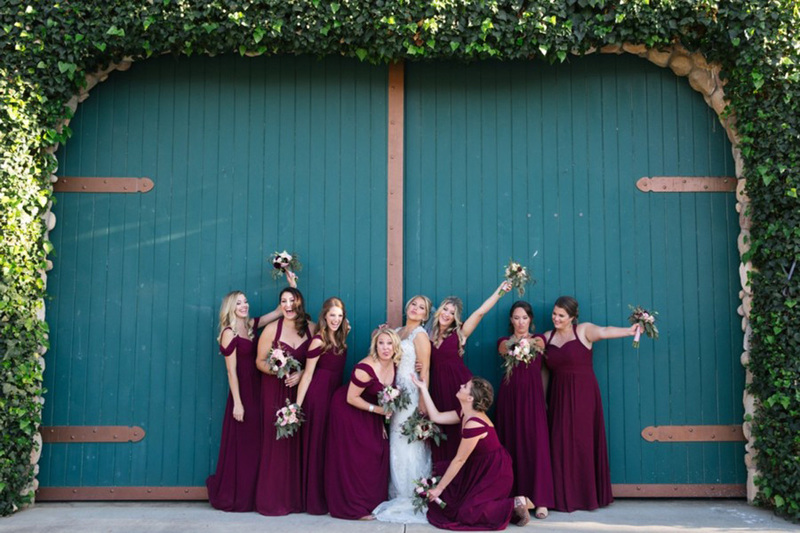 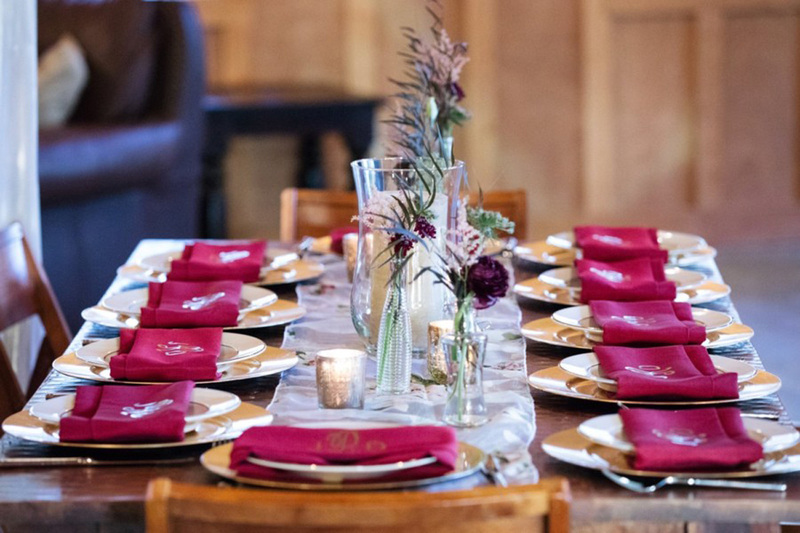 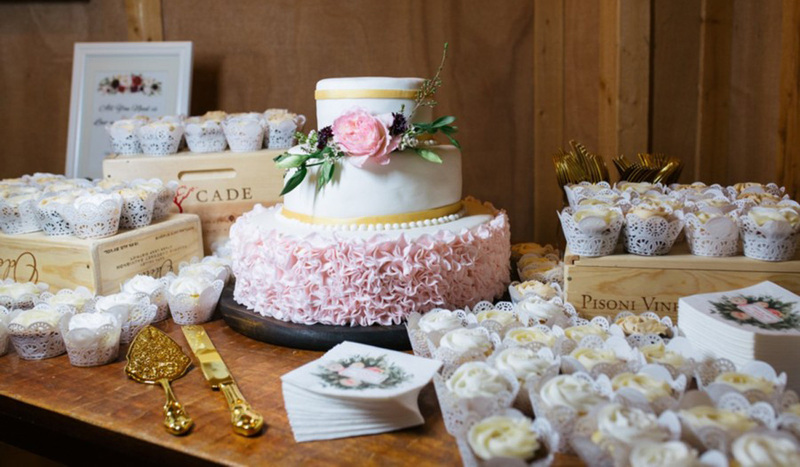 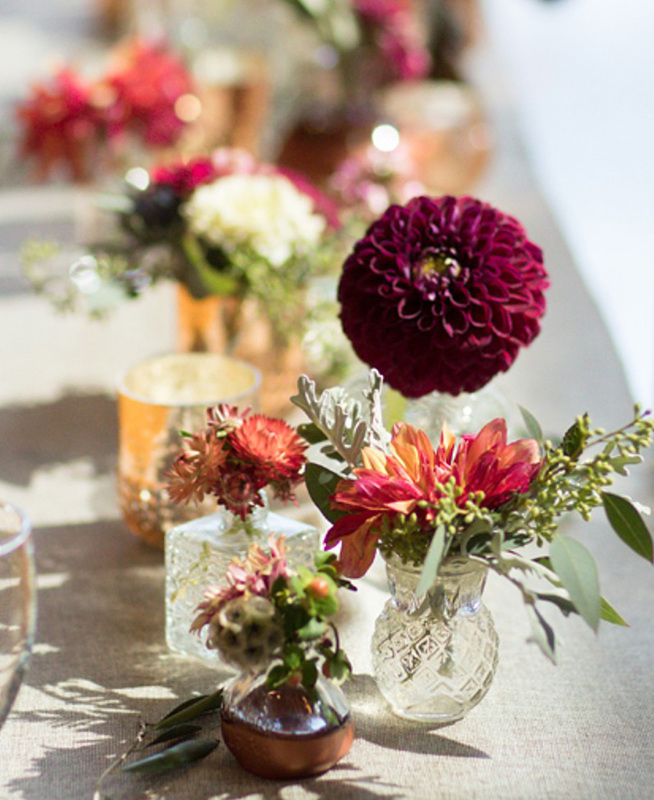 Dana loves the color gold, so she knew she wanted to incorporate hints of gold with burgundy blush tones in the color palette, with greenery to keep it natural. 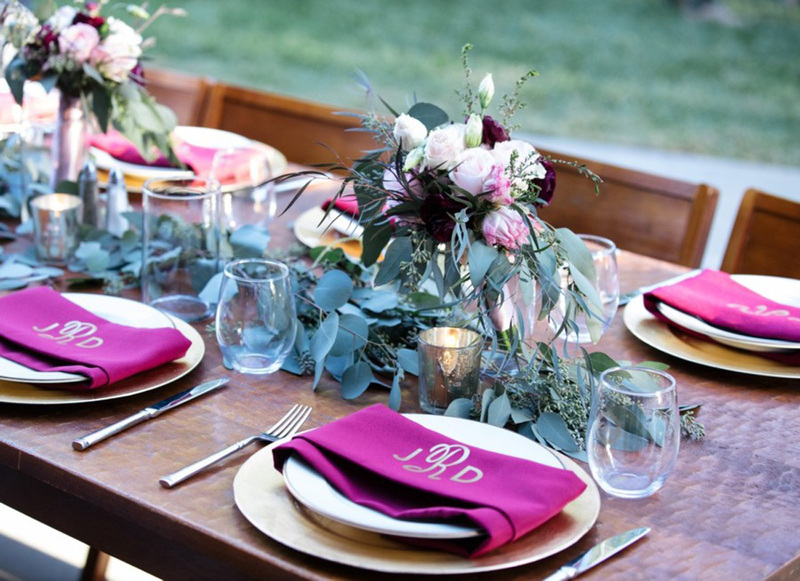 Dana personally monogrammed napkins with their initials for all 150 guests, a keepsake that she now has a full set of. 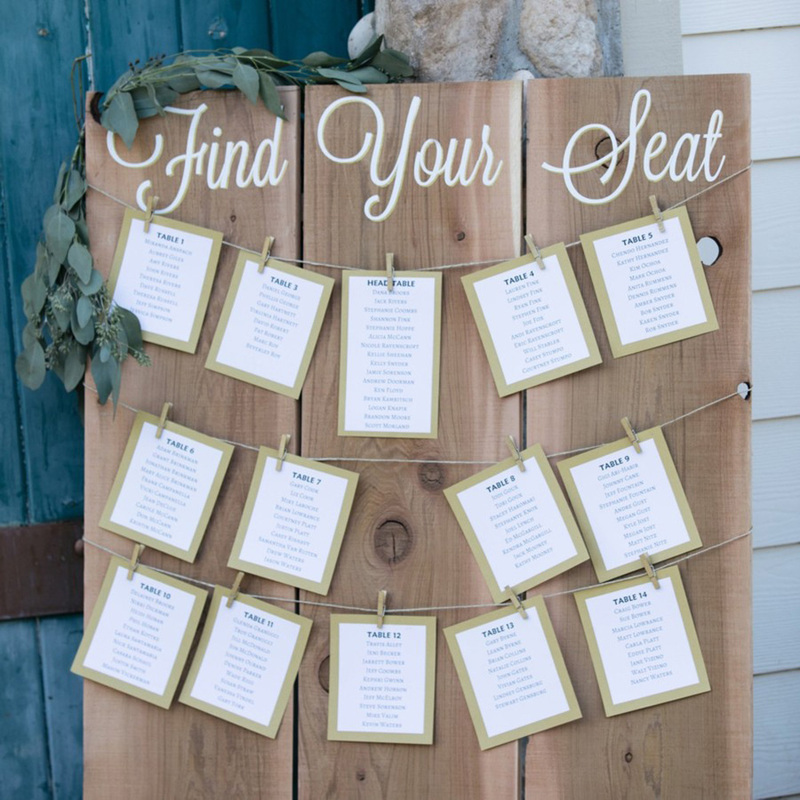 Jack constructed the seating chart using wooden planks, and he also made the signage for the wedding. 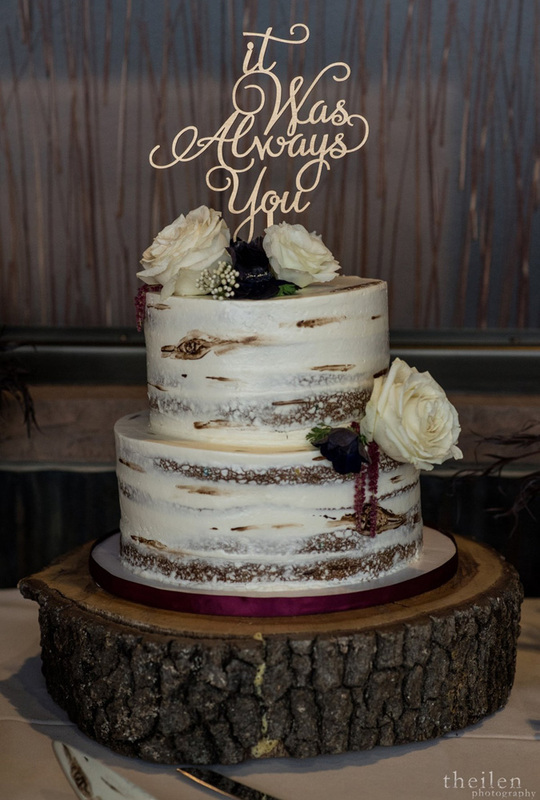 One of Dana’s bridesmaids gifted a beautiful leather-bound guestbook, designed by the bridesmaid’s brother-in-law, who has a leather-making company. 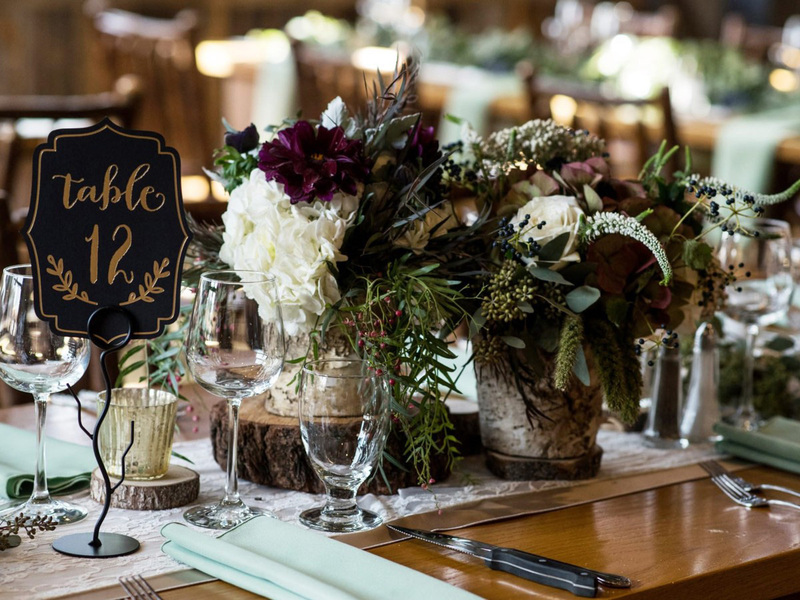 As a labor of love, friends from Dana’s work furnished all of her personal flowers, as well as the ceremony and reception flowers. 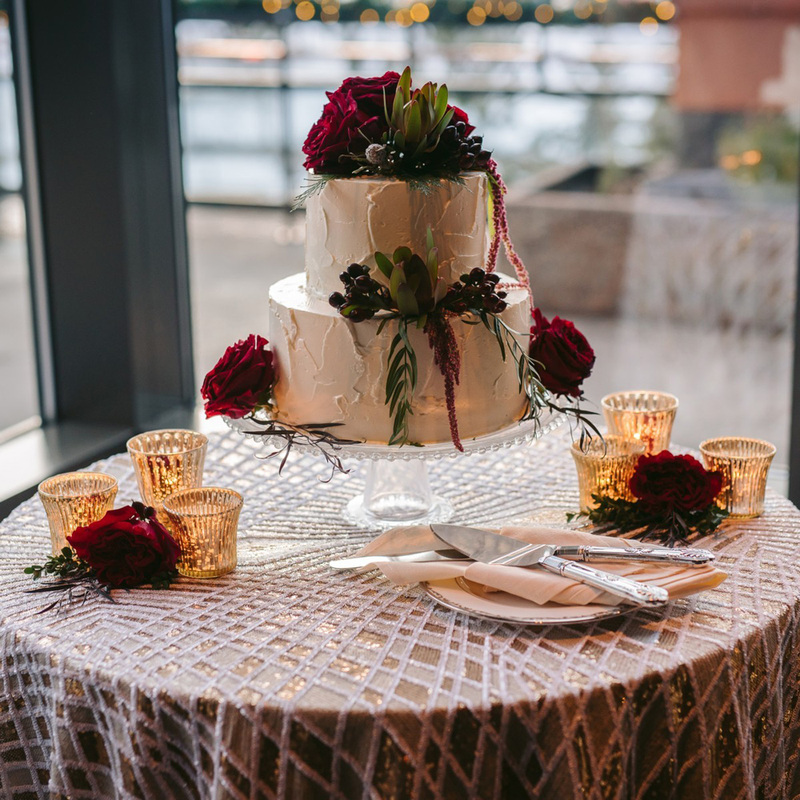 Another co-worker made Dana and Jack’s 3-tier wedding cake, which included a white cake with raspberries, and Jack’s favorite – carrot cake! 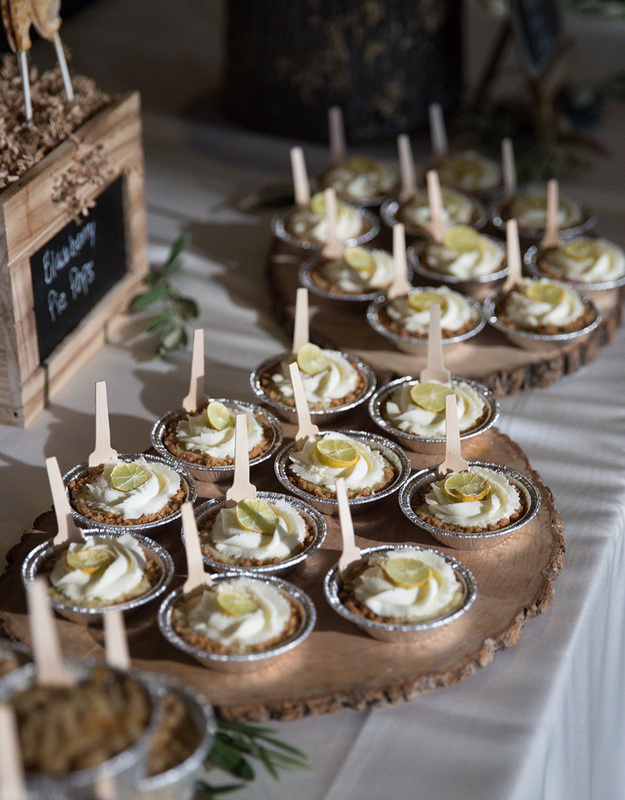 Four flavors of cupcakes were also baked with love. 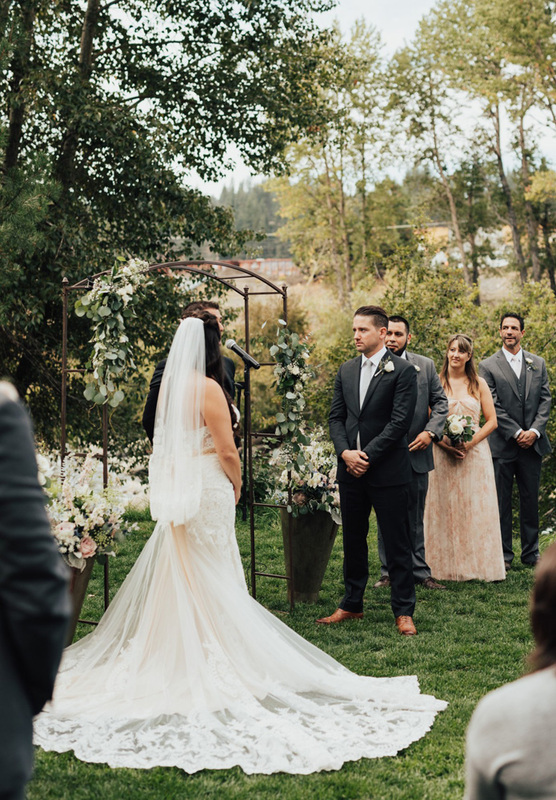 With rolling hills and oak trees surrounding the ceremony lawn, the prelude music started at 3:00pm as guests were seated. 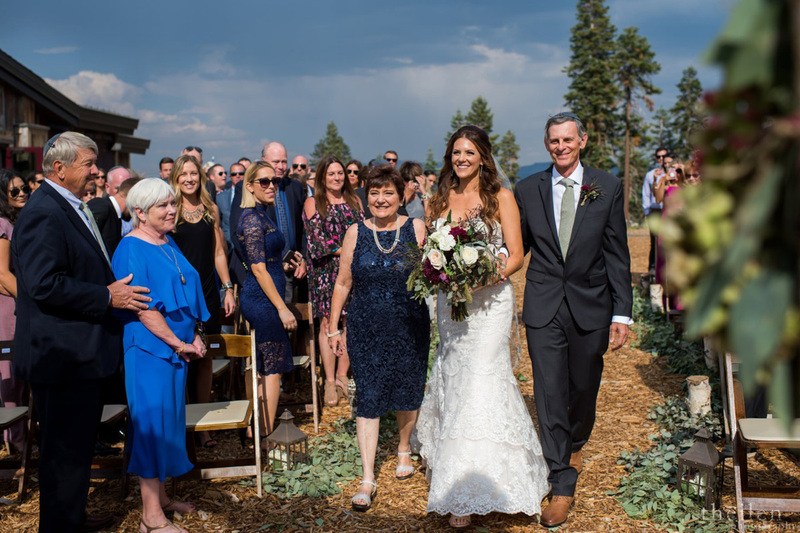 Dana was escorted down the aisle by her brother, as thoughts turned to her loving grandpa who originally was to accompany her. 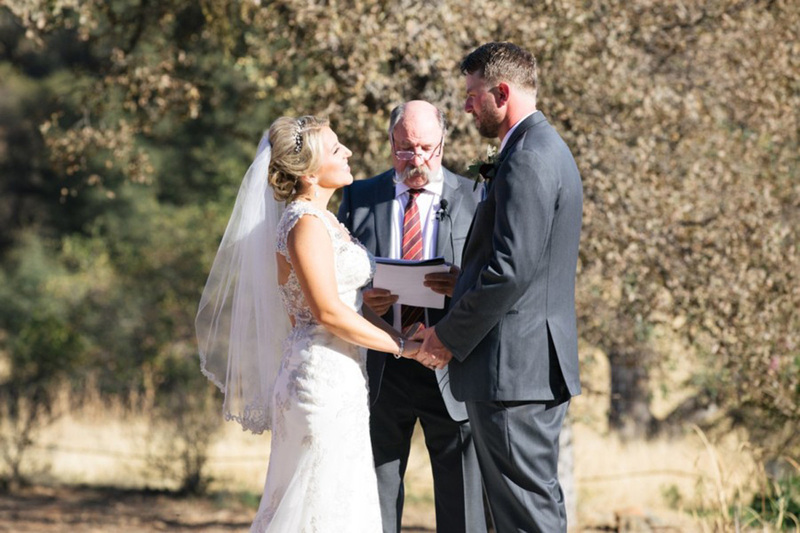 With her best friend’s dad officiating the ceremony, Dana and Jack exchanged vows that they wrote themselves. 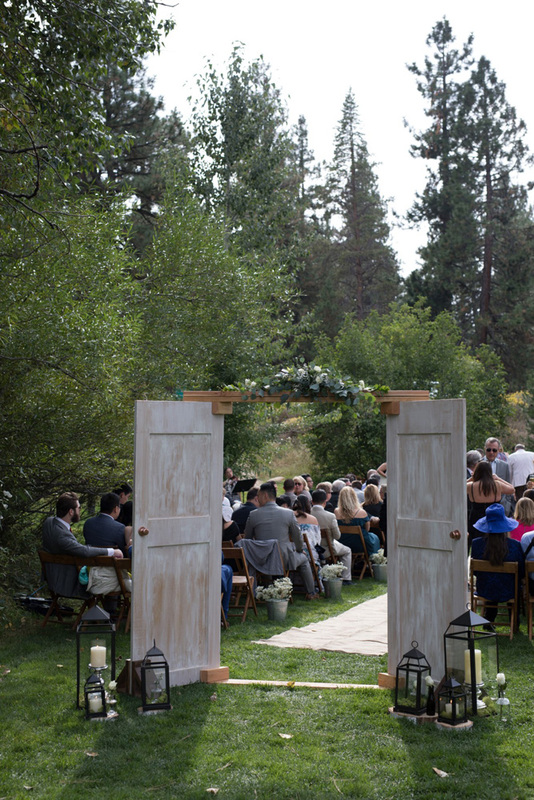 The cocktail reception immediately followed the ceremony and was adjacent to the ceremony lawn, underneath the oak trees. 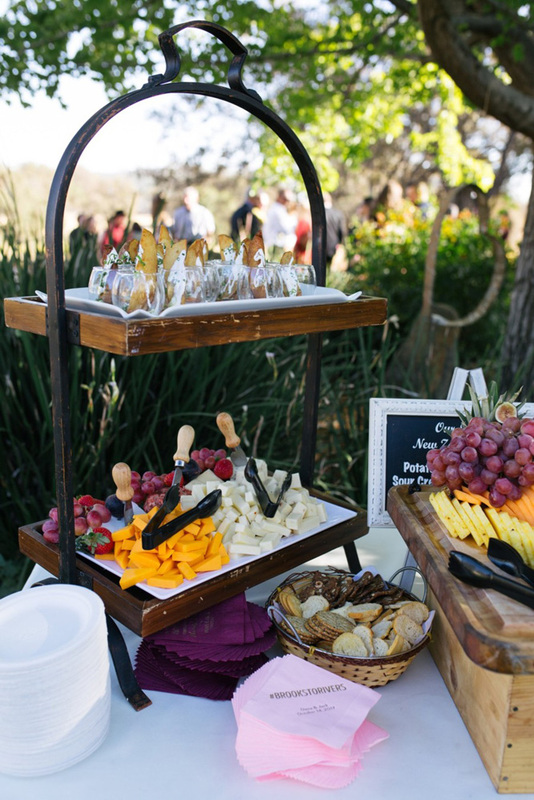 A food station featured the couple’s favorite New Zealand treat – an hors d’oeuvre of potato wedges topped with sour cream and sweet chili sauce – which all of the guests loved. 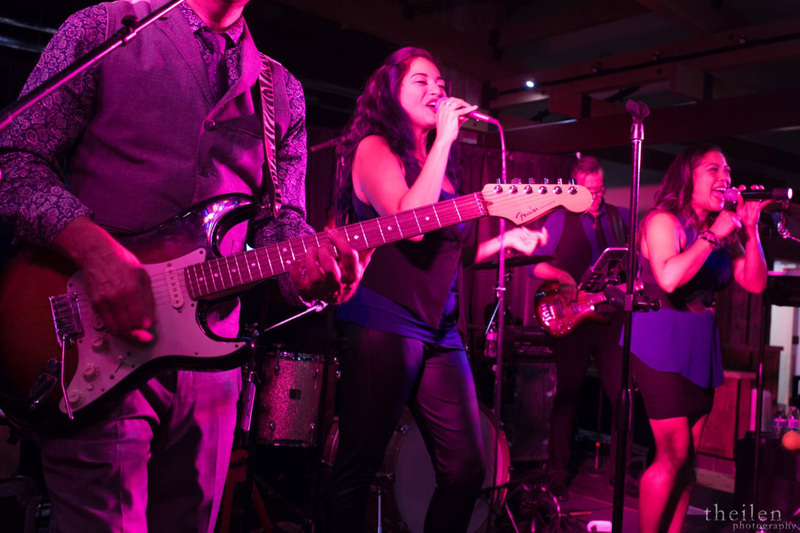 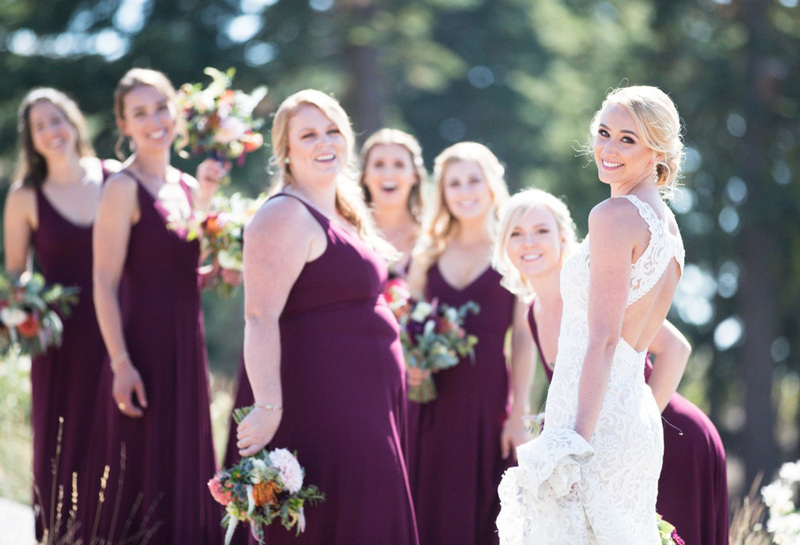 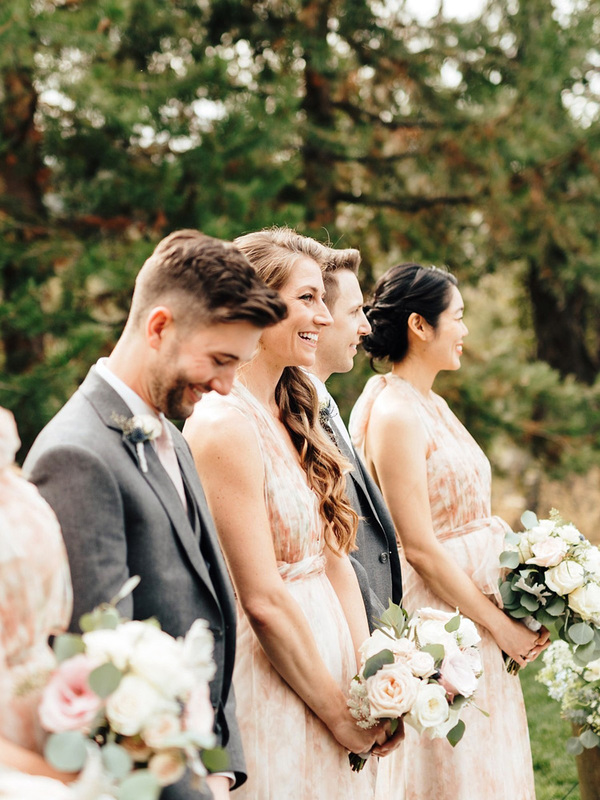 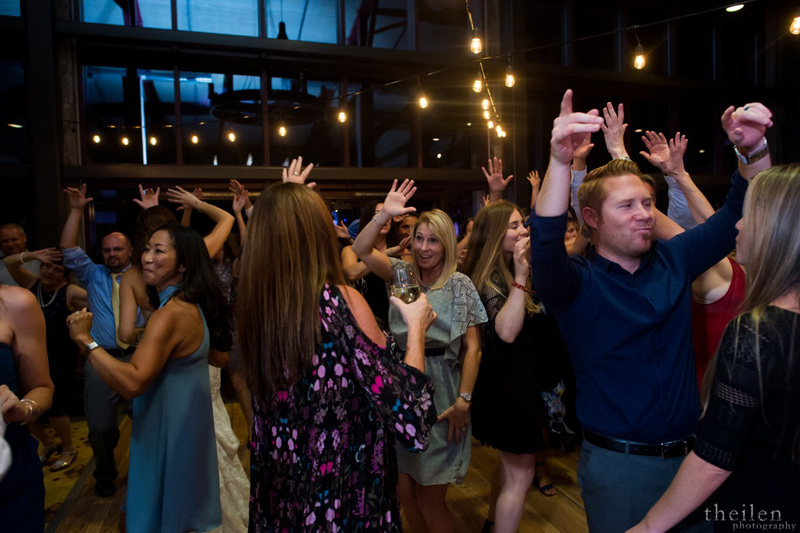 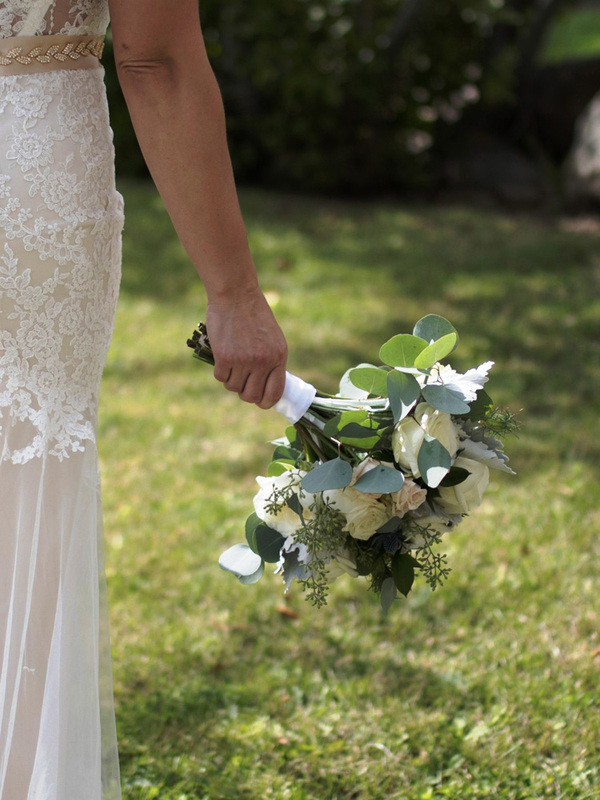 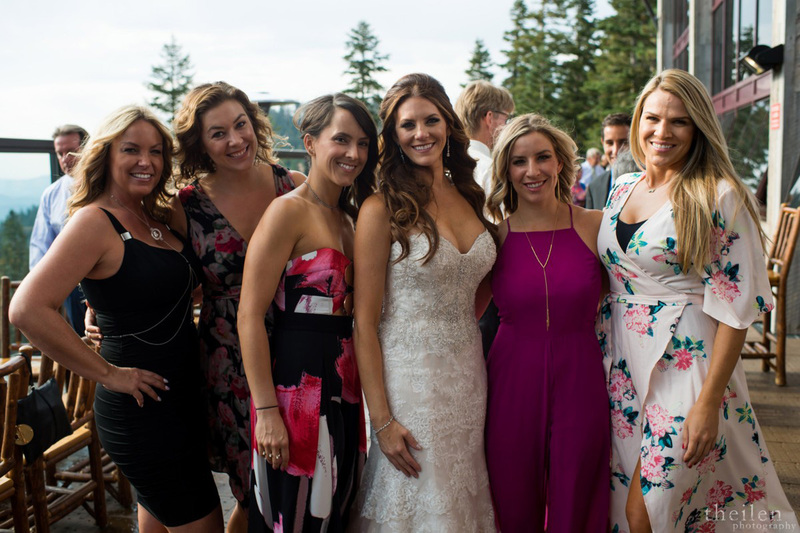 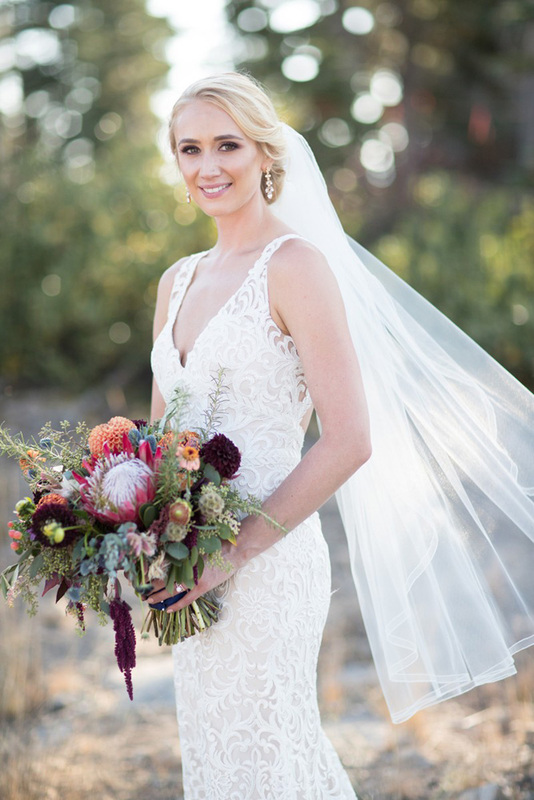 Dana has worked for 6 years at the Tahoe Mountain Club, and now that she has been a bride, she feels like she can relate better to her couples. 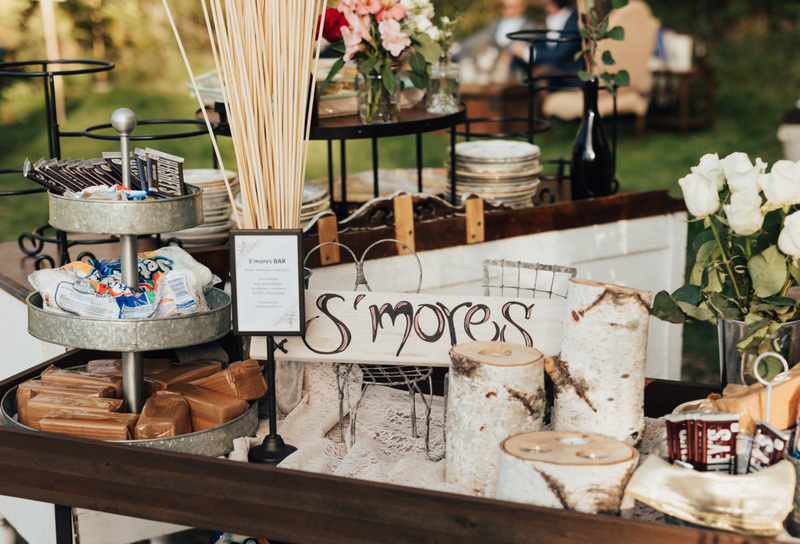 When it comes to selecting vendors for your wedding, Dana recommends that you make sure prospective vendors are really listening to you and offering you custom responses. 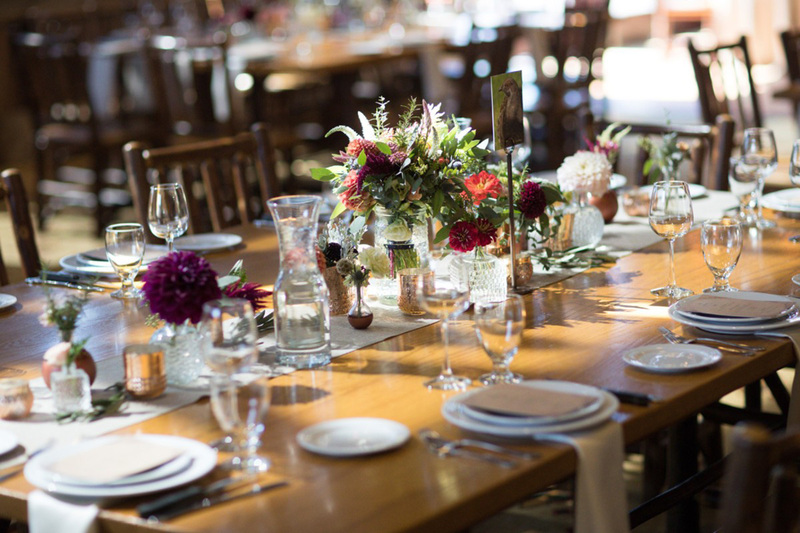 Look for service providers that respond to you promptly. 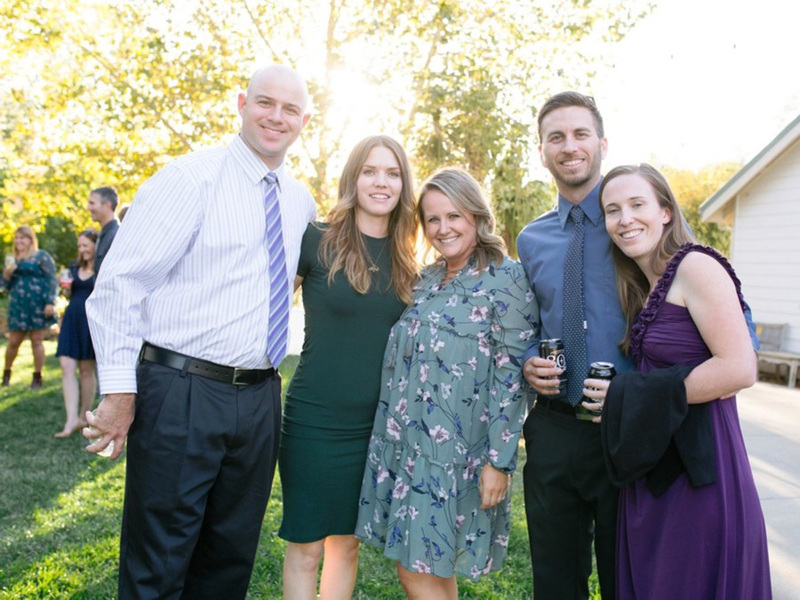 Choose service providers who have years of experience and know what they are doing. 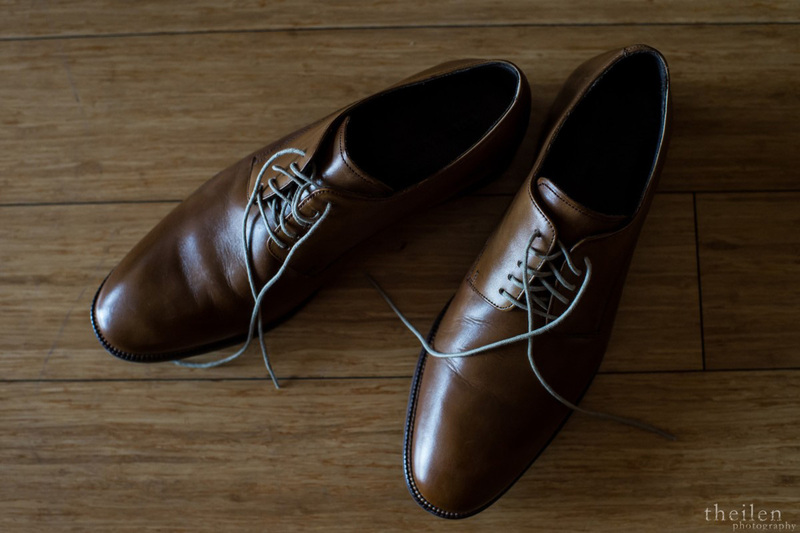 Don’t just go with the lowest price, because you get what you pay for! 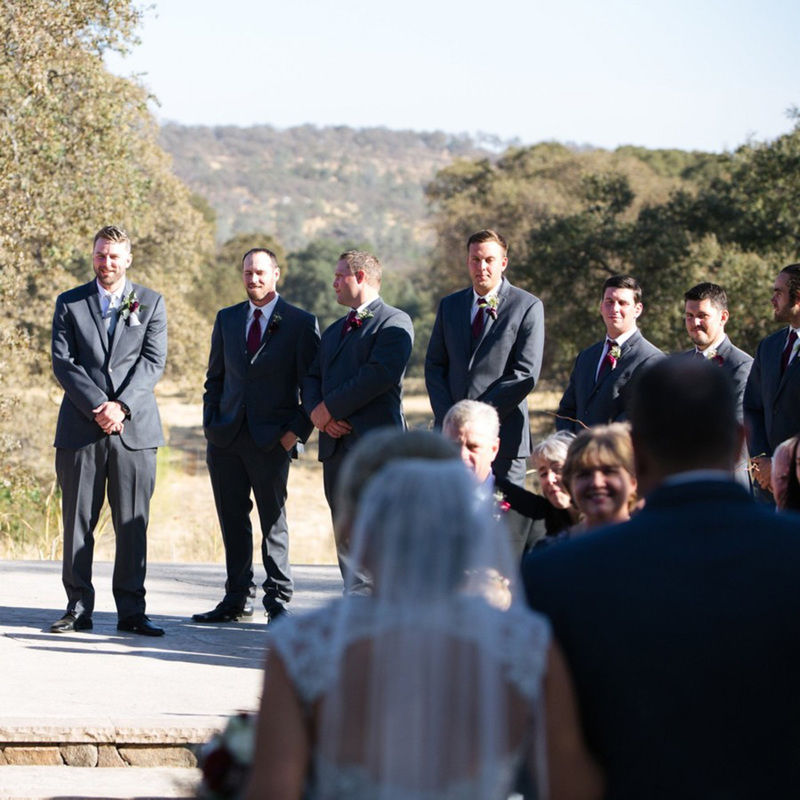 Finally, Dana understands that during the planning process, your friends and family may voice their opinions. 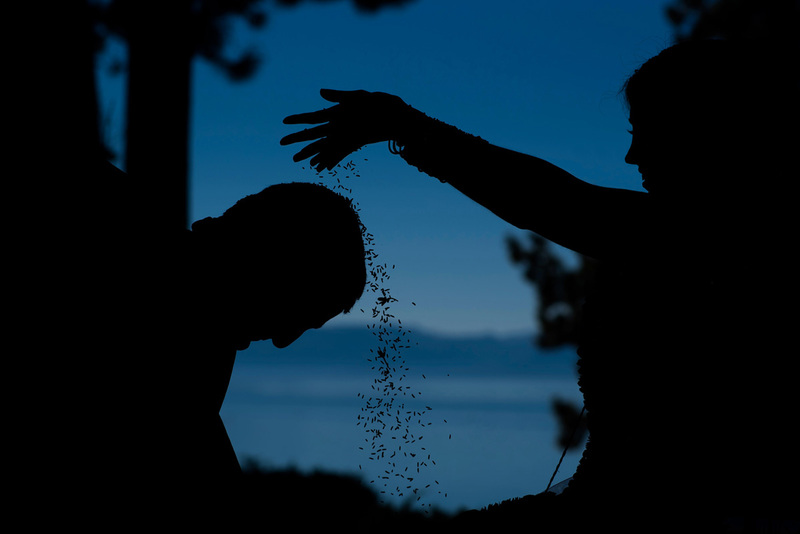 But she recommends not letting the ideas of others affect you. 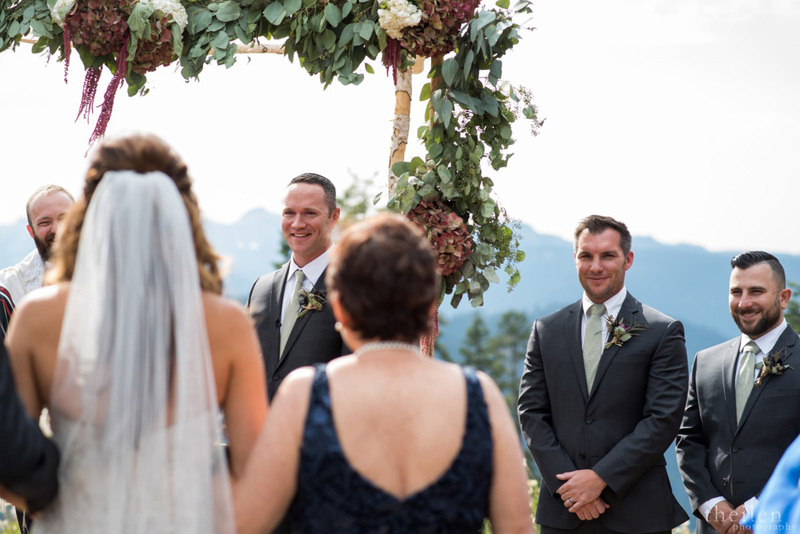 It is your wedding day, so take pride in what you are planning, and have trust in your vendors to give you the most amazing day of your life!